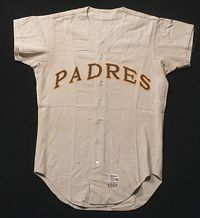 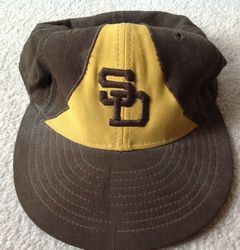 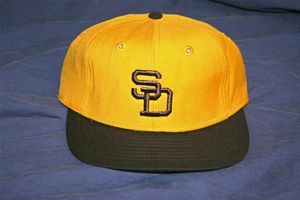 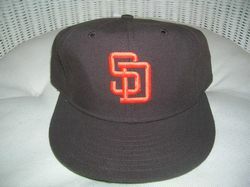 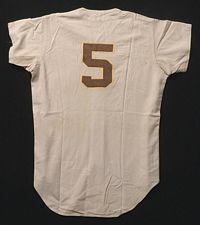 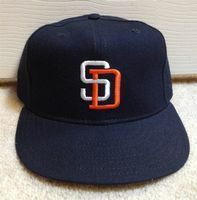 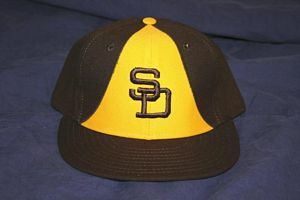 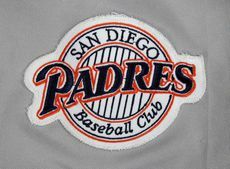 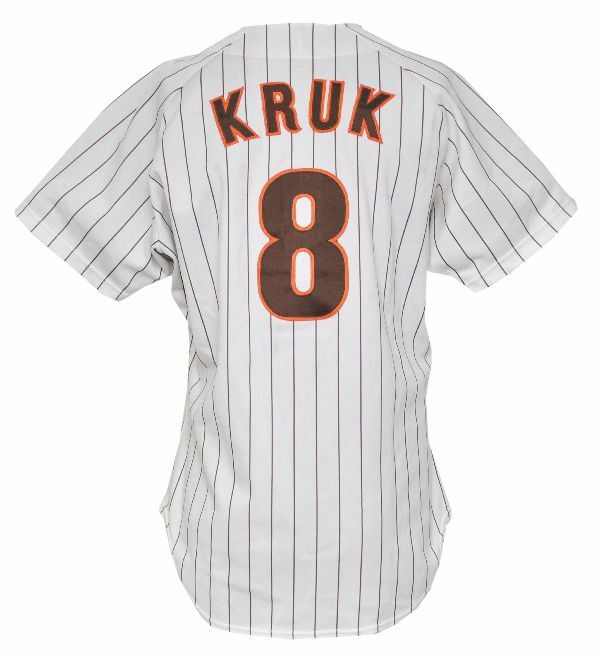 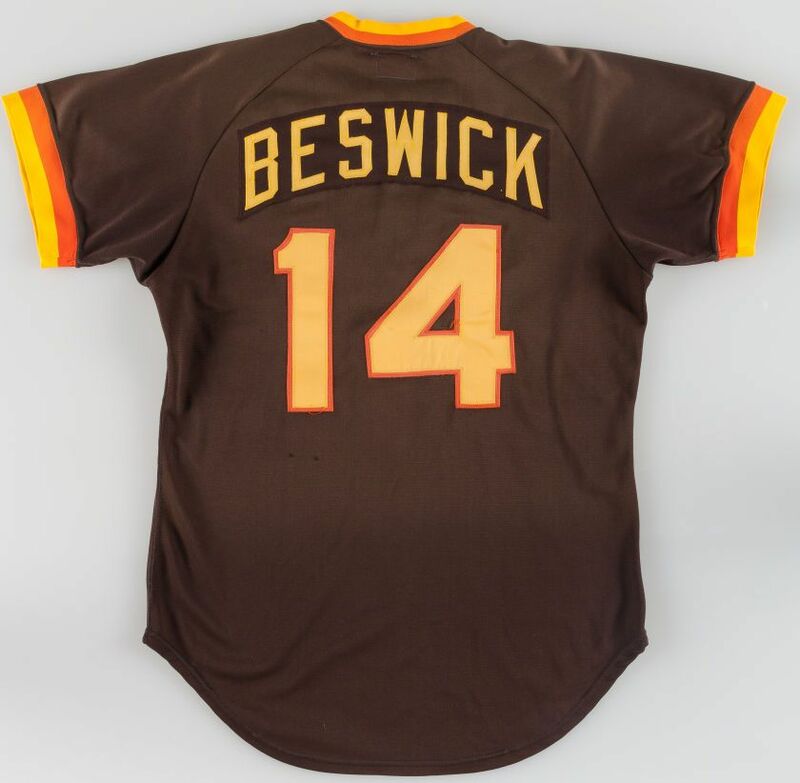 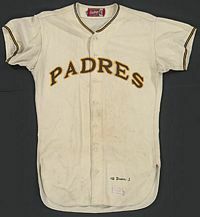 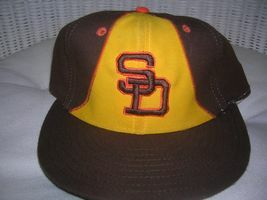 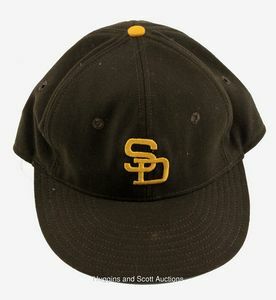 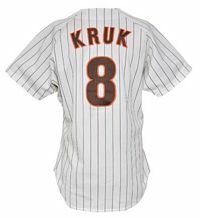 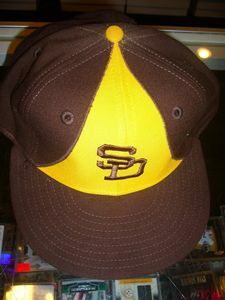 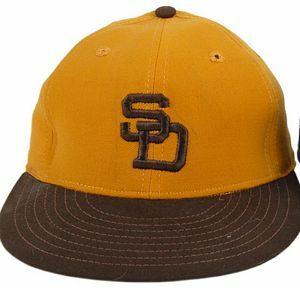 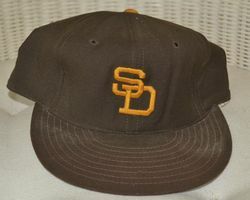 When expansion brings a team to San Diego for the 1969 season the Padres become the first team to use brown since the 1953 St. Louis Browns. 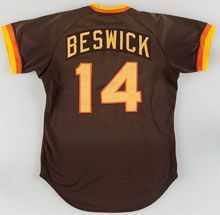 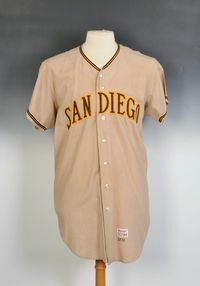 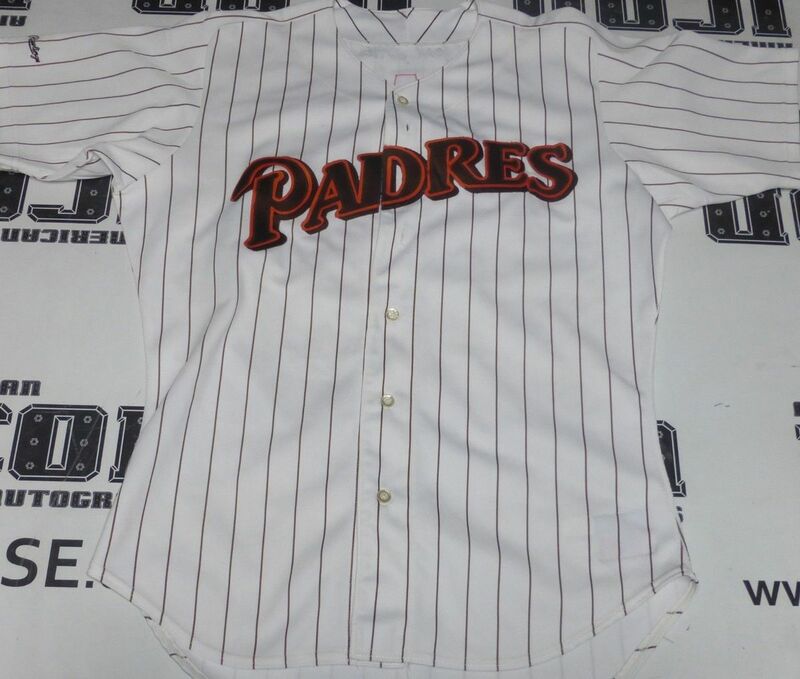 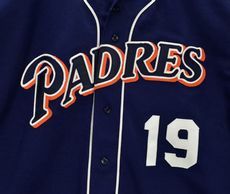 The Padres use a generic tan jersey without trim as the spring training jersey both home and away. 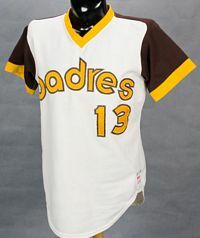 I'm showing the spring jersey because we'll see it again below. 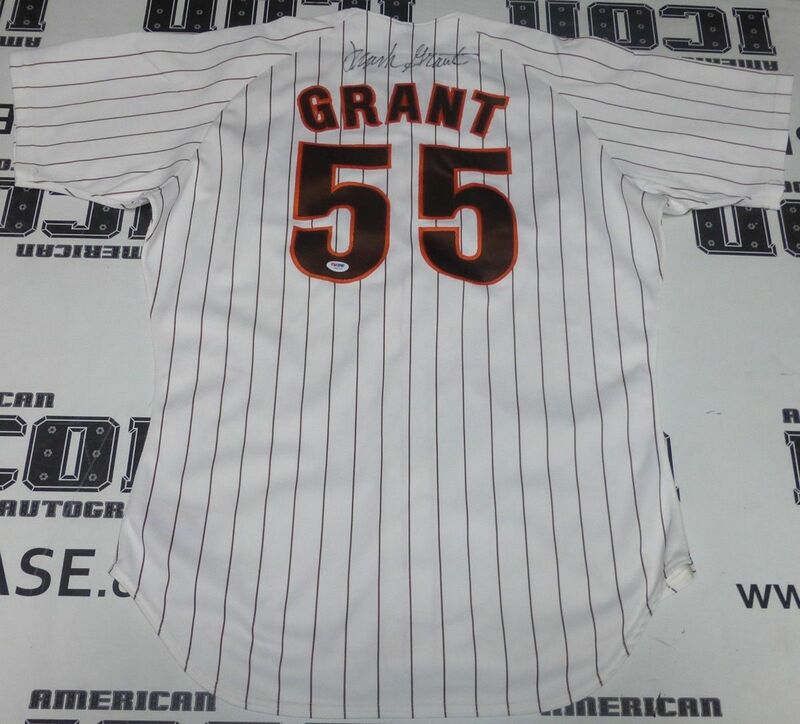 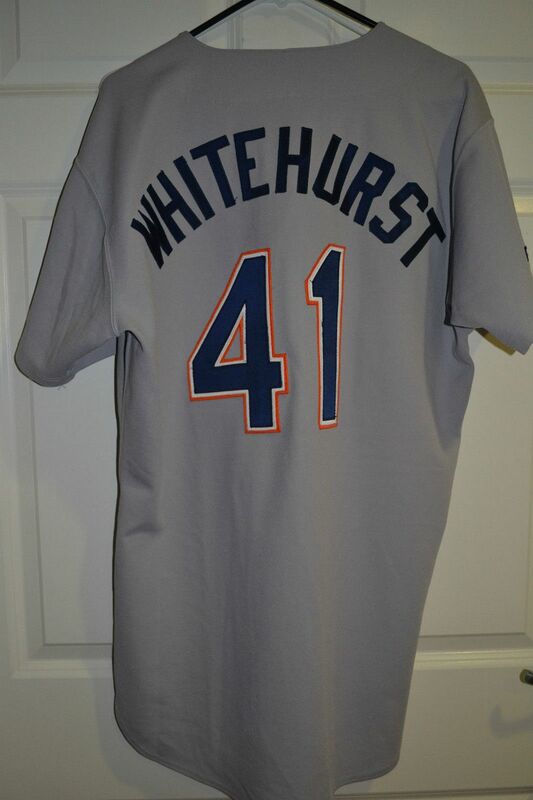 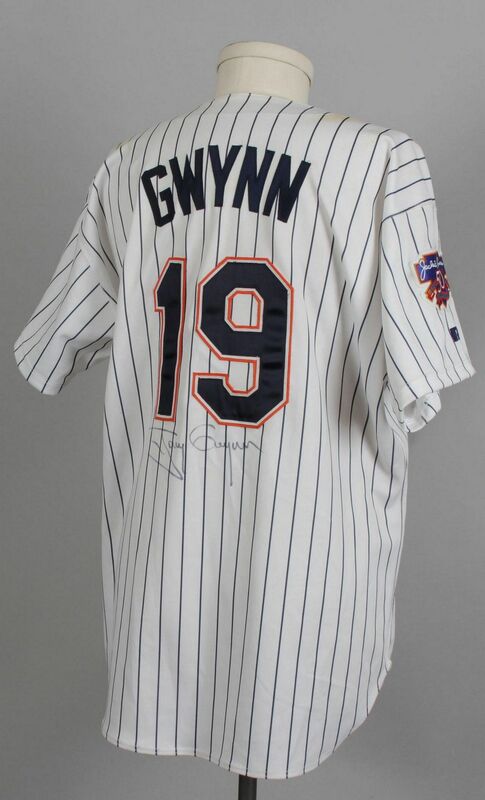 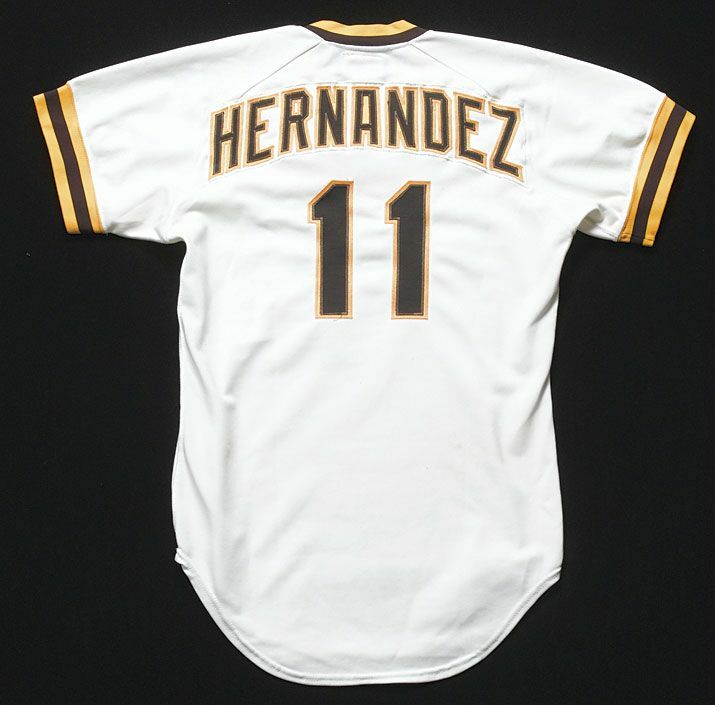 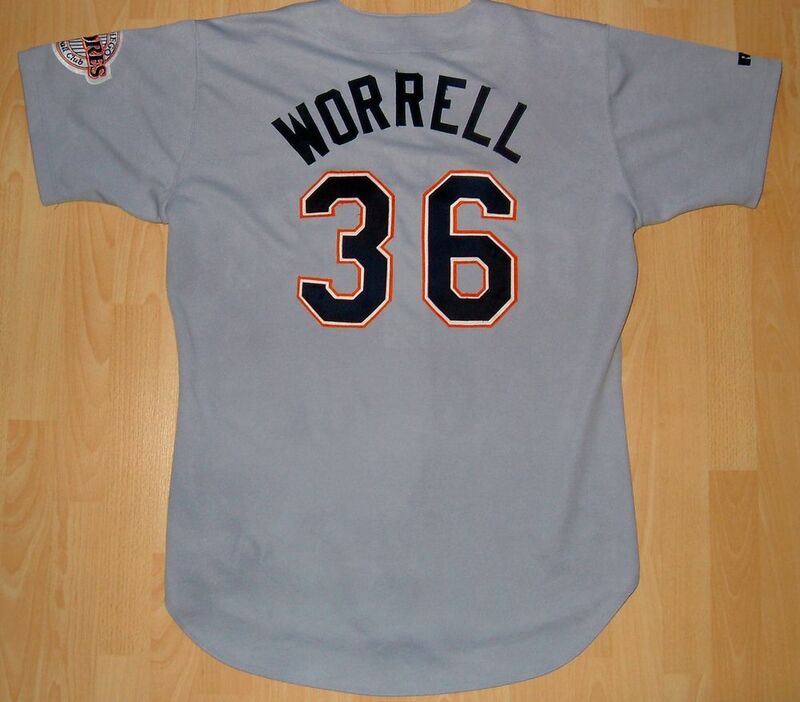 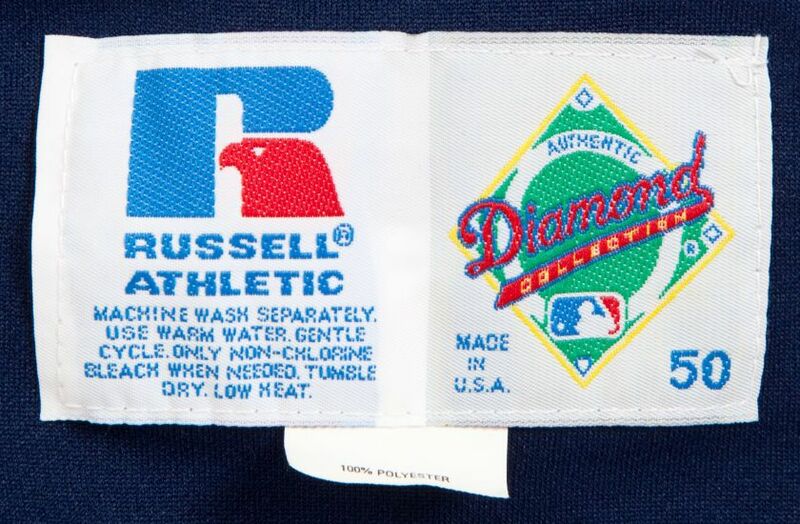 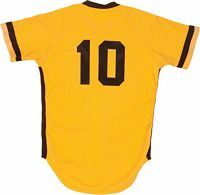 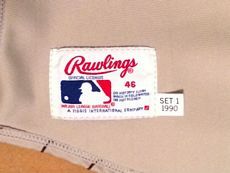 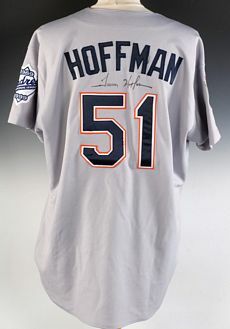 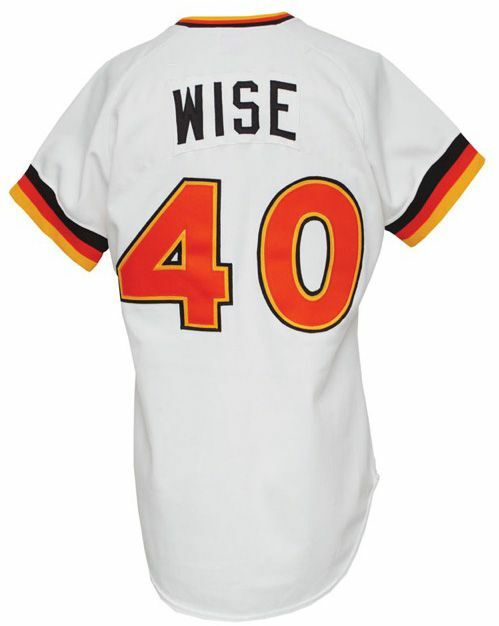 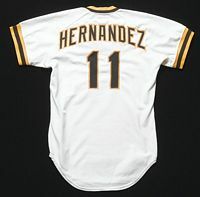 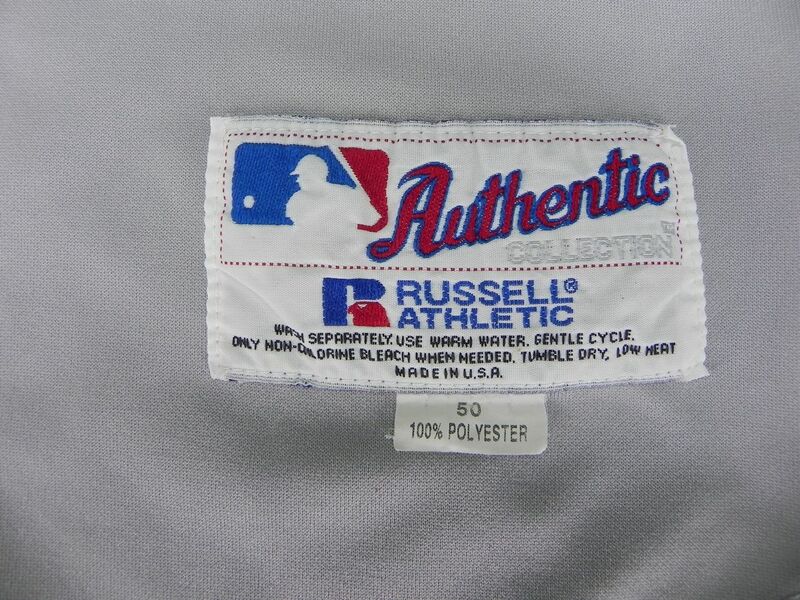 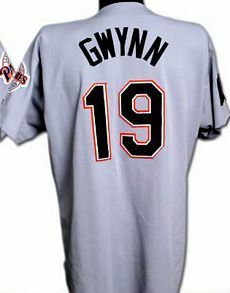 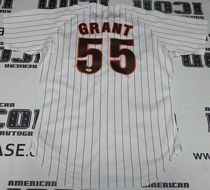 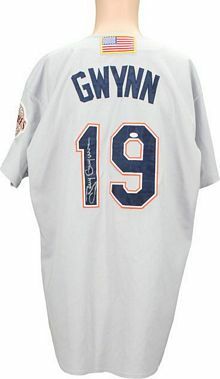 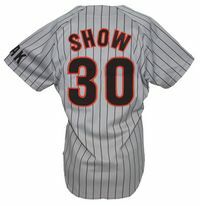 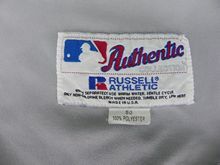 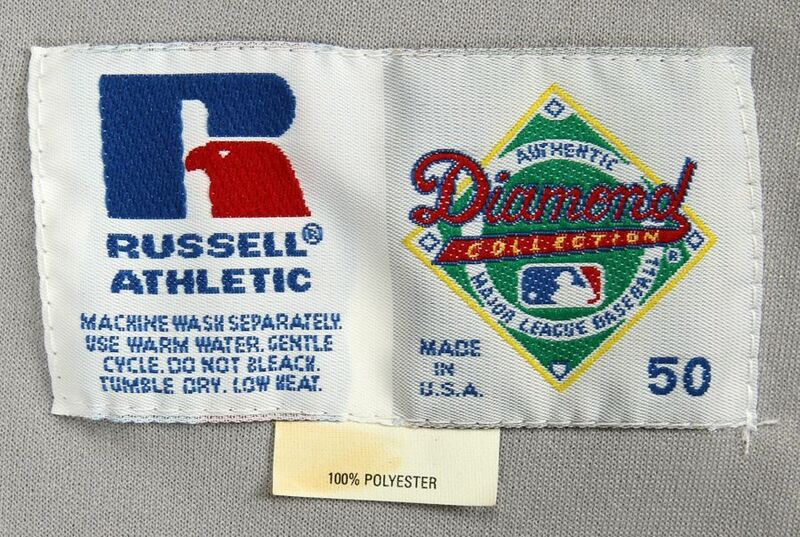 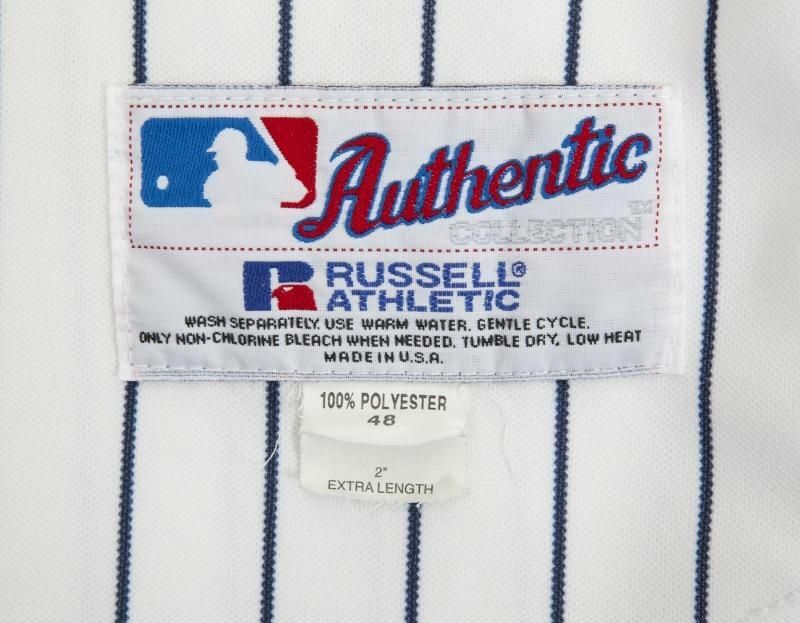 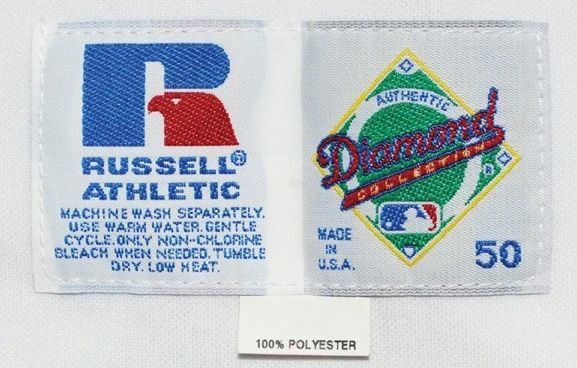 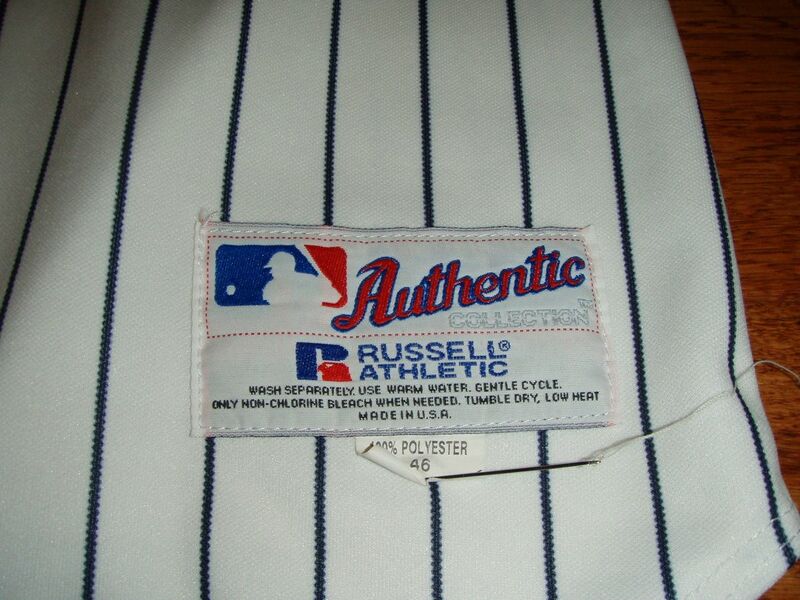 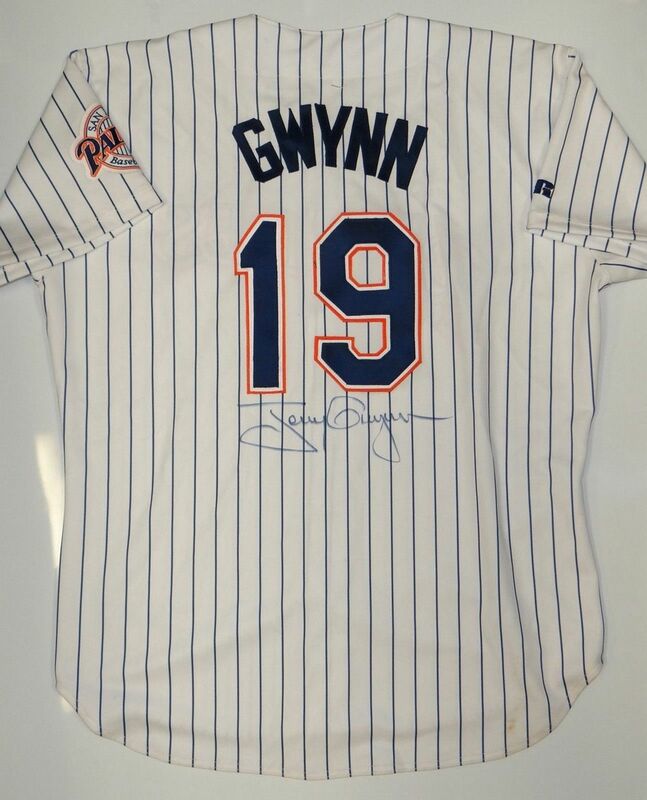 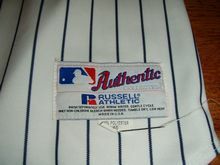 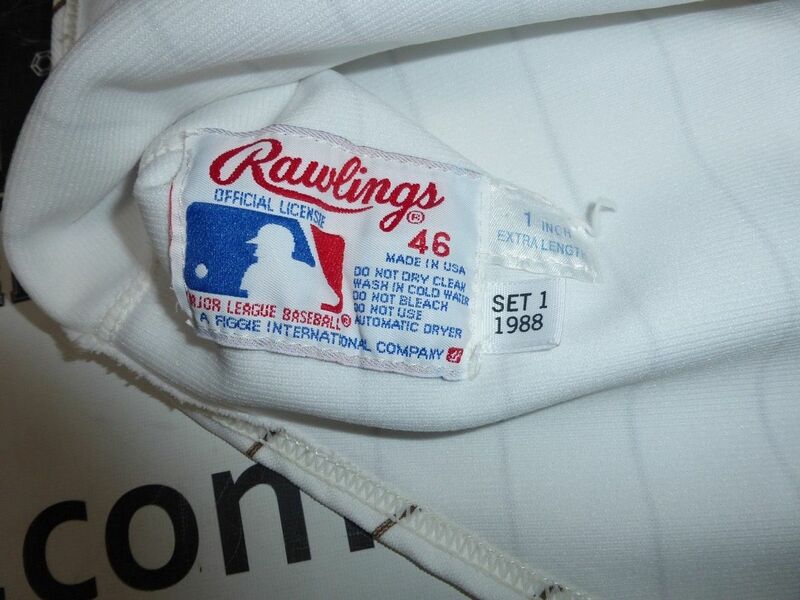 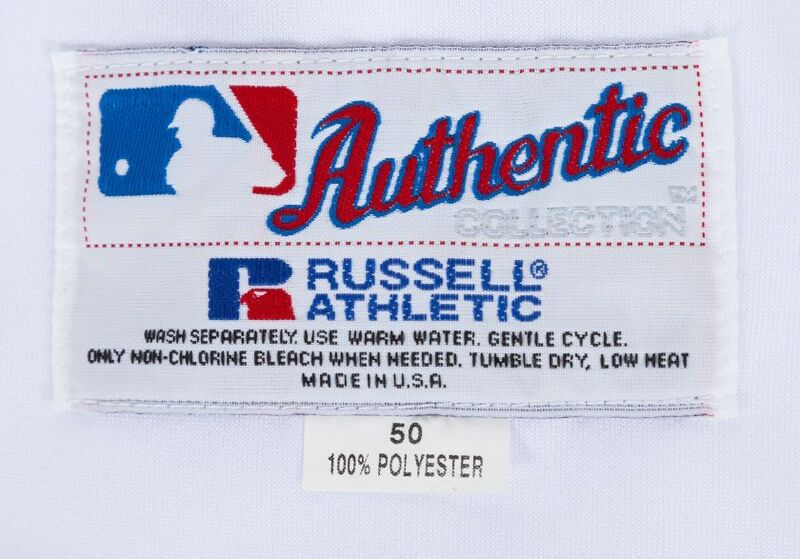 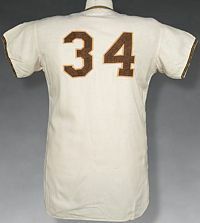 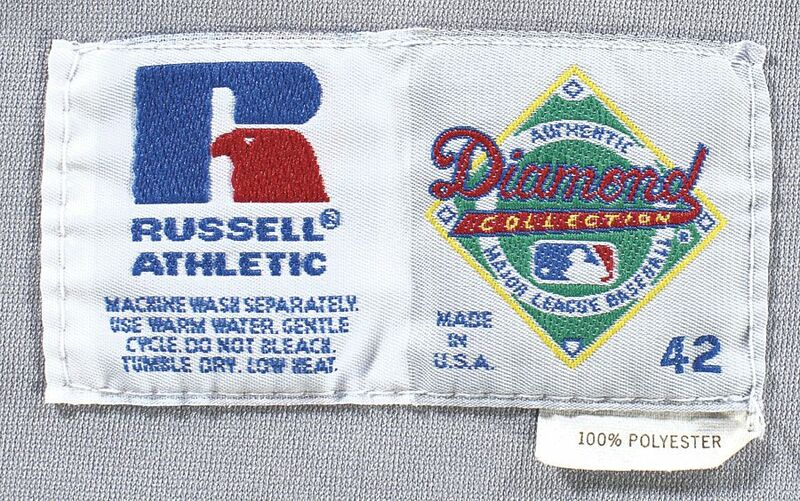 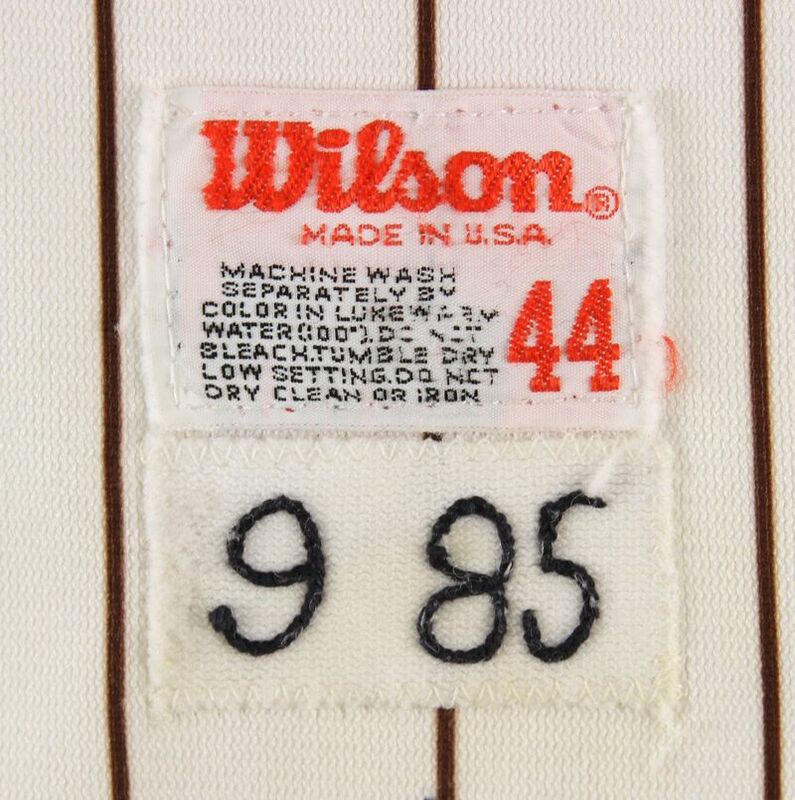 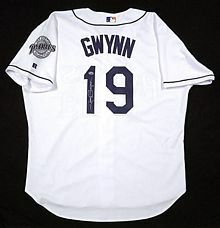 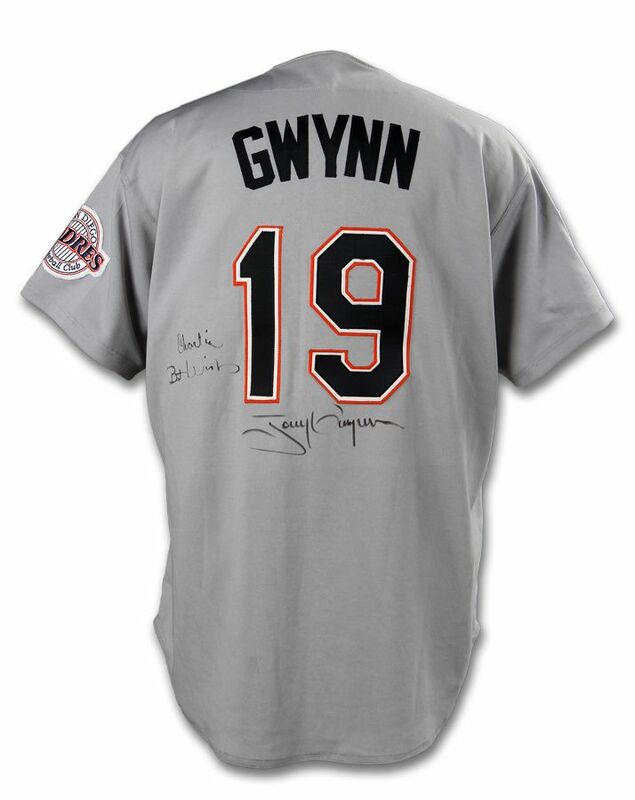 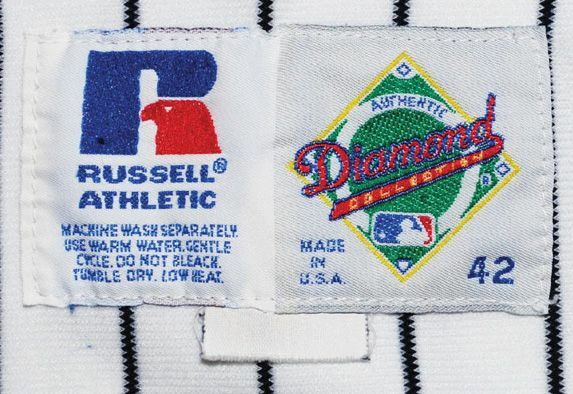 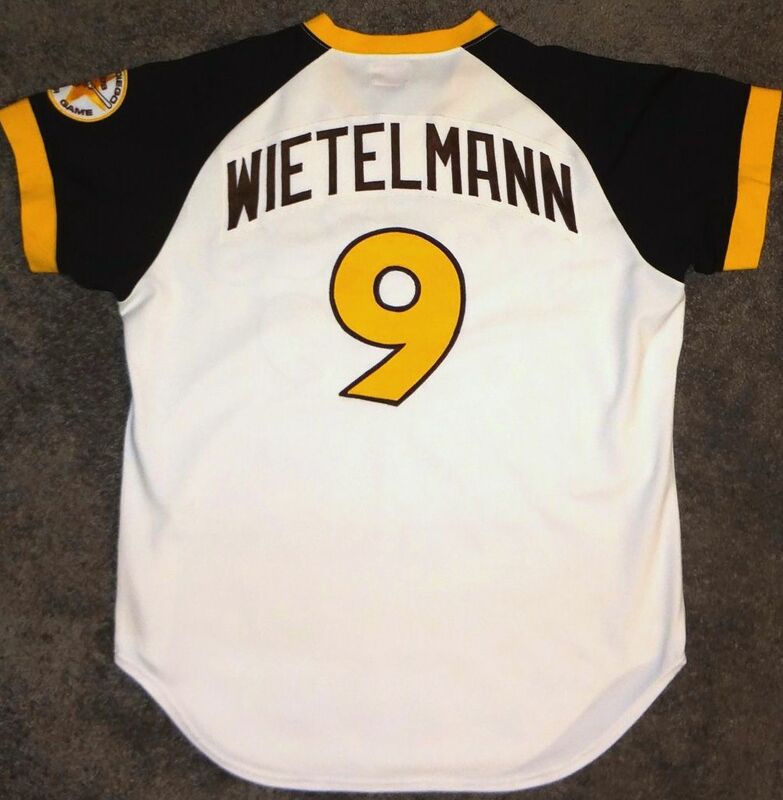 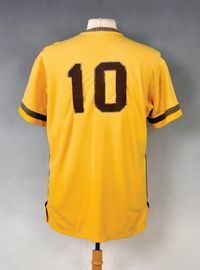 Home jerseys had the MLB 100th Anniversary patch on the left sleeve and had trim on the collar and sleeves. 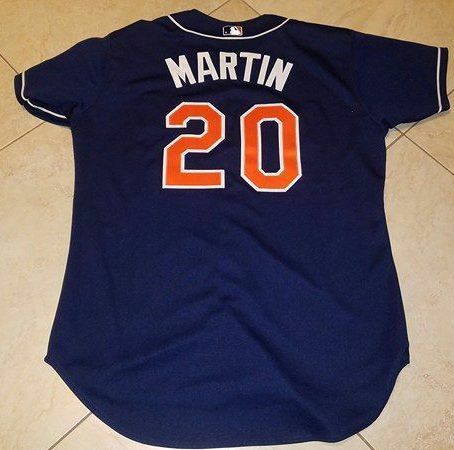 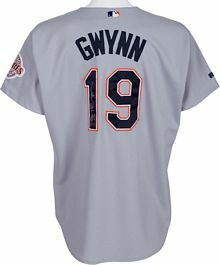 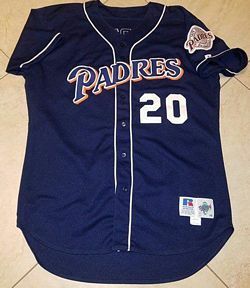 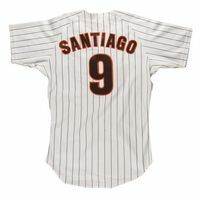 The spring training jerseys - with the wordmark changed to "SAN DIEGO" and the San Diego 200th Anniversary patch added and no MLB patch - become the road jerseys. 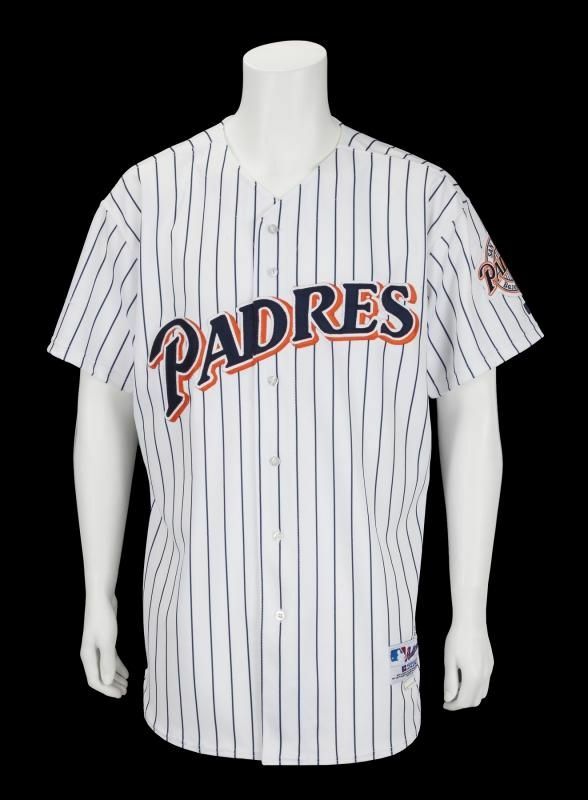 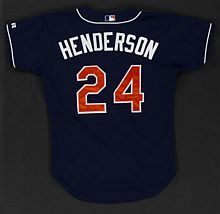 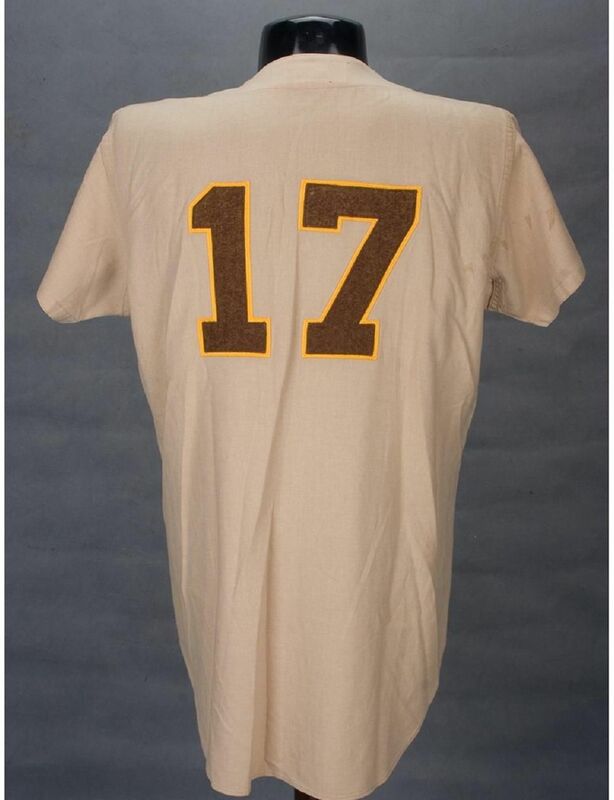 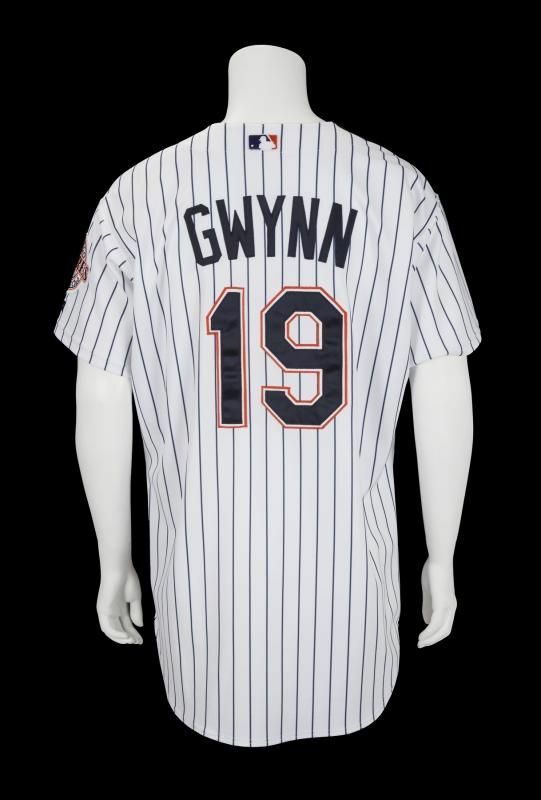 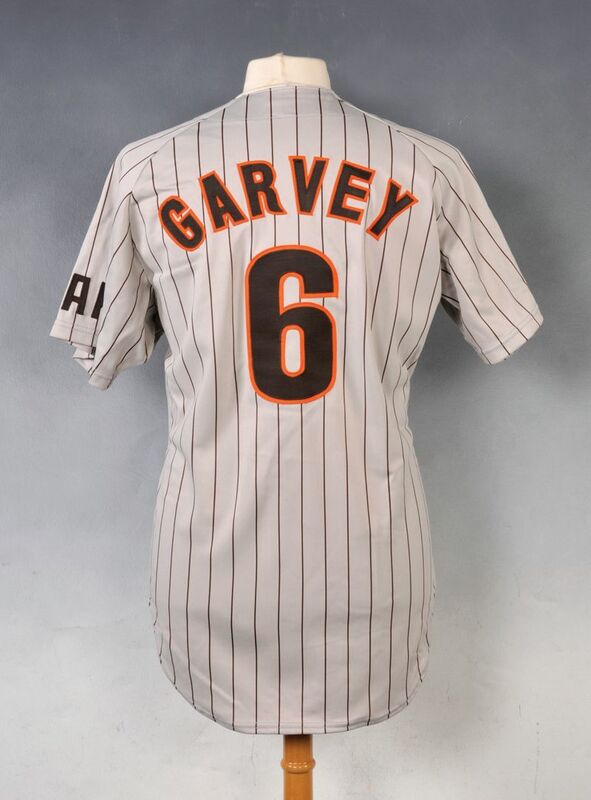 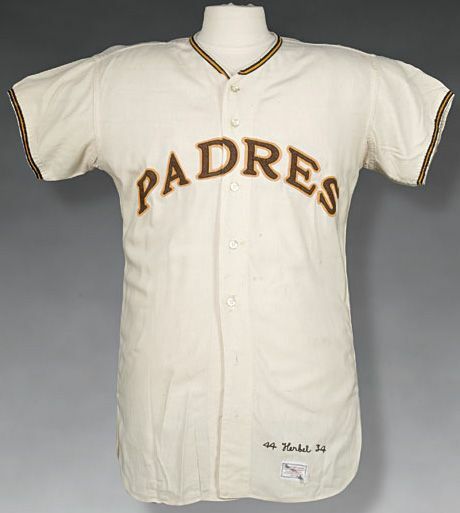 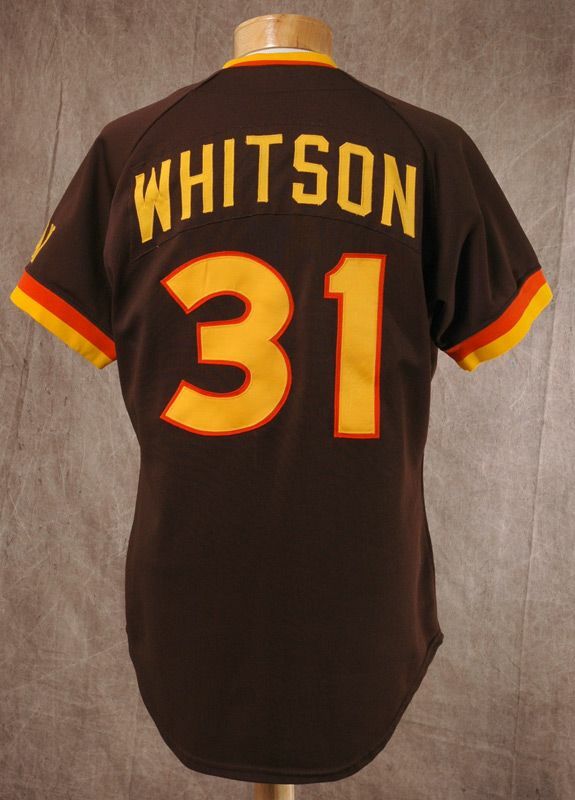 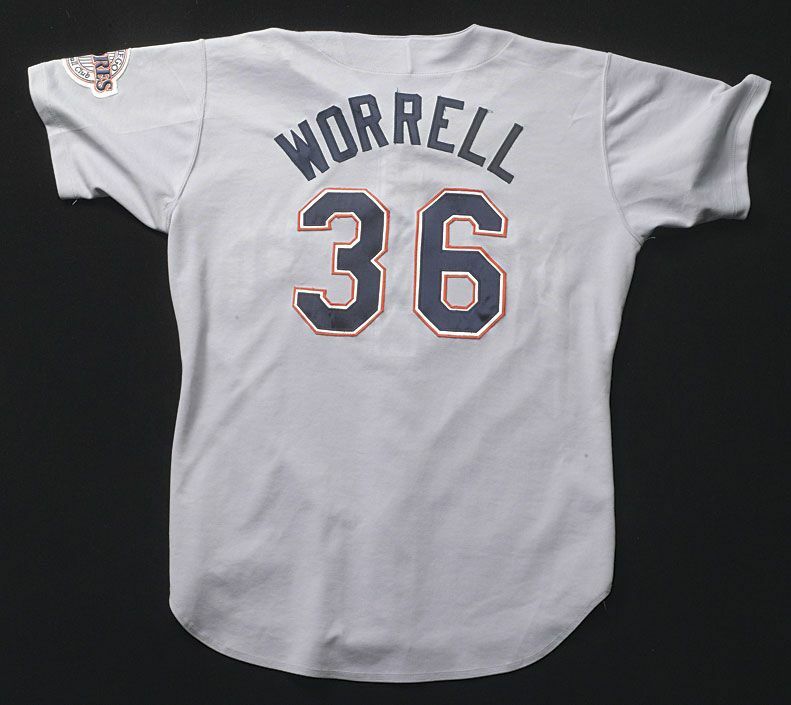 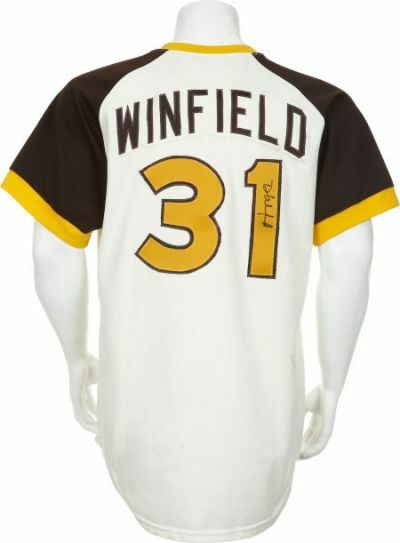 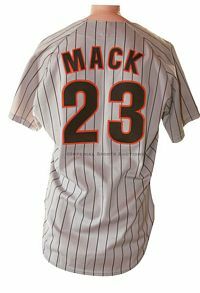 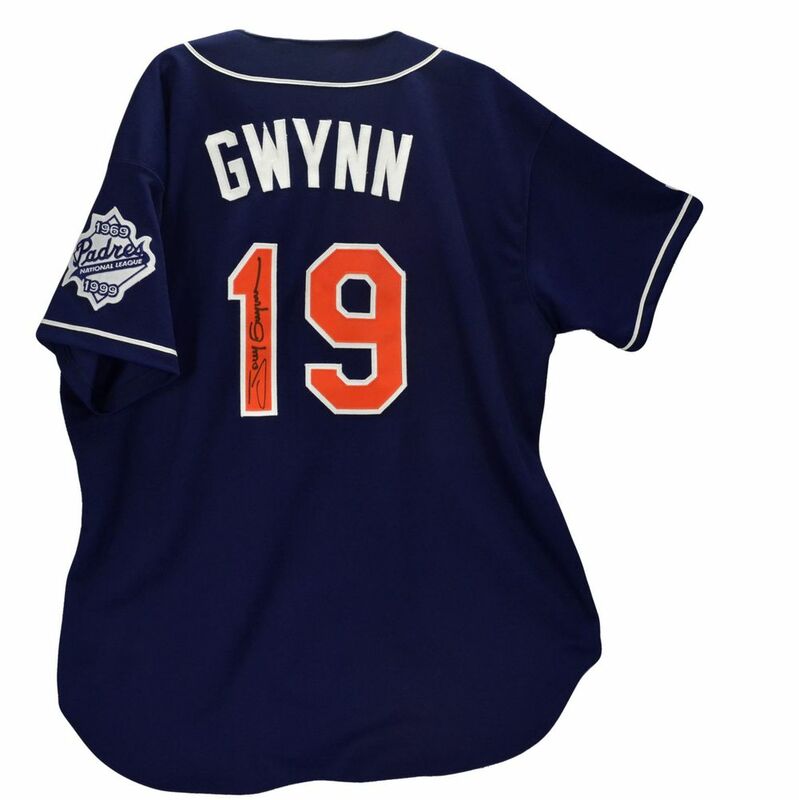 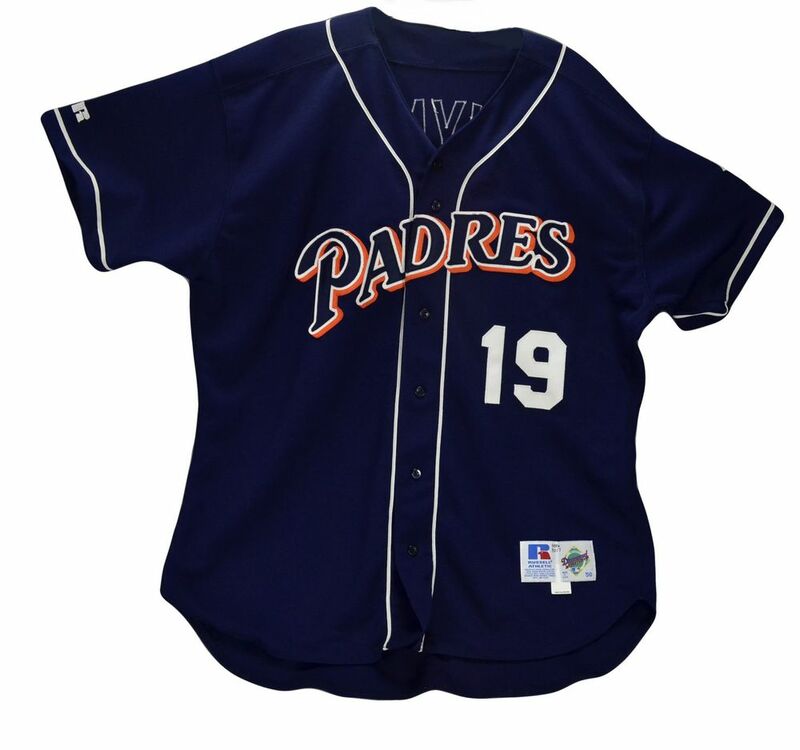 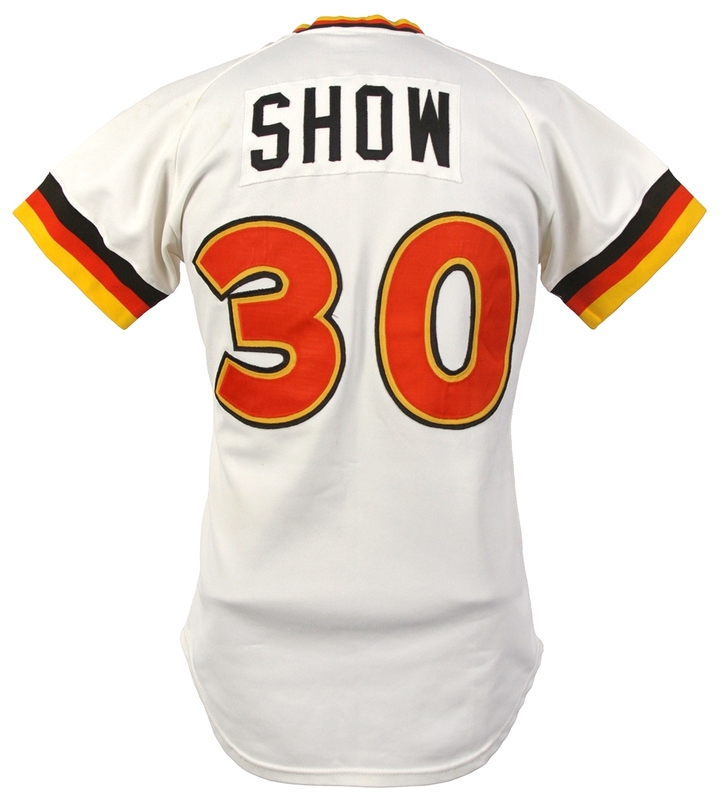 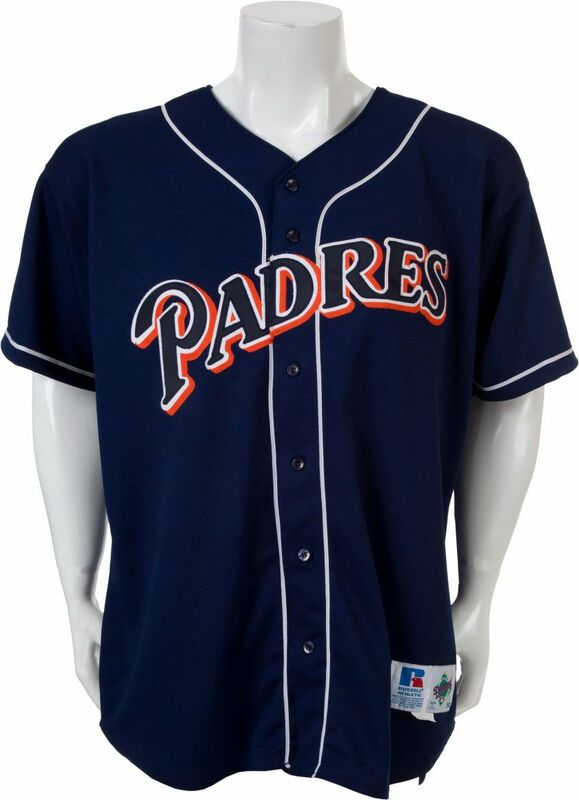 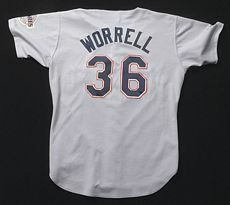 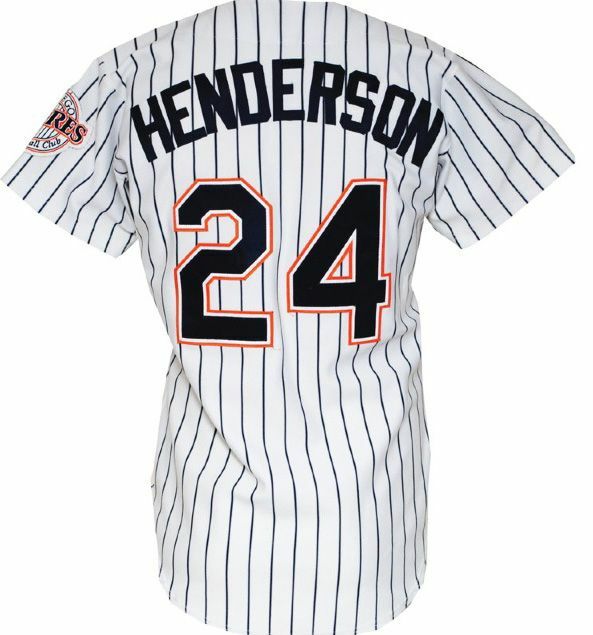 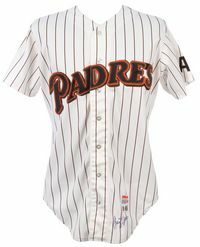 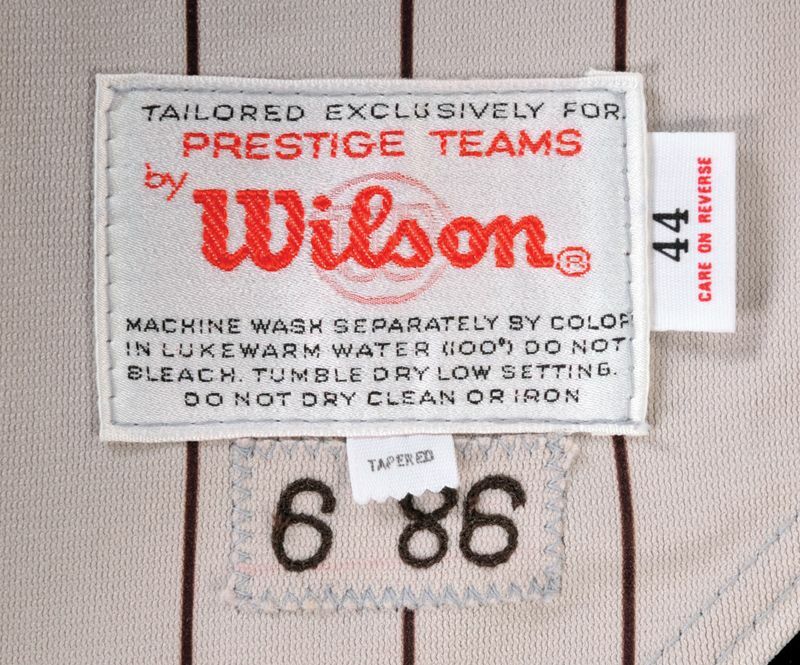 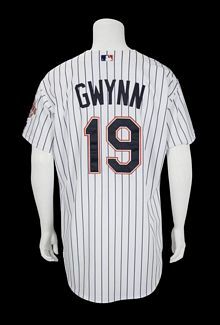 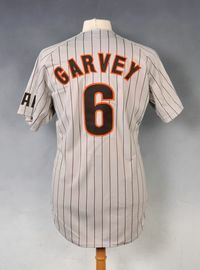 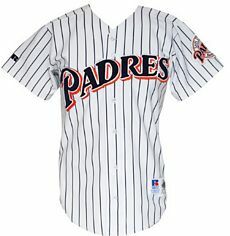 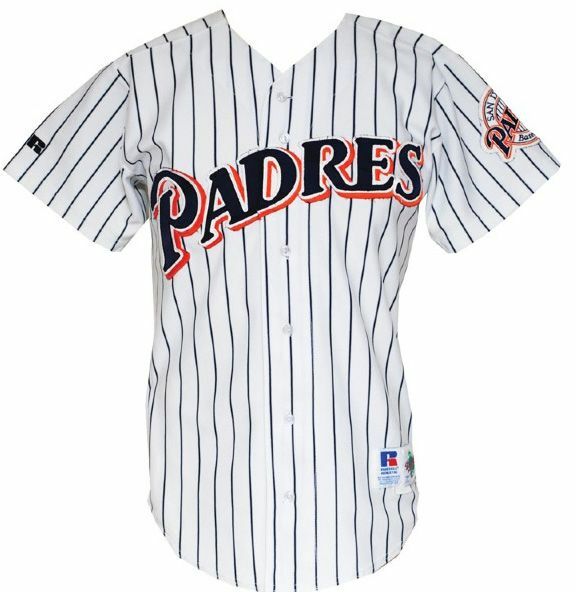 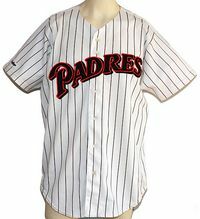 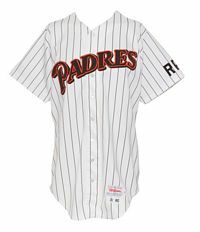 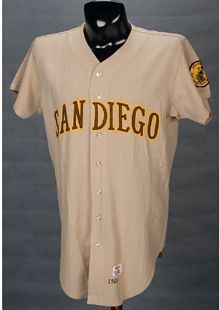 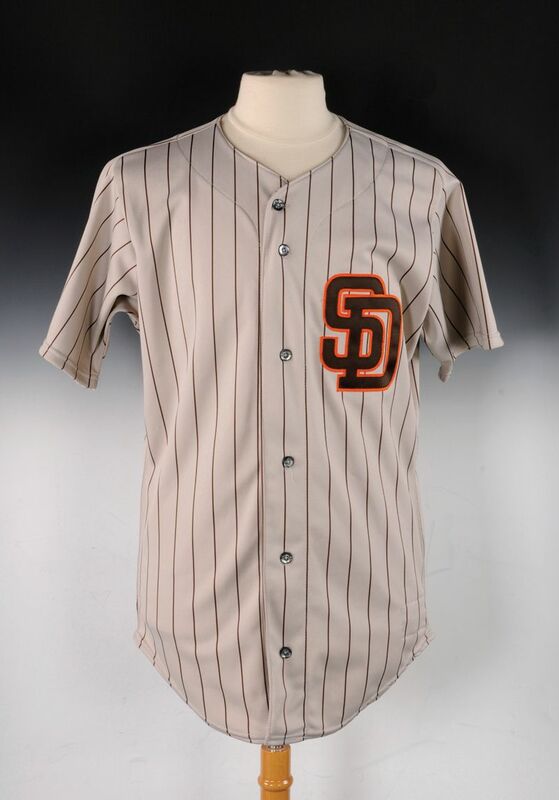 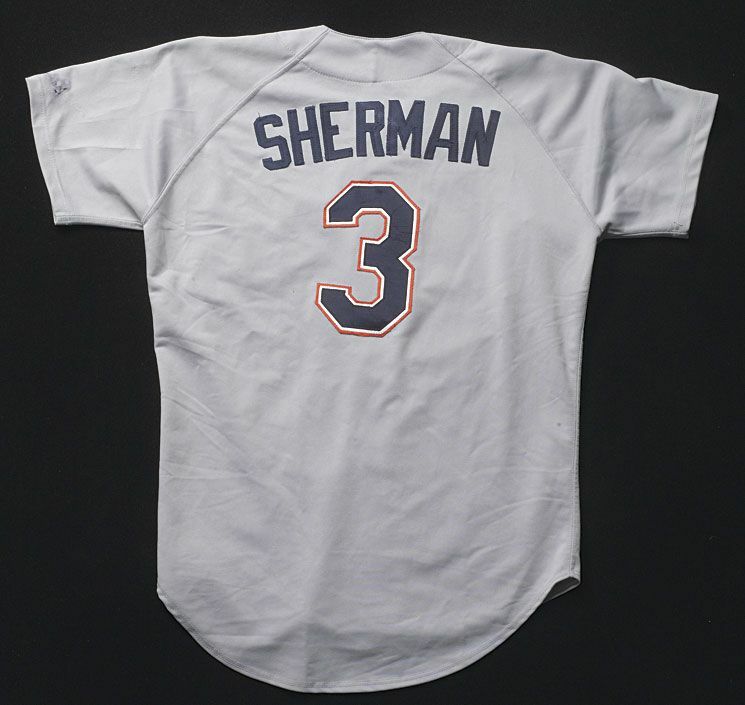 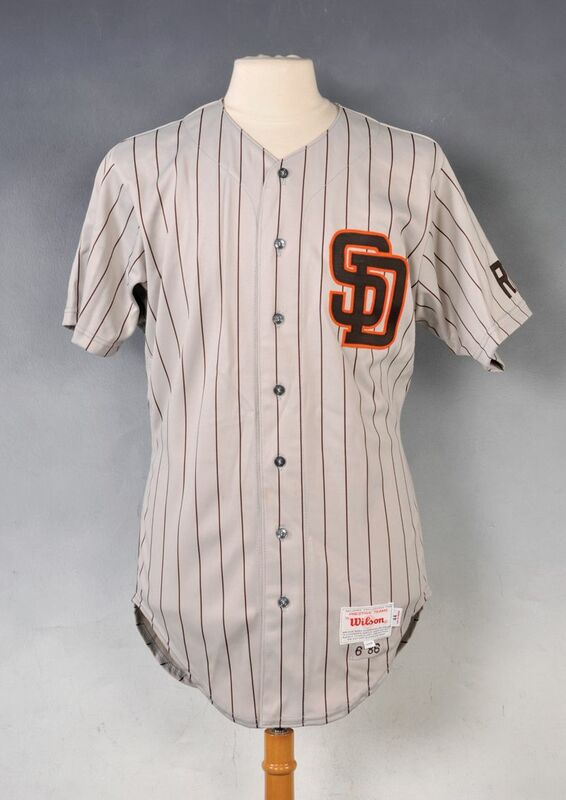 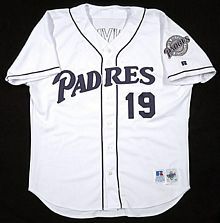 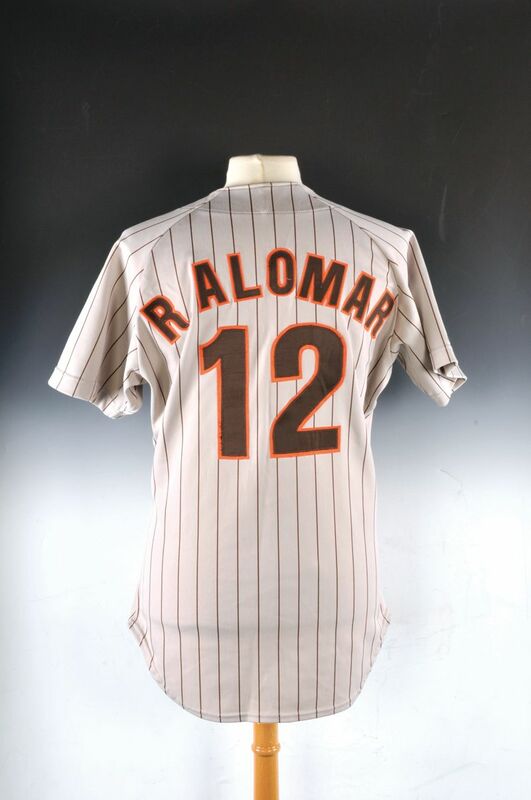 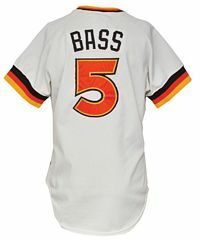 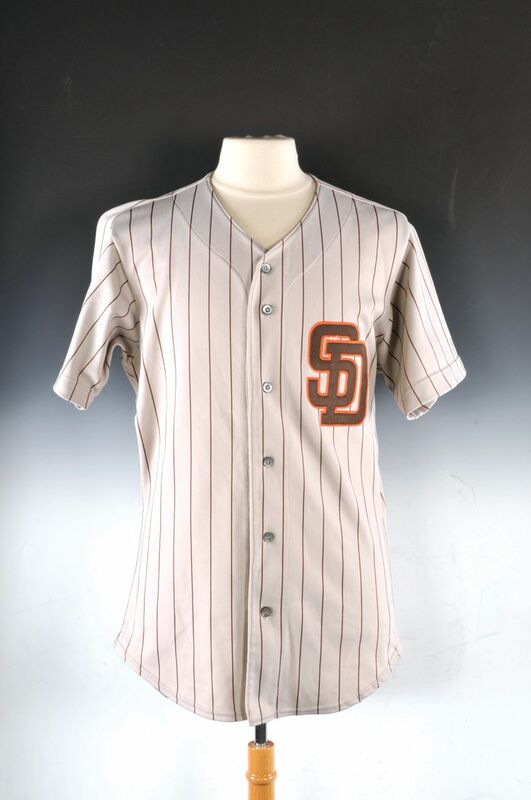 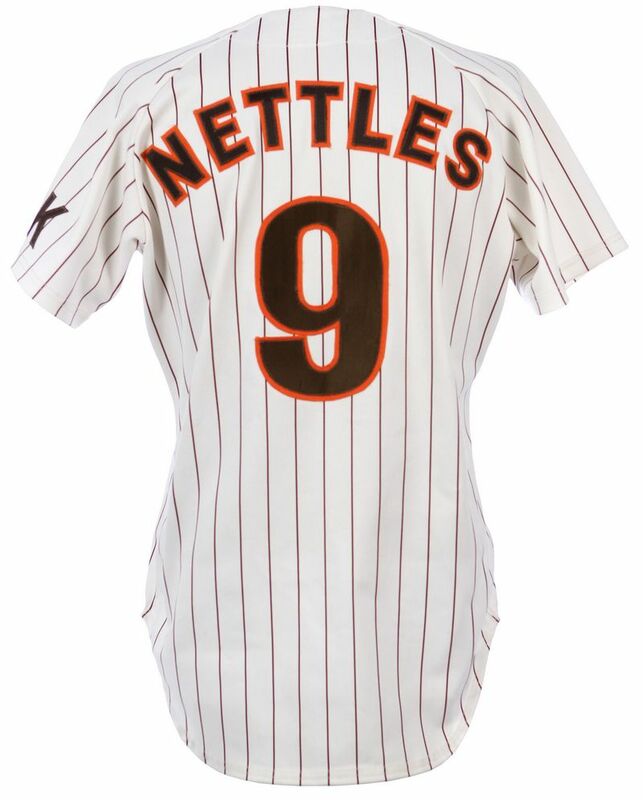 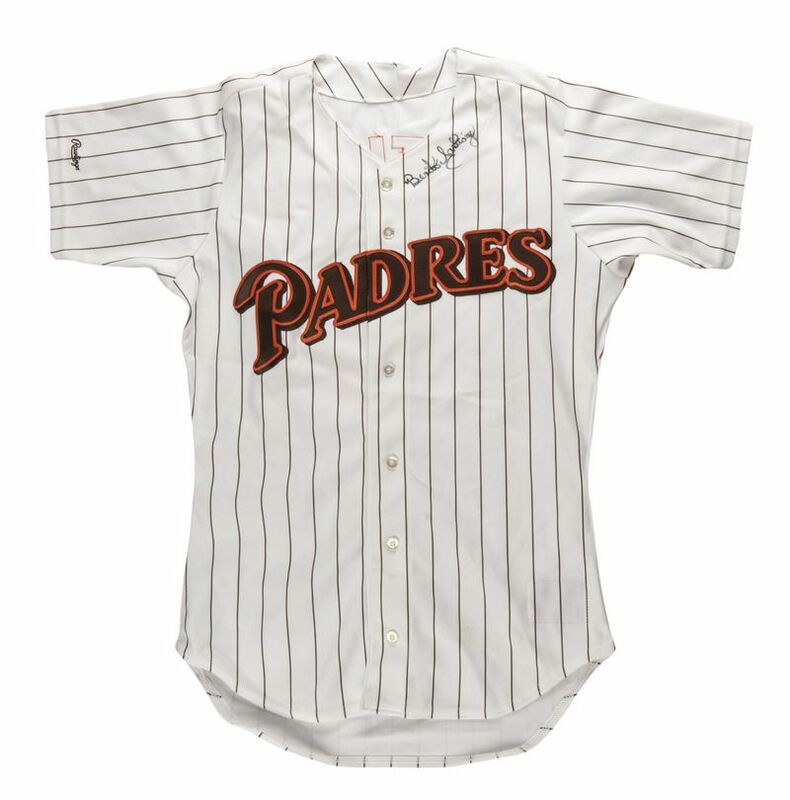 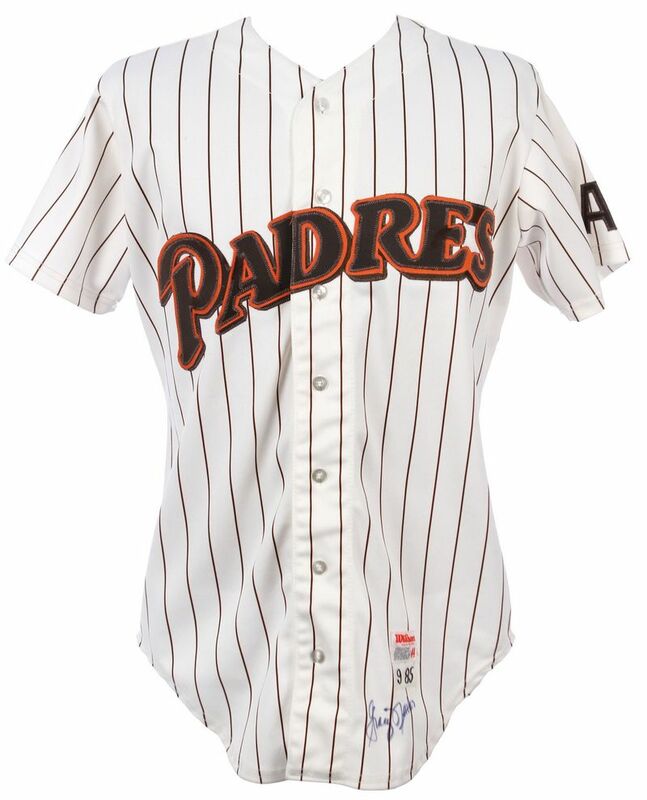 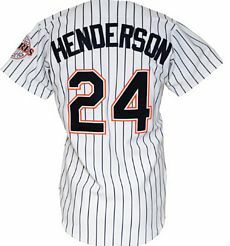 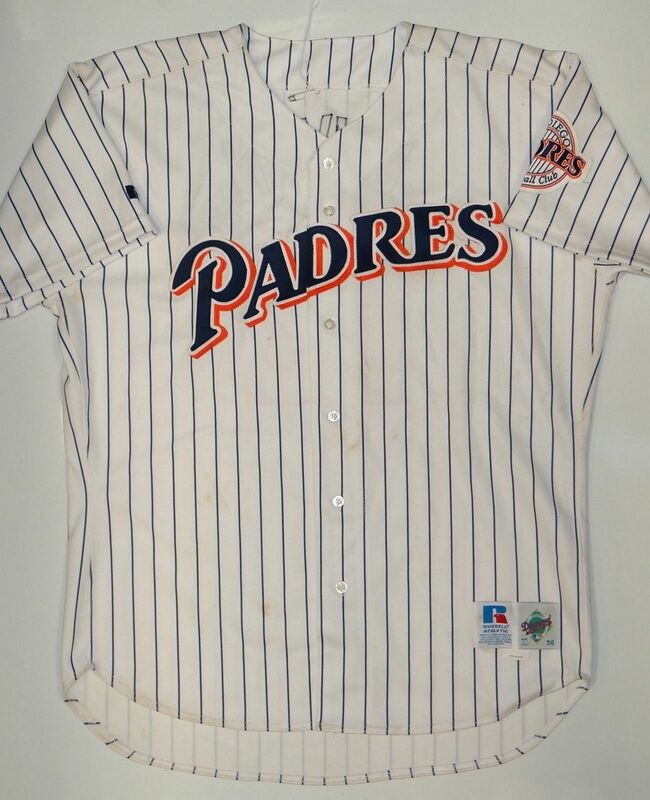 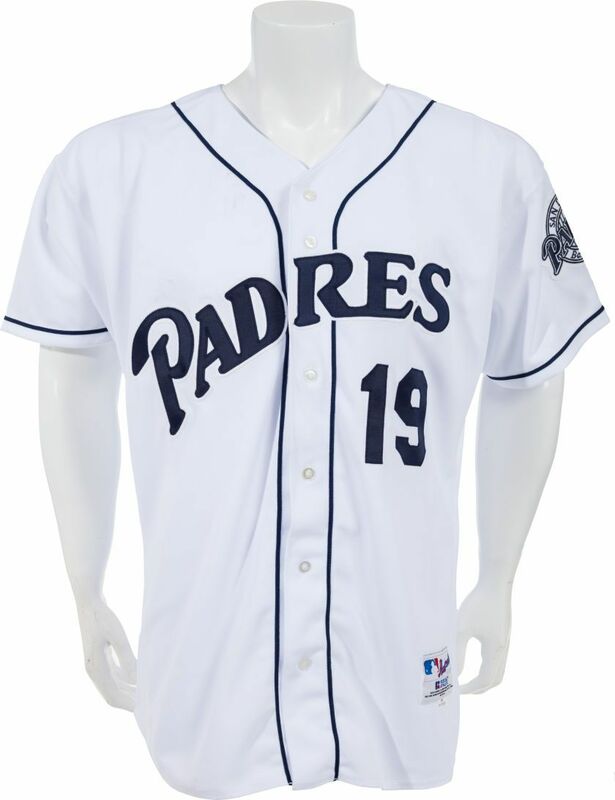 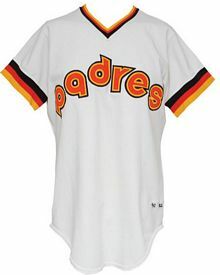 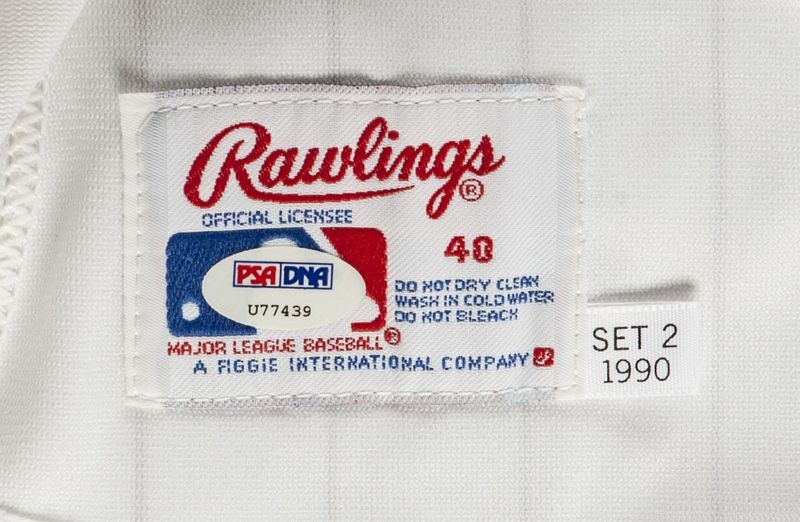 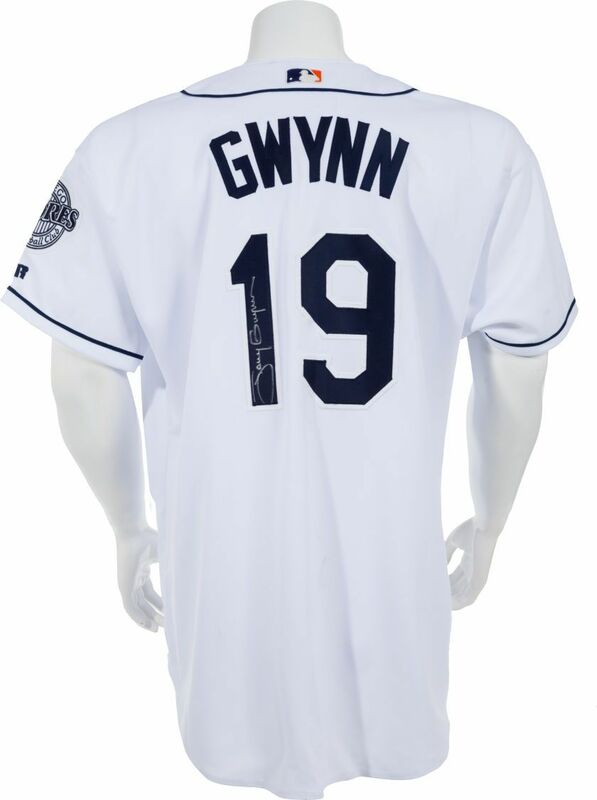 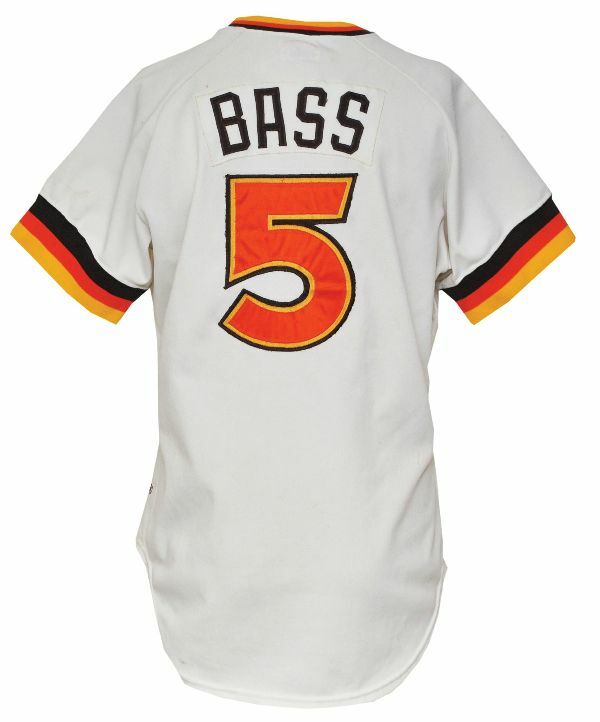 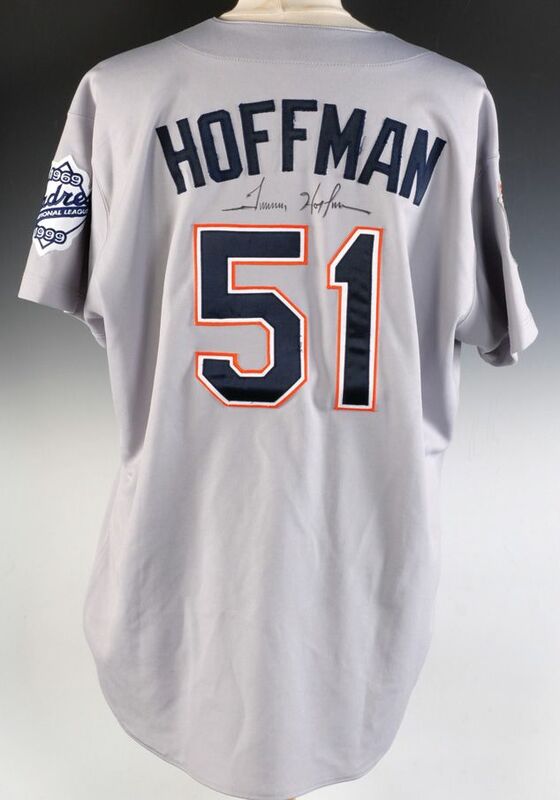 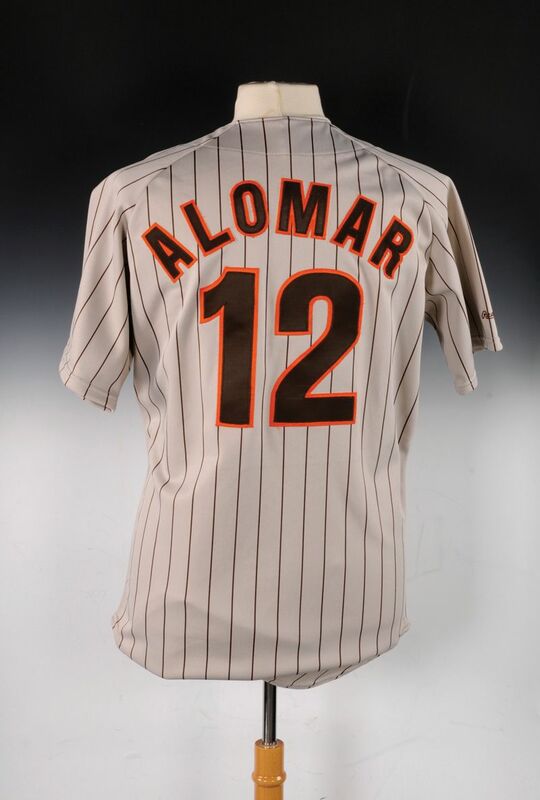 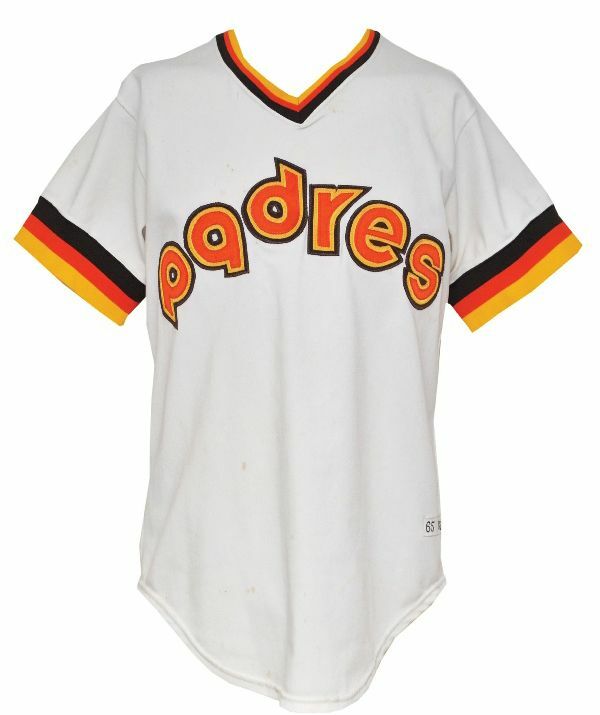 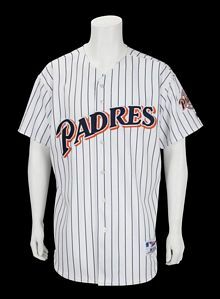 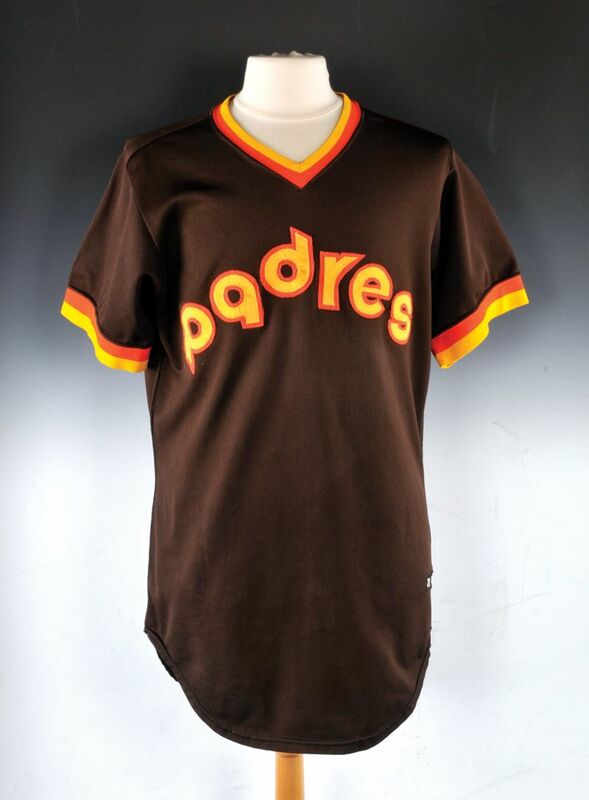 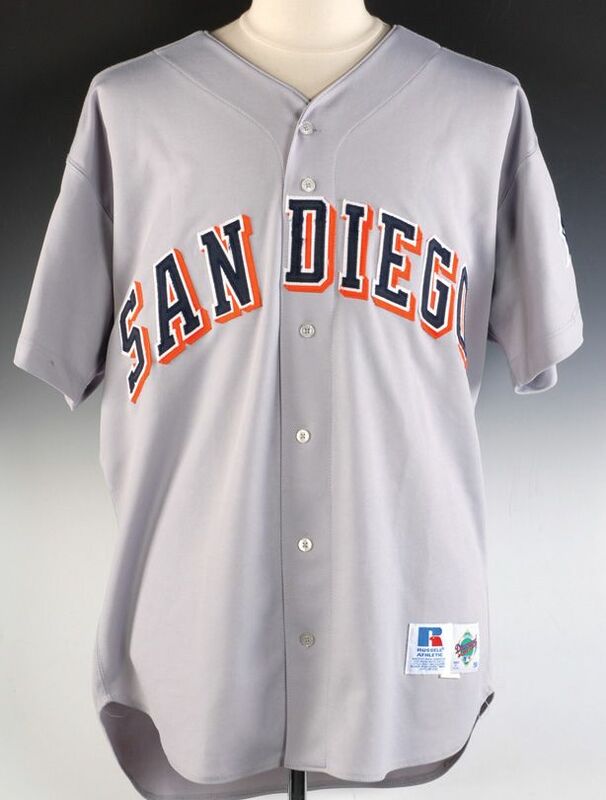 Also, the HOF Database and MEARS show the spring training jersey - still with the "PADRES" wordmark and with the 200th Anniversary patch added to the left sleeve - as an alternate road jersey. 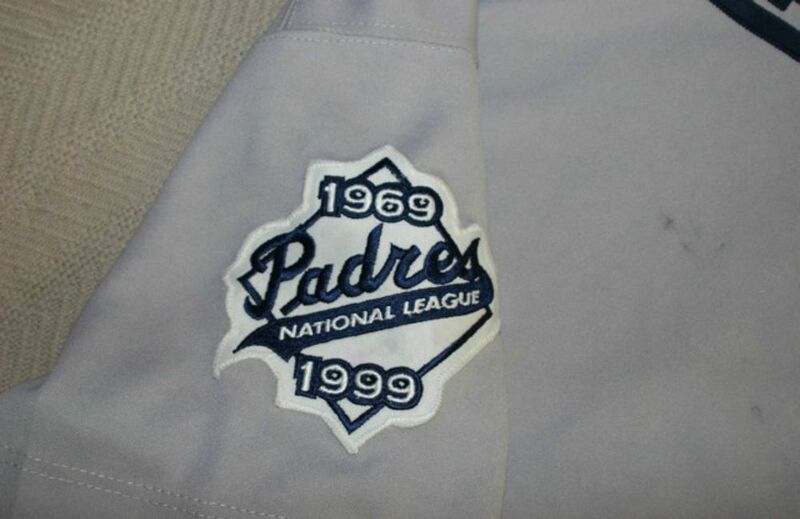 I don't know, I've never seen a photo of it on-field with the patch, so if anyone has more info let me know. 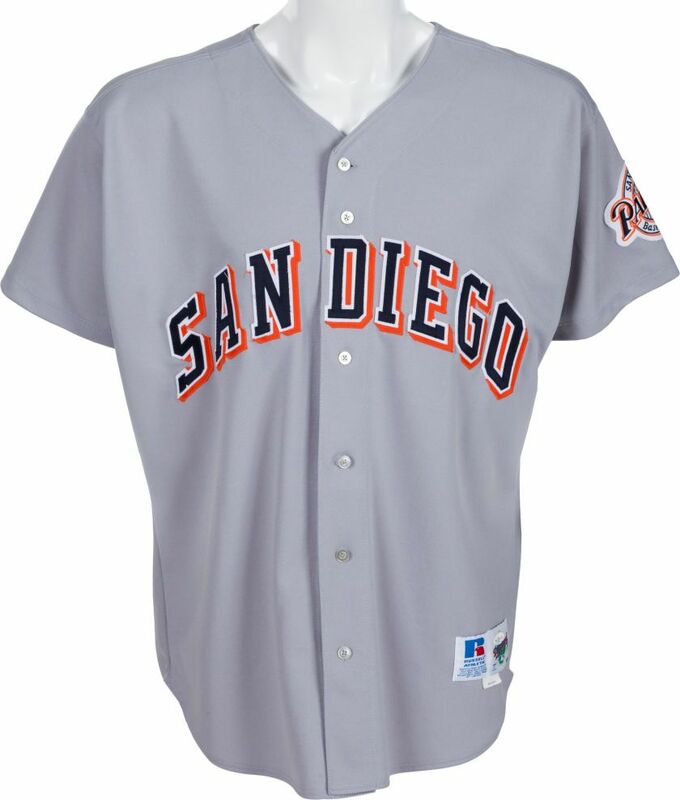 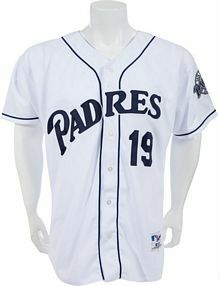 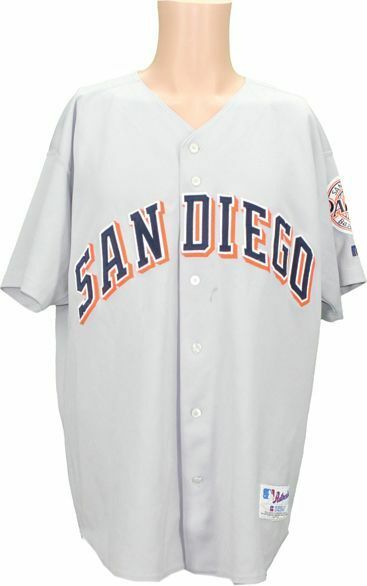 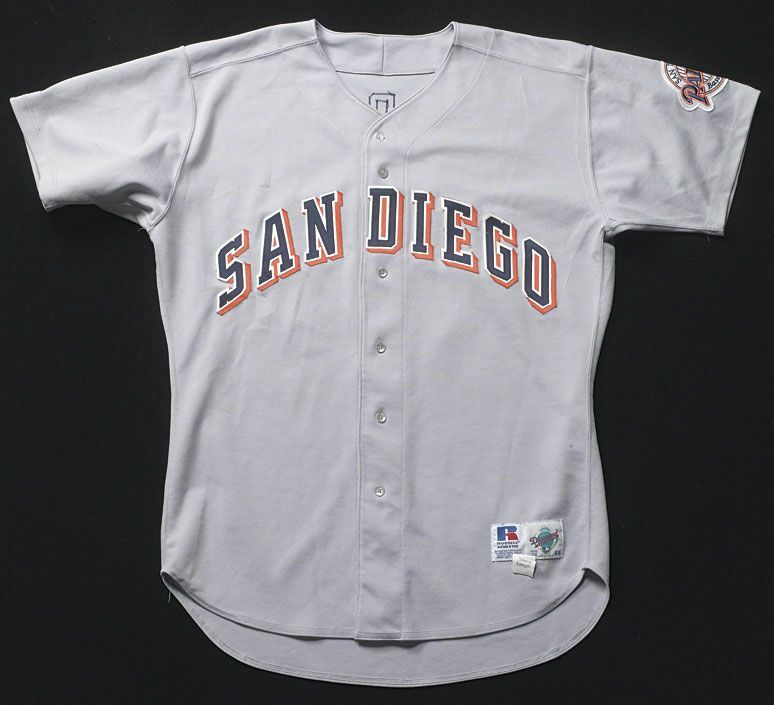 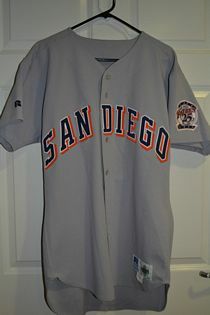 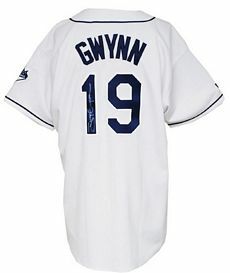 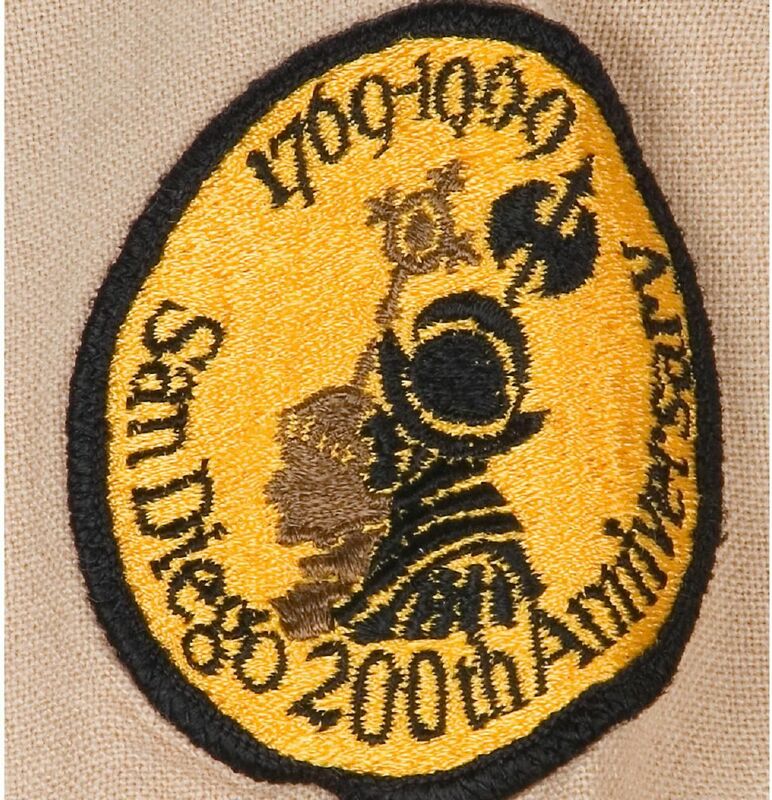 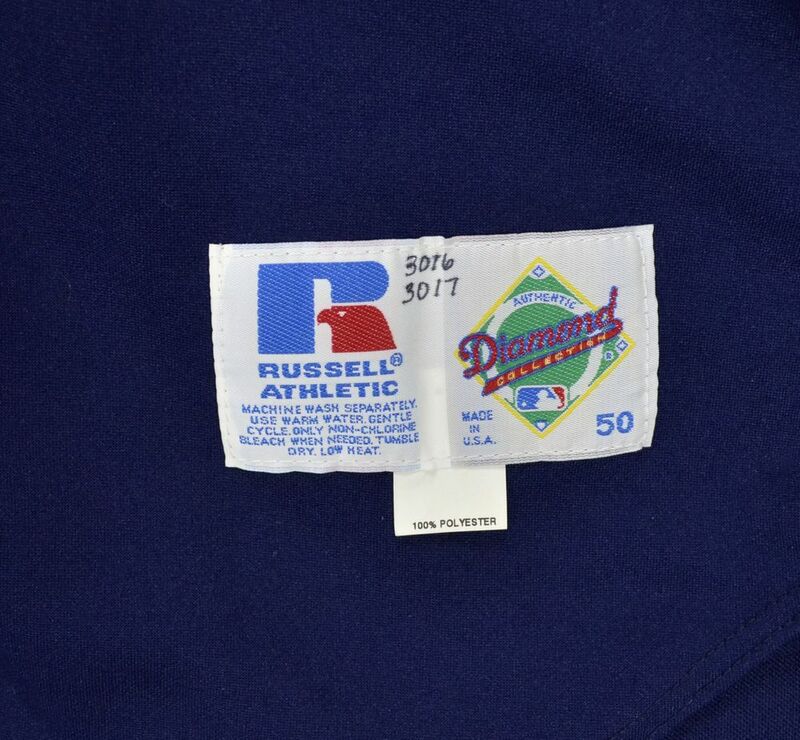 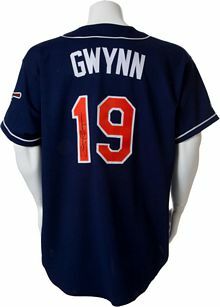 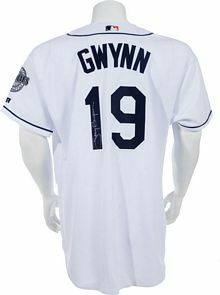 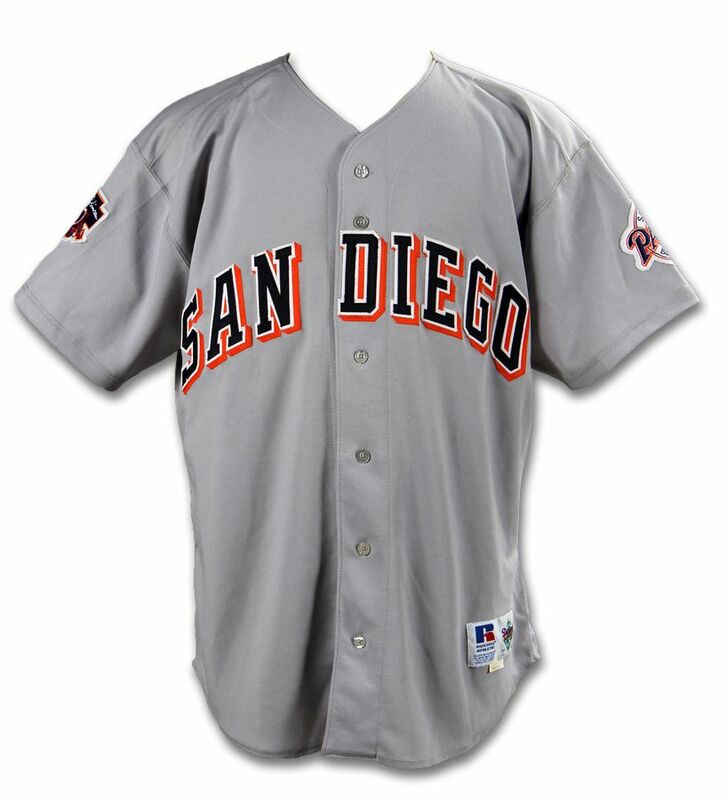 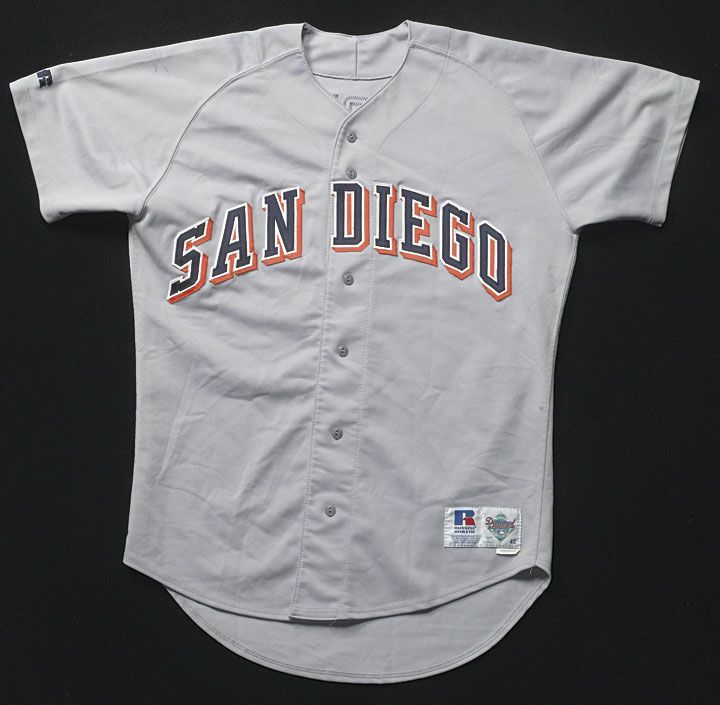 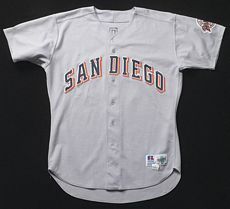 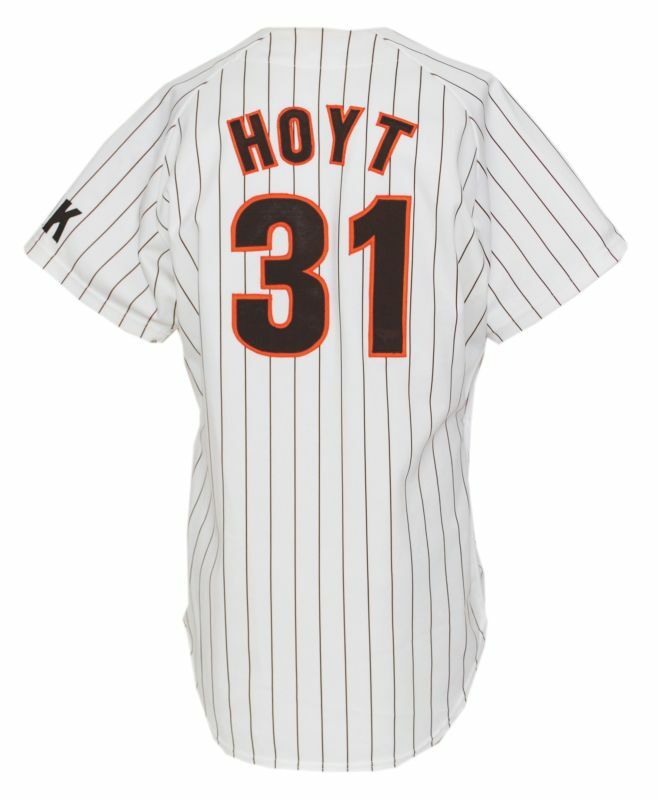 Road jerseys have the San Diego 200th Anniversary patch, no MLB patch and NO trim - which is correct per the HOF database. 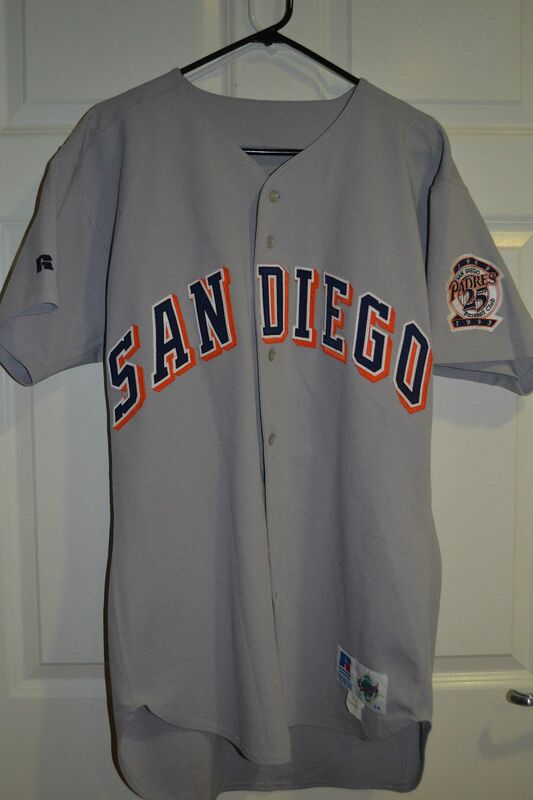 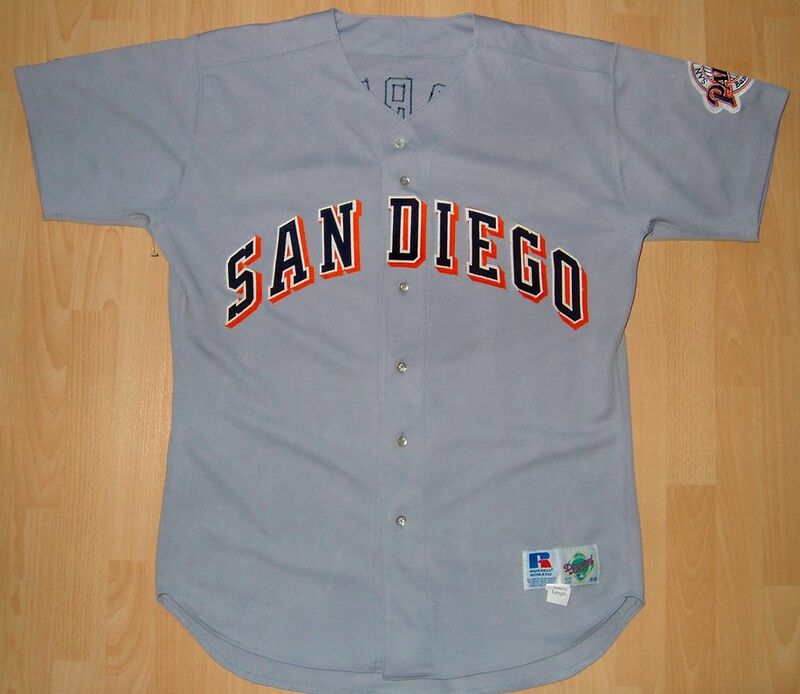 These are the spring training jerseys with the wordmark changed to San Diego. 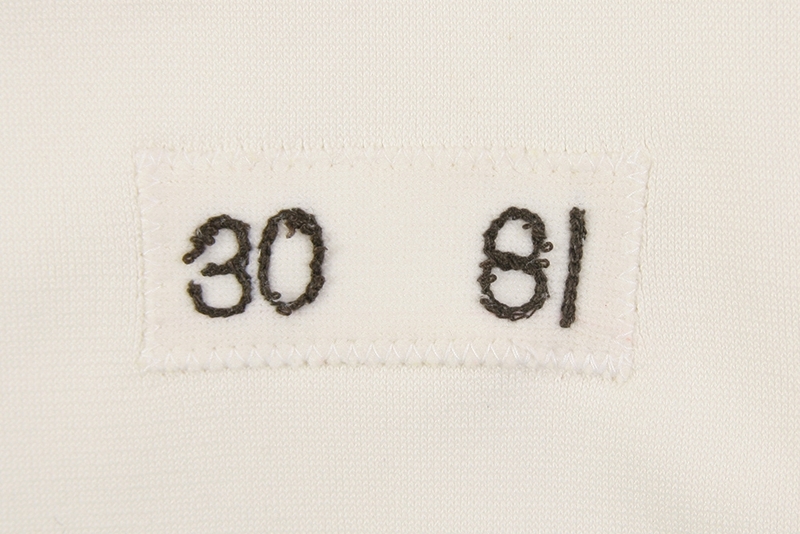 Trim added to collar and sleeves on road jersey. Now it matches the home jersey. 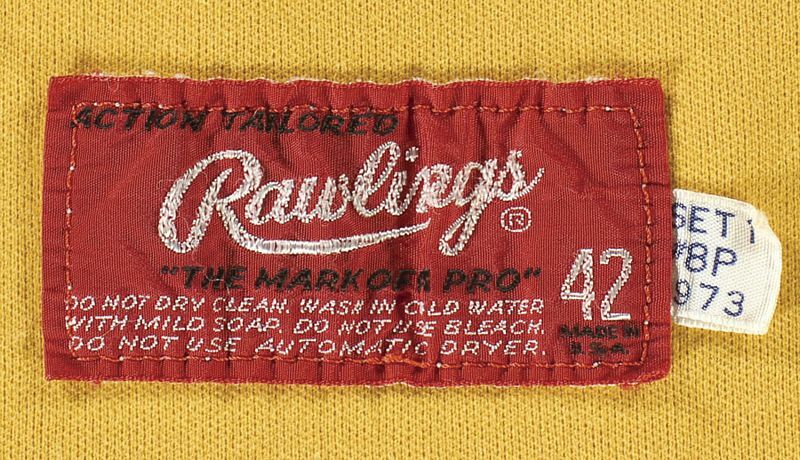 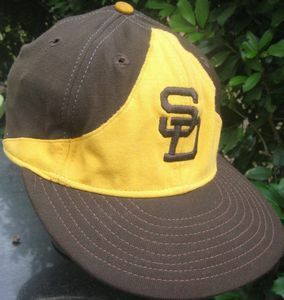 A one-year style for this road cap. 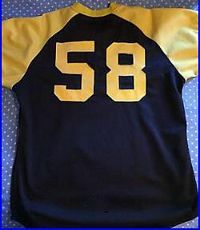 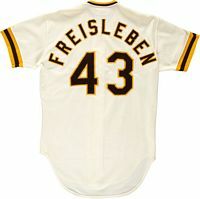 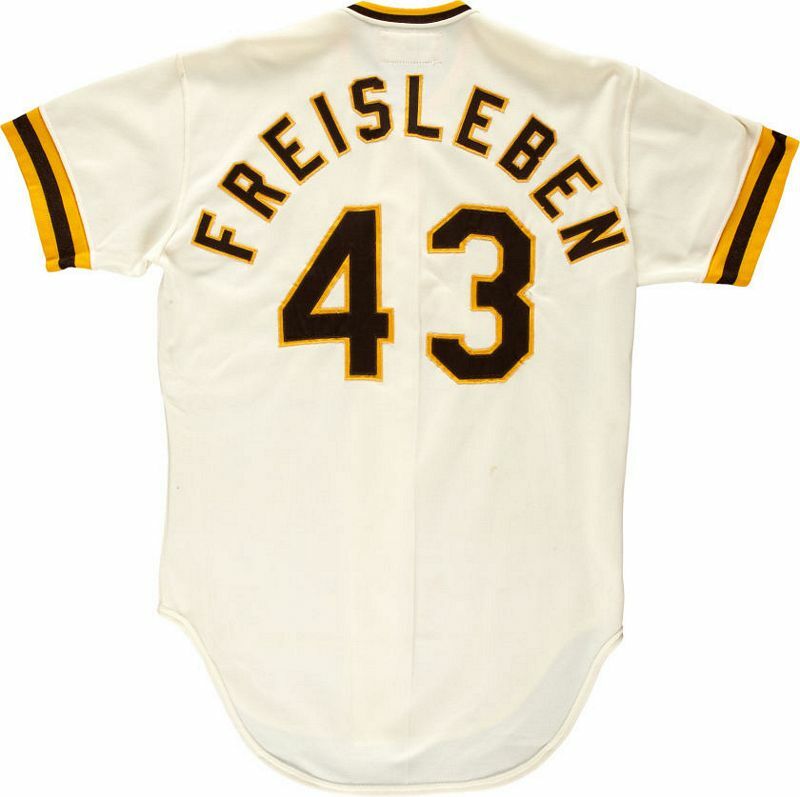 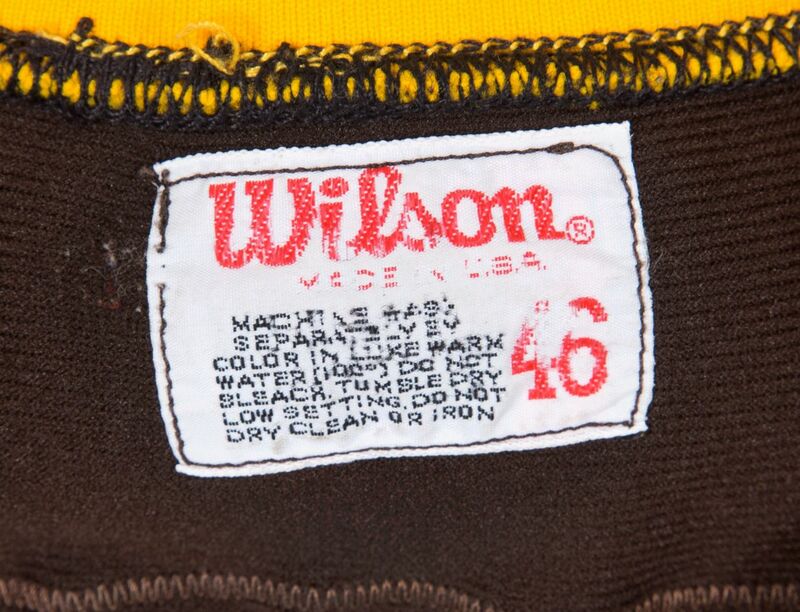 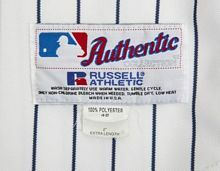 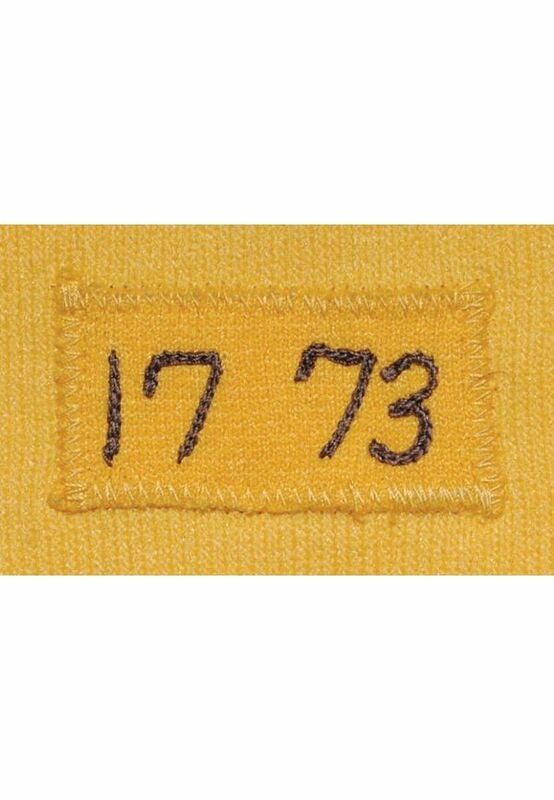 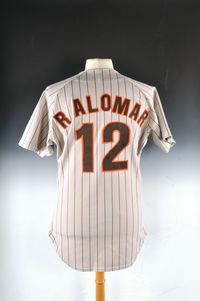 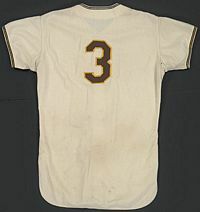 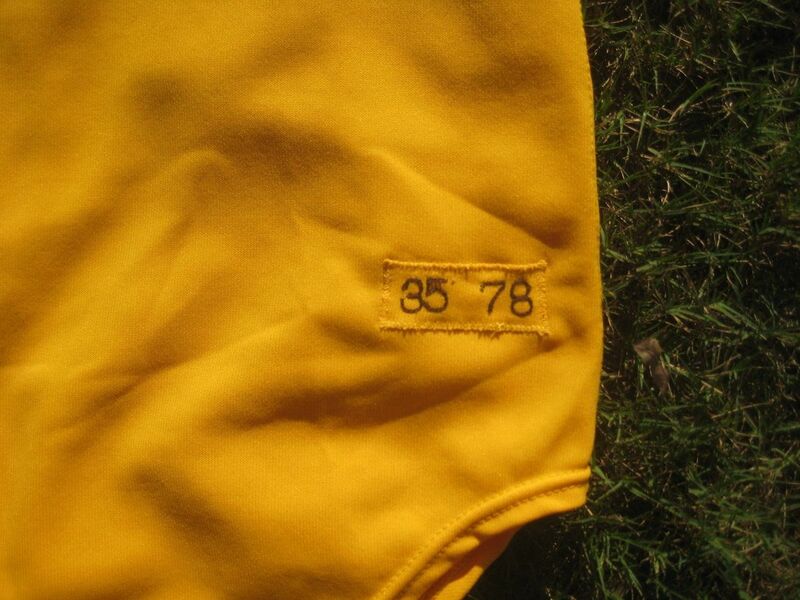 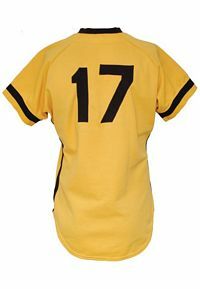 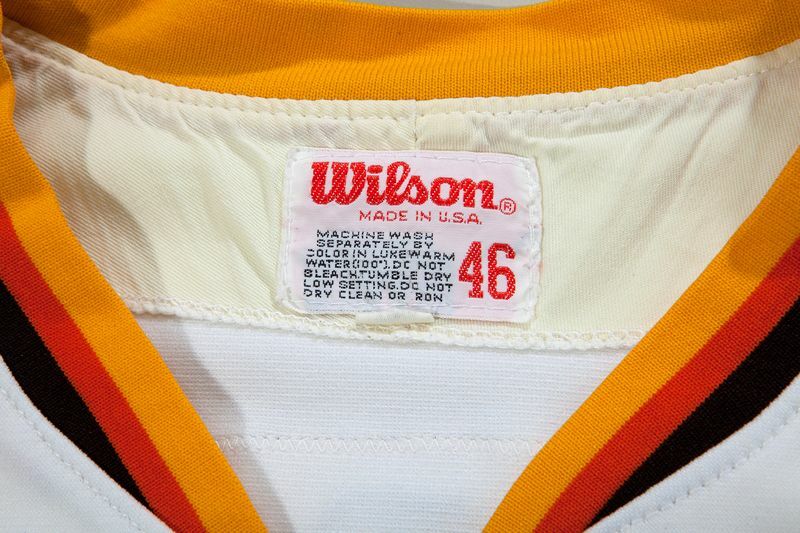 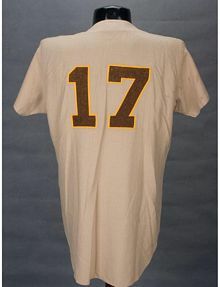 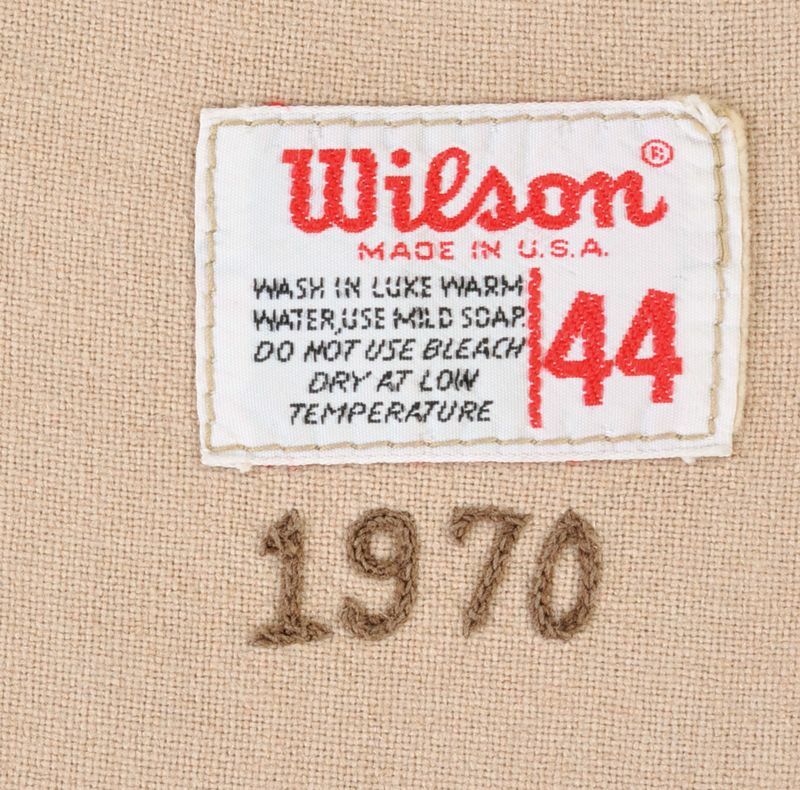 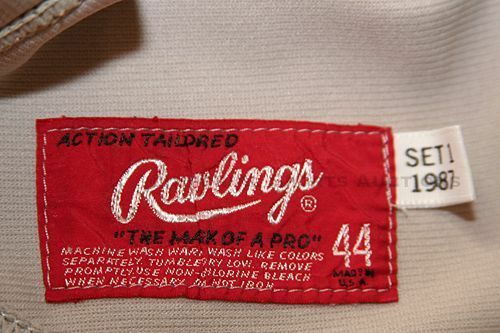 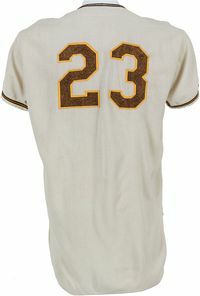 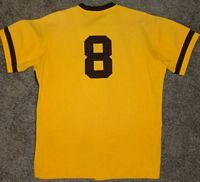 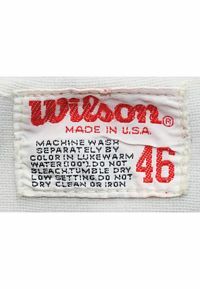 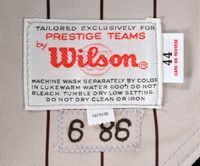 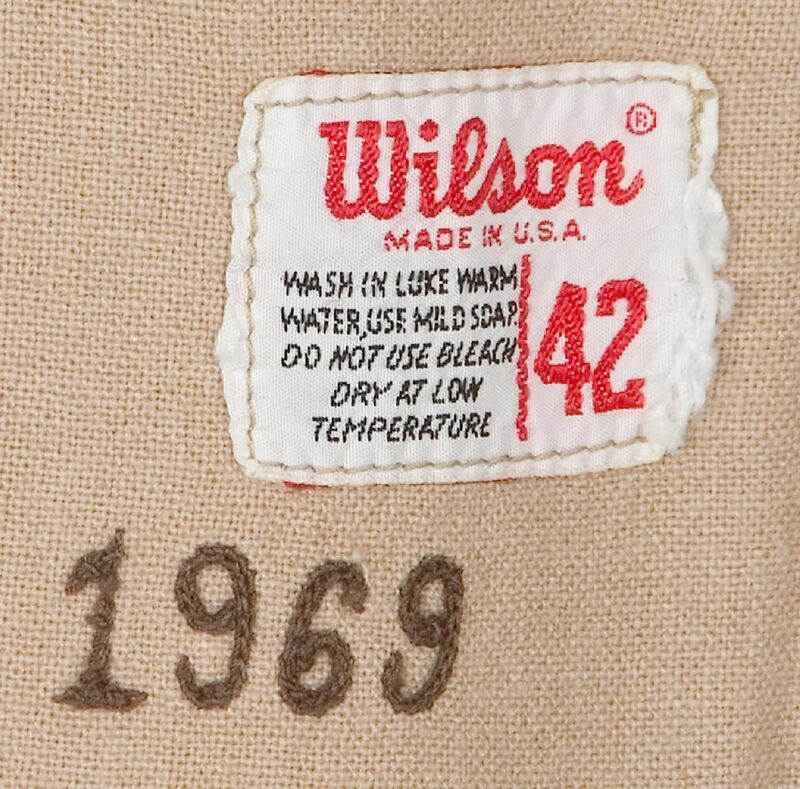 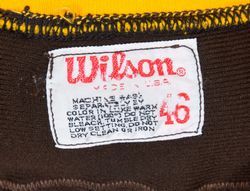 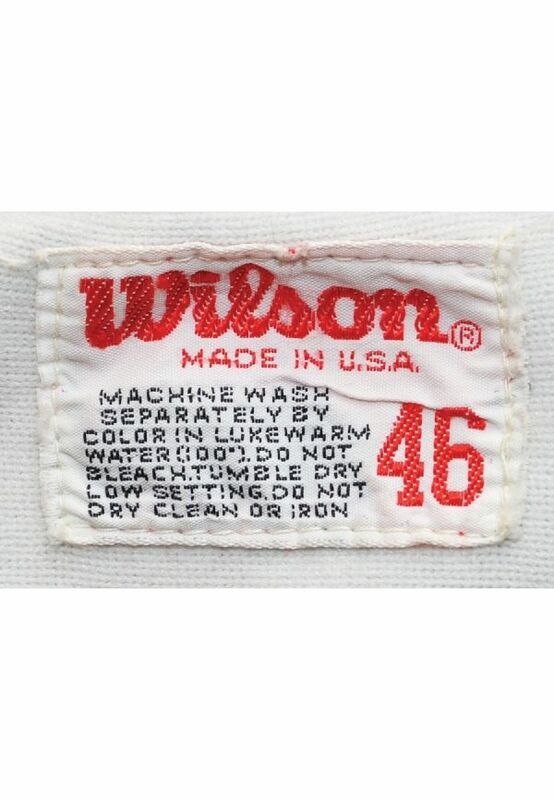 1970 jerseys were reused in 1971. 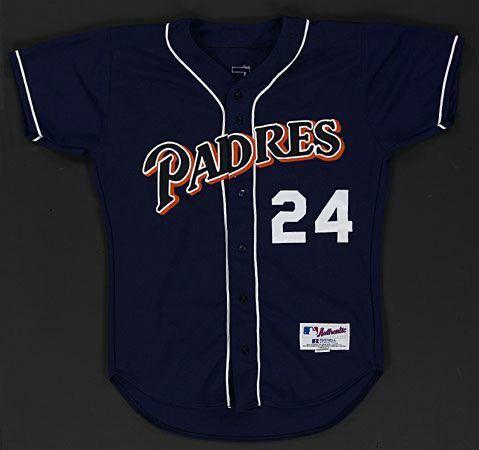 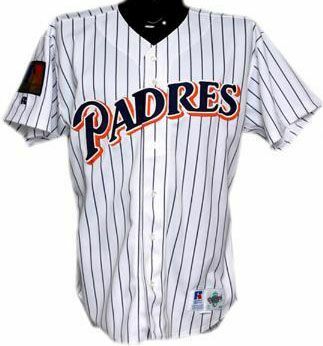 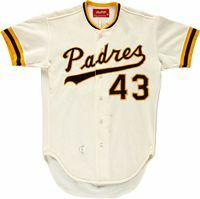 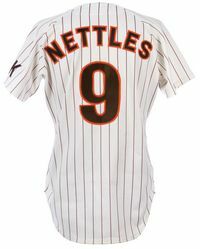 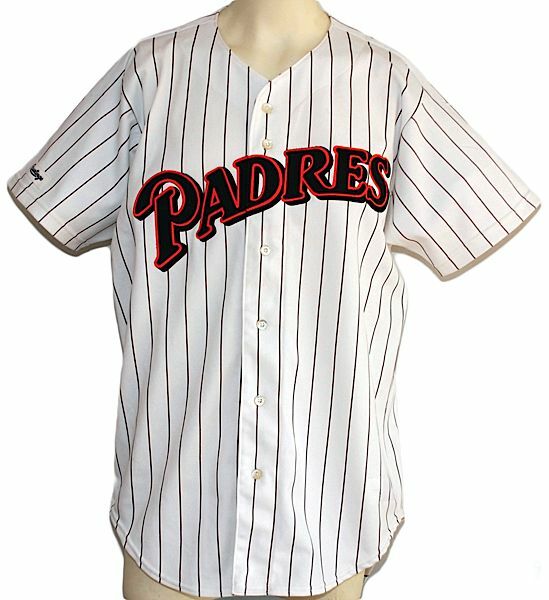 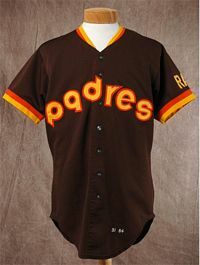 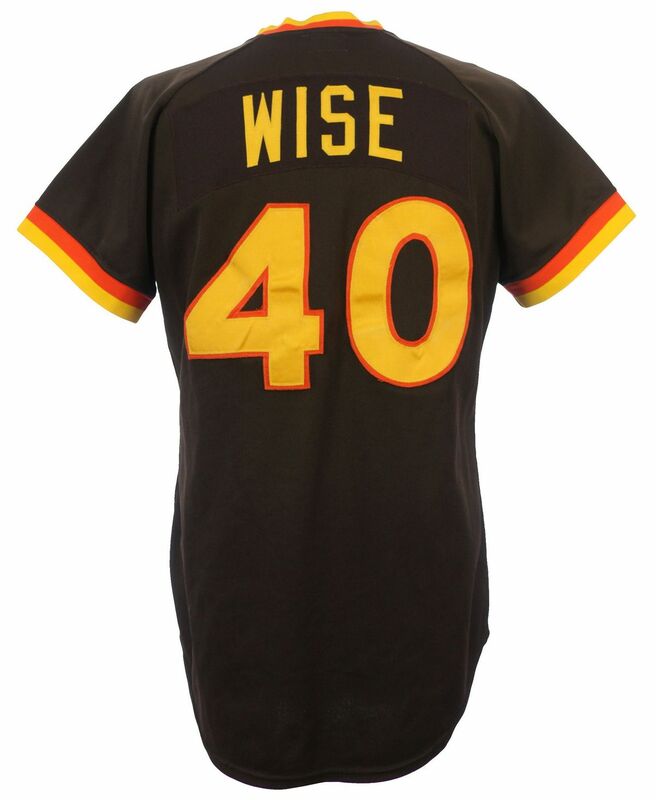 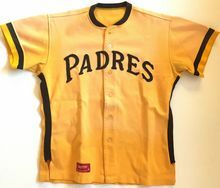 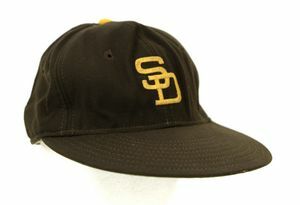 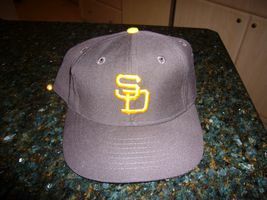 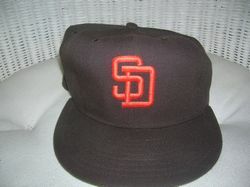 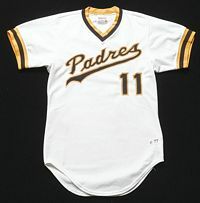 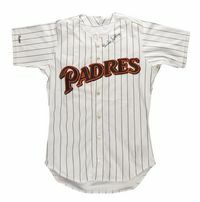 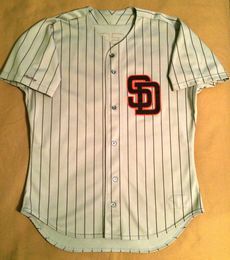 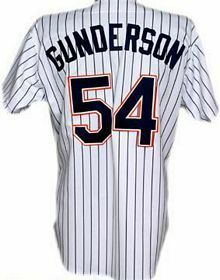 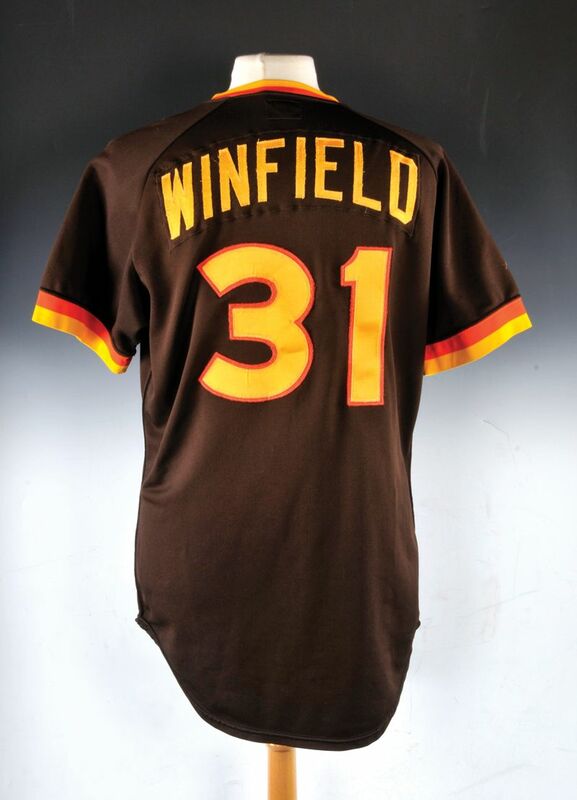 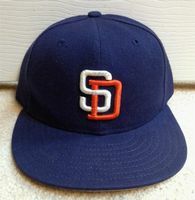 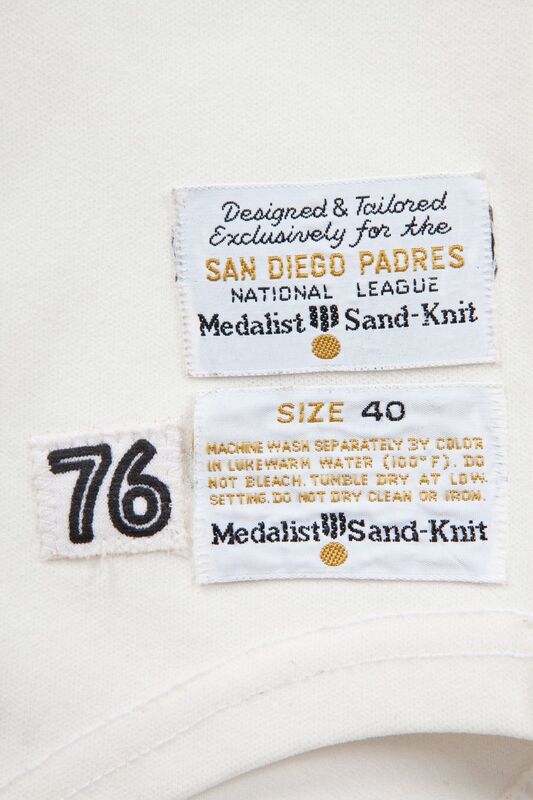 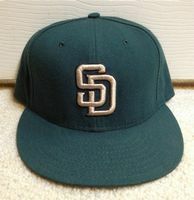 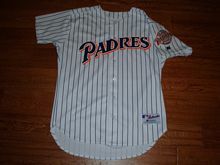 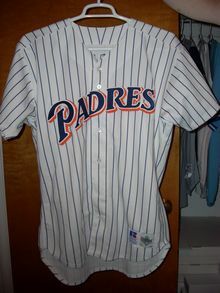 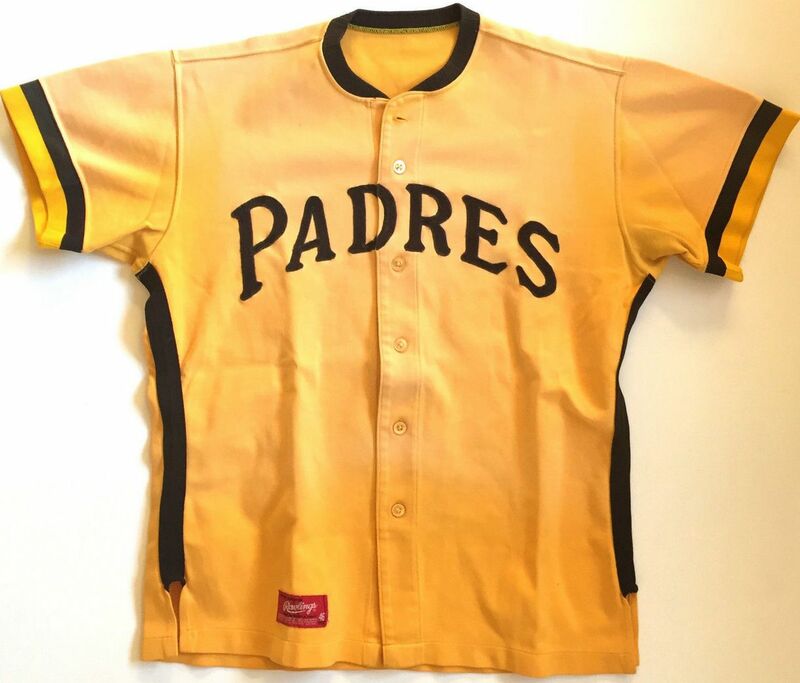 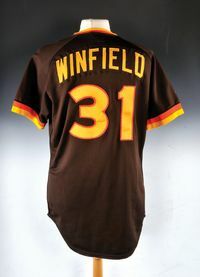 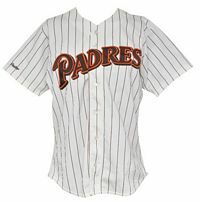 The Padres make the move to double knit polyester and take the opportunity to add a touch of color. 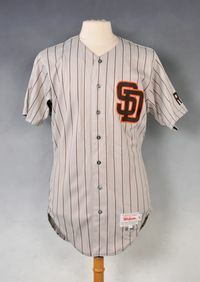 Showing 2 different jerseys here. 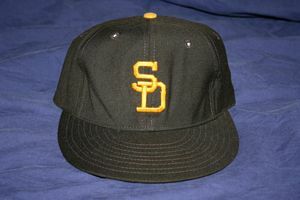 Taco Bell becomes the main cap. 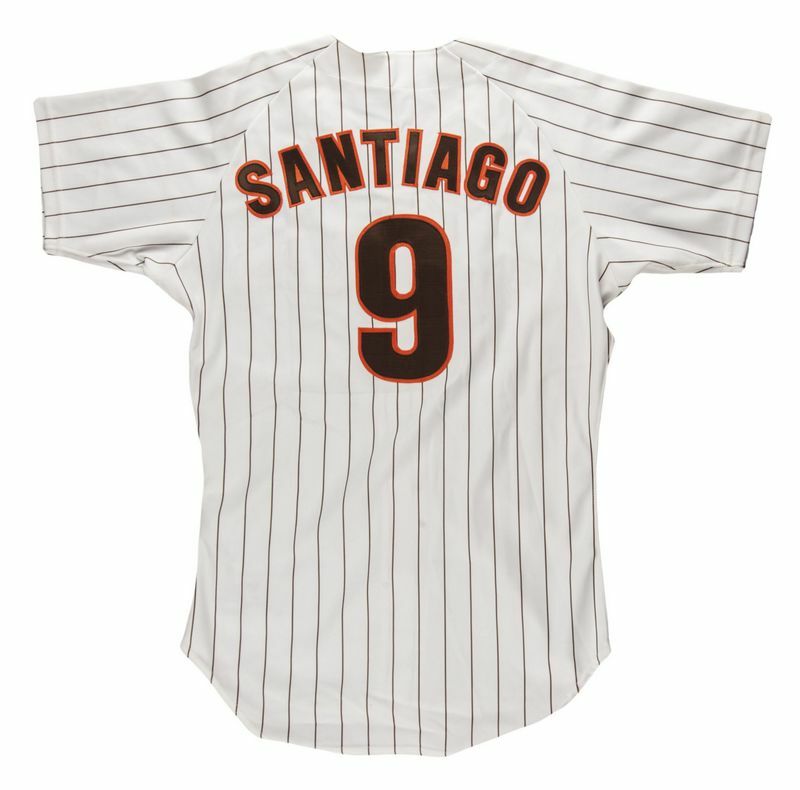 A return to a traditional look. NOB added to home jerseys, front numbers added on both. 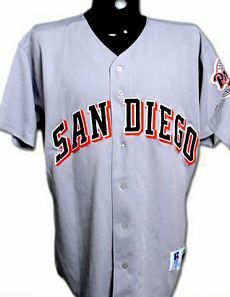 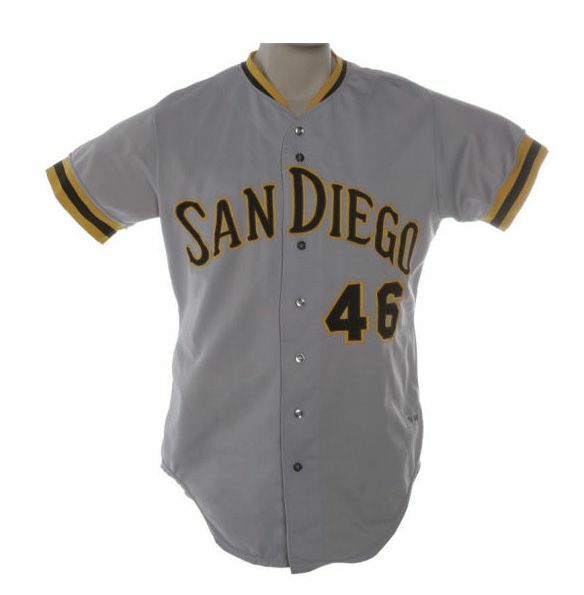 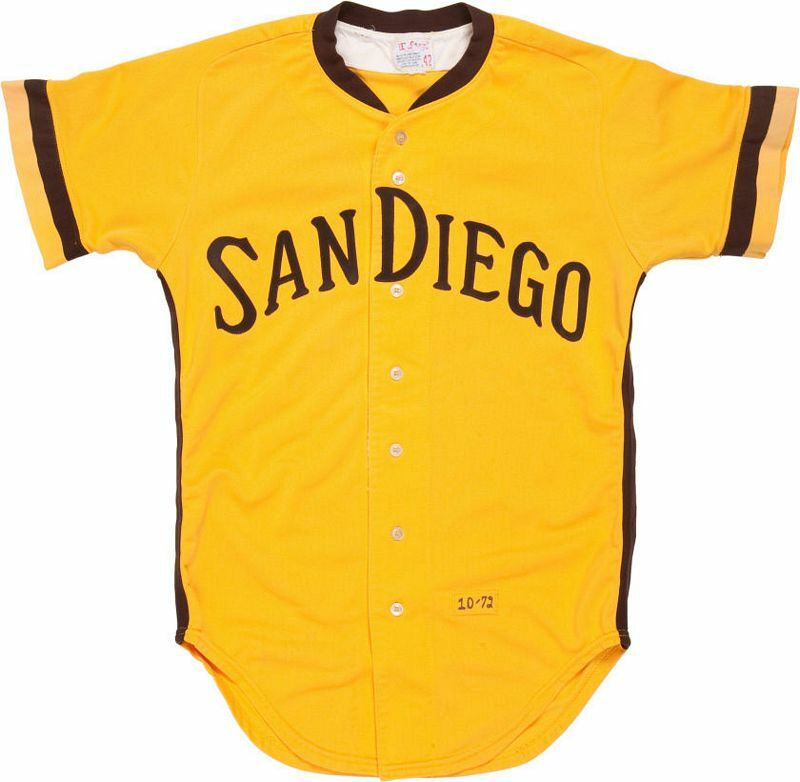 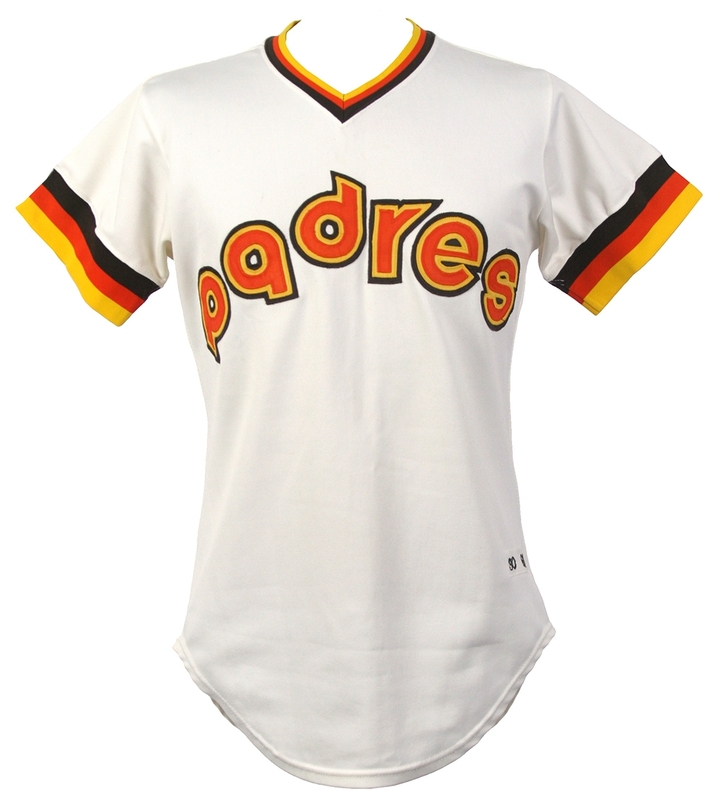 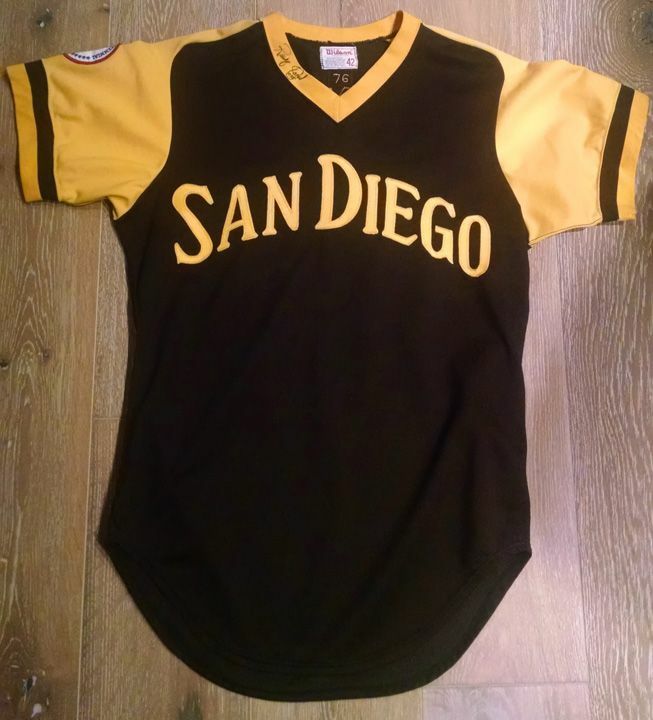 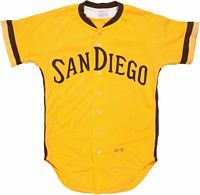 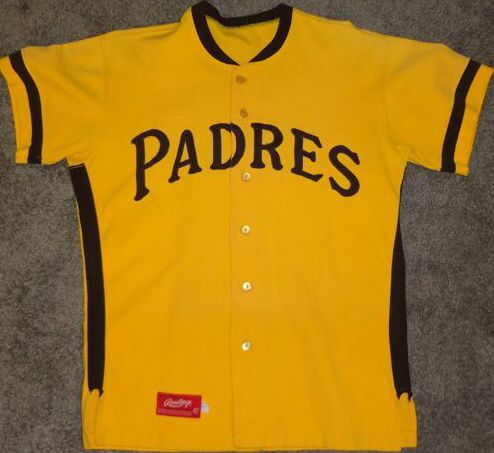 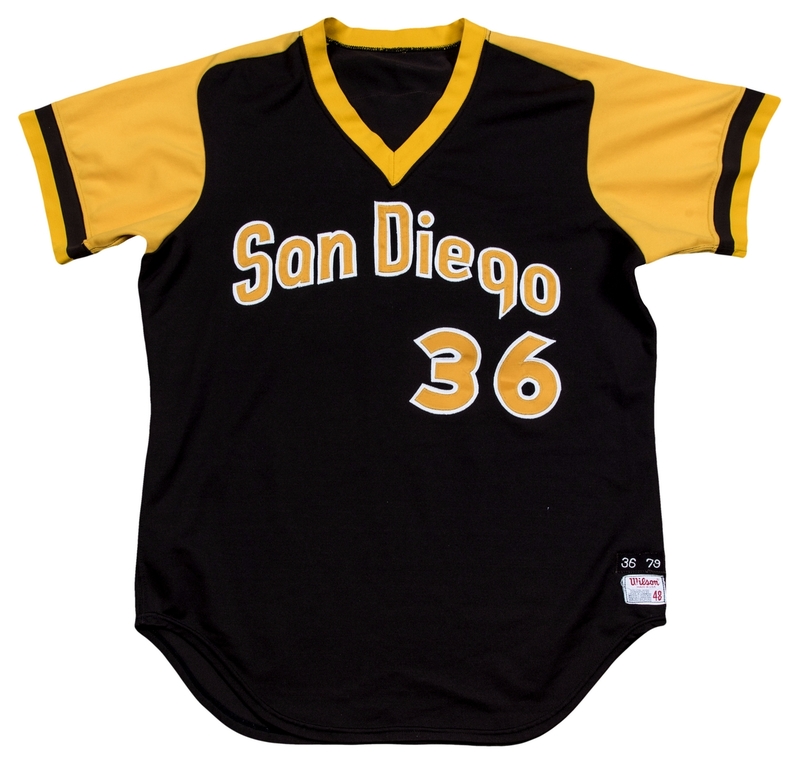 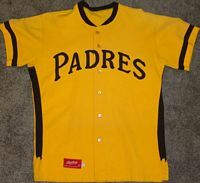 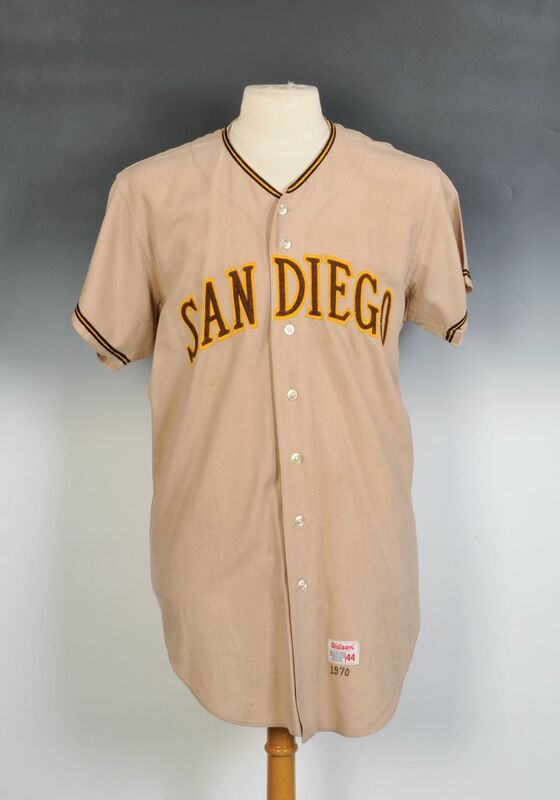 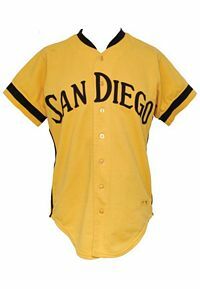 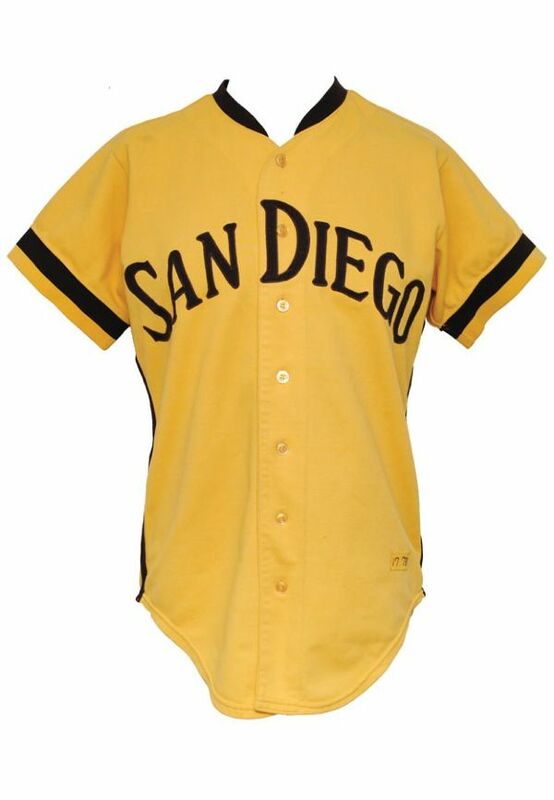 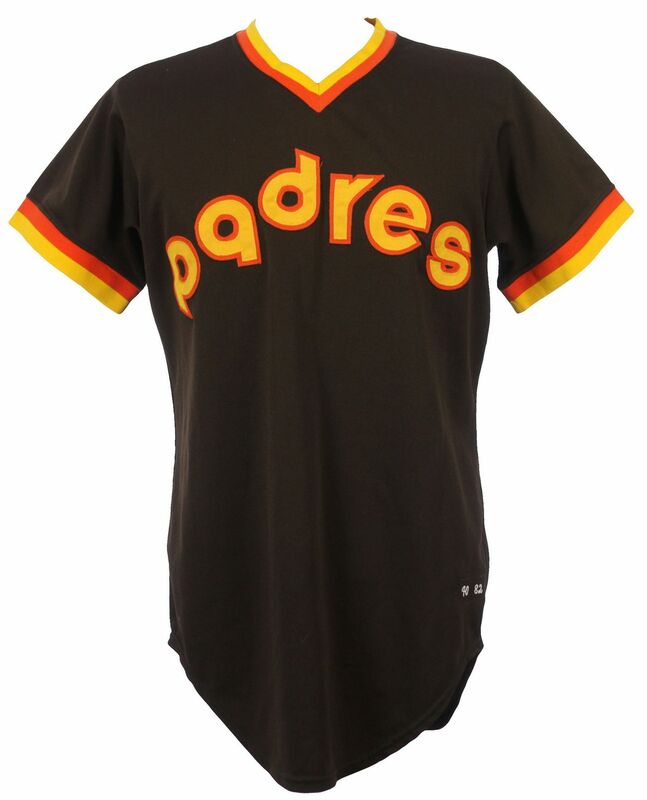 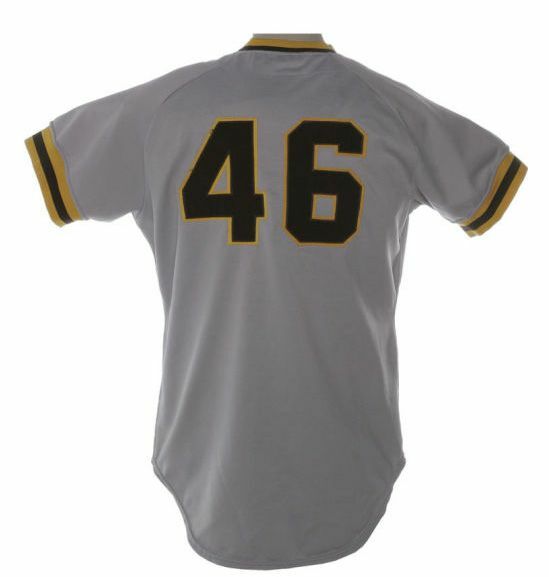 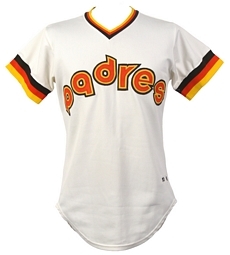 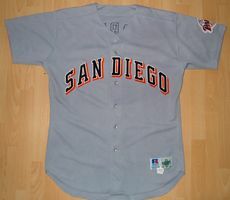 Road jerseys change to brown with mustard sleeves and "SAN DIEGO" in arched block. 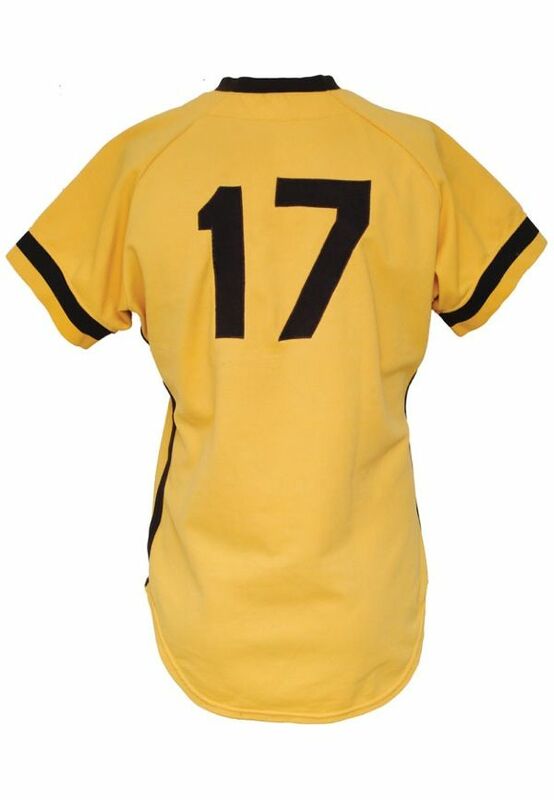 NOB is only on the home jersey. 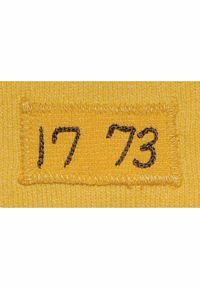 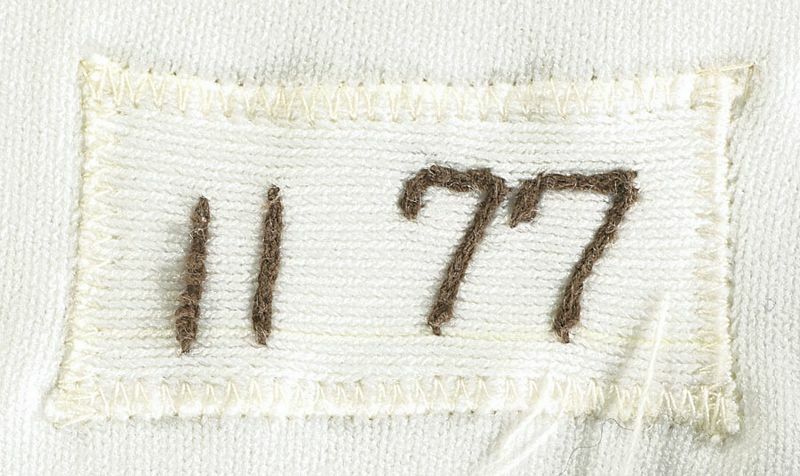 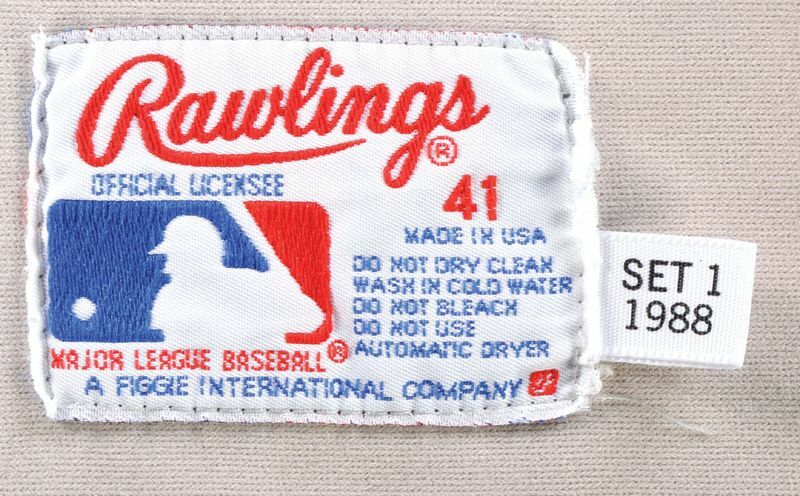 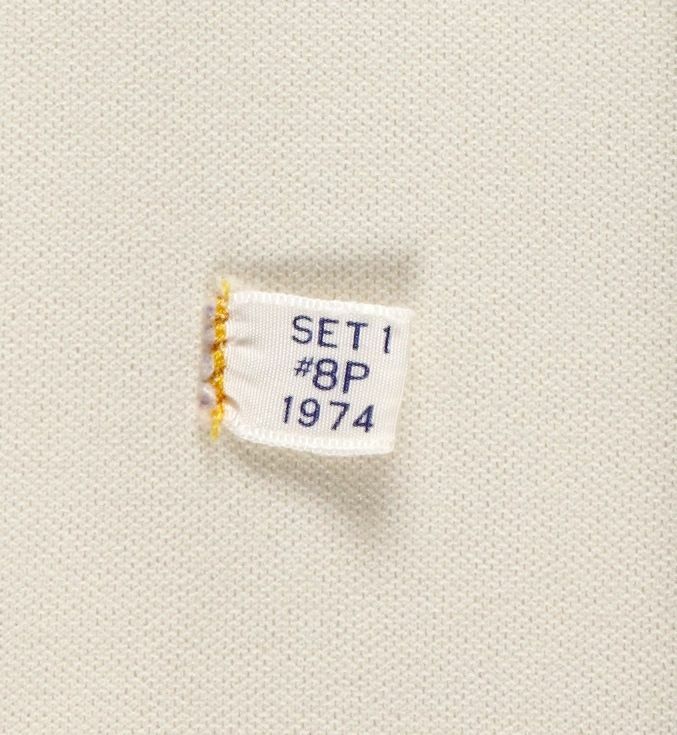 NL Centennial sleeve patch worn in 1976. 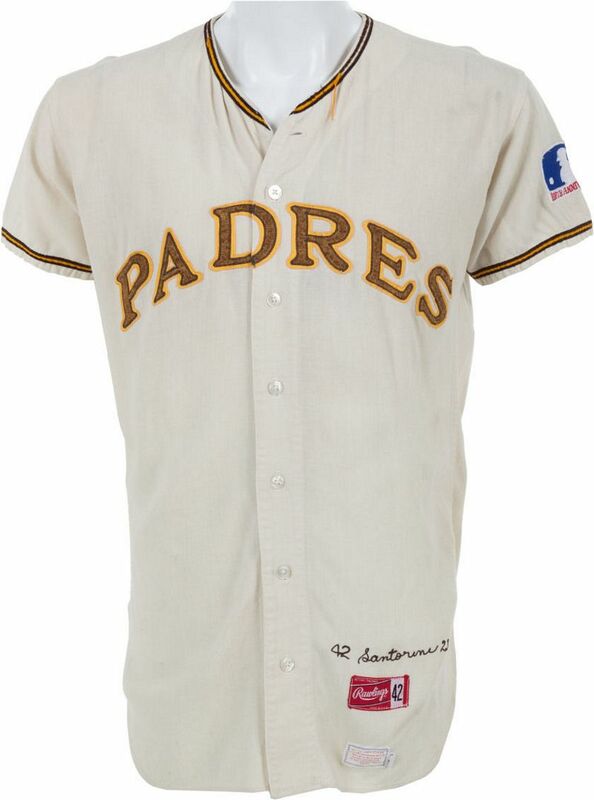 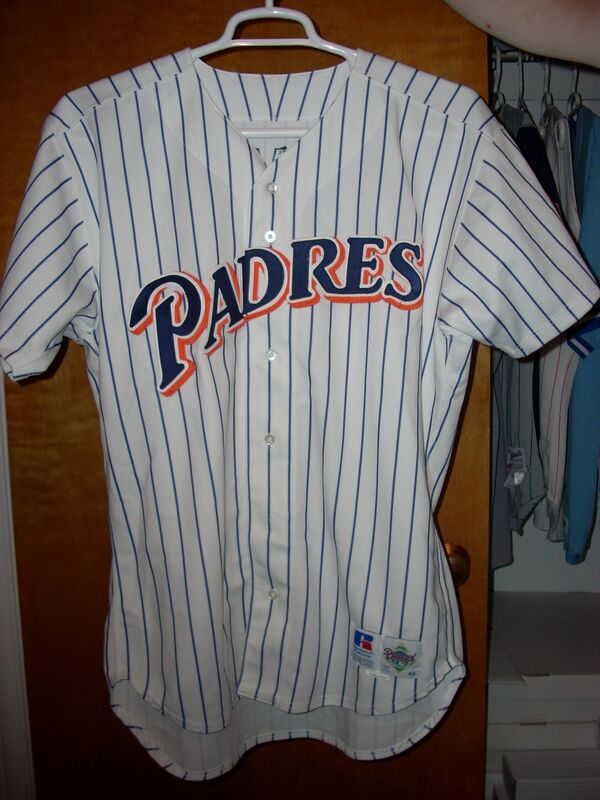 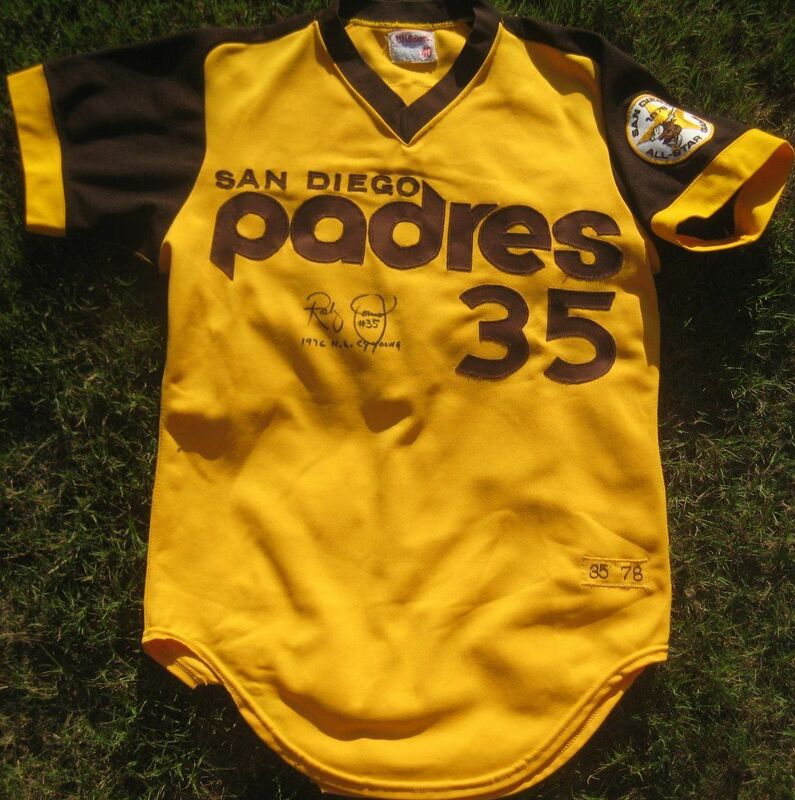 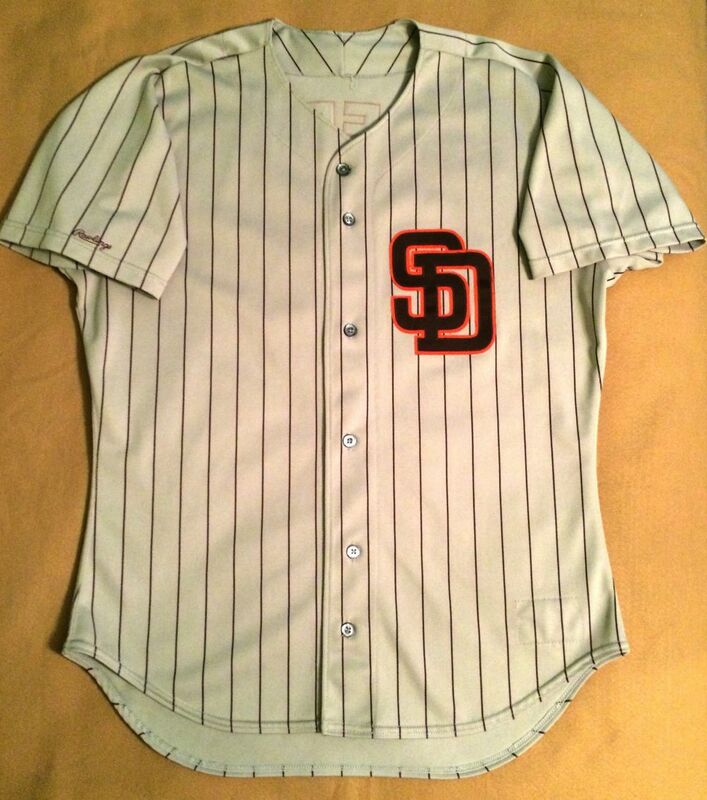 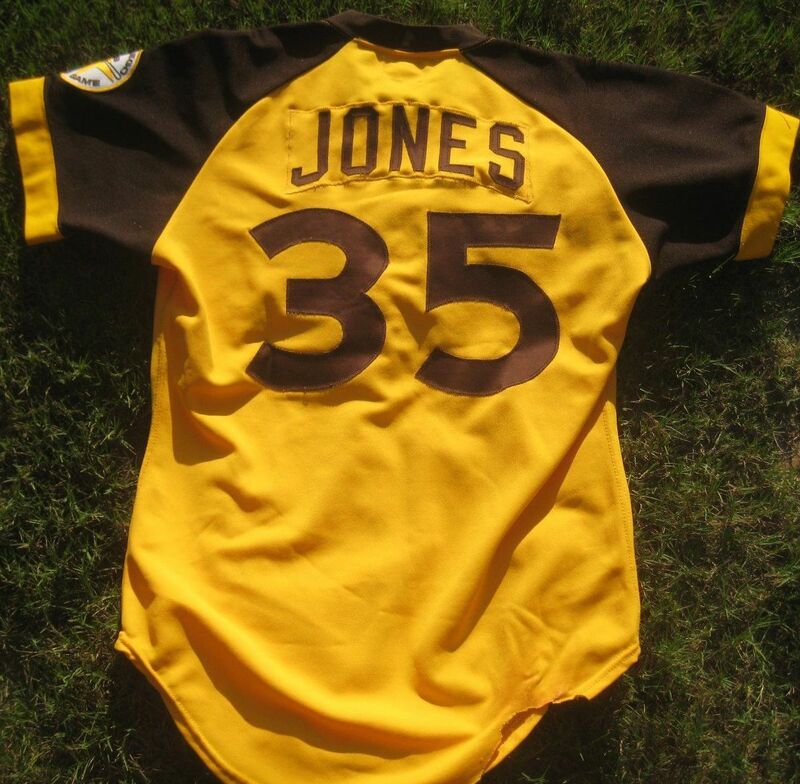 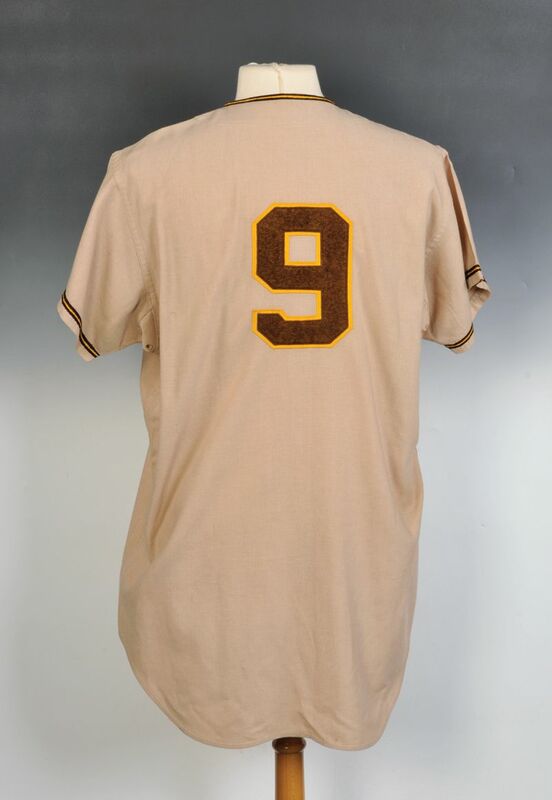 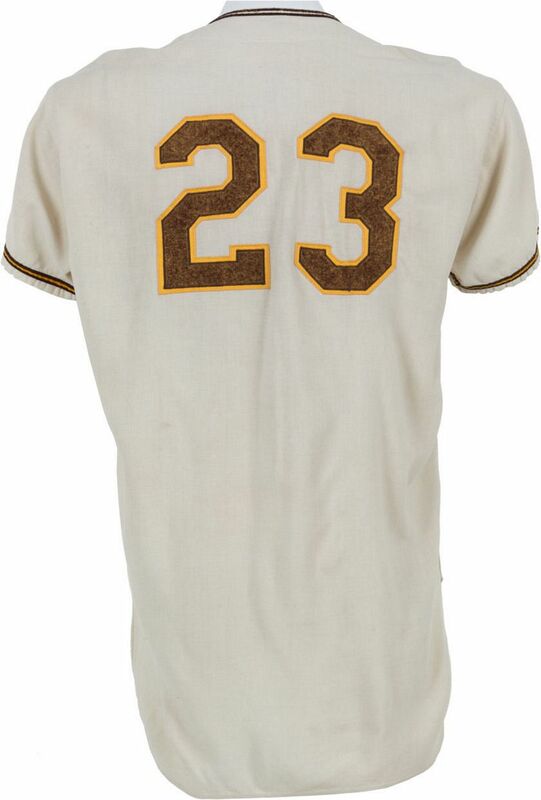 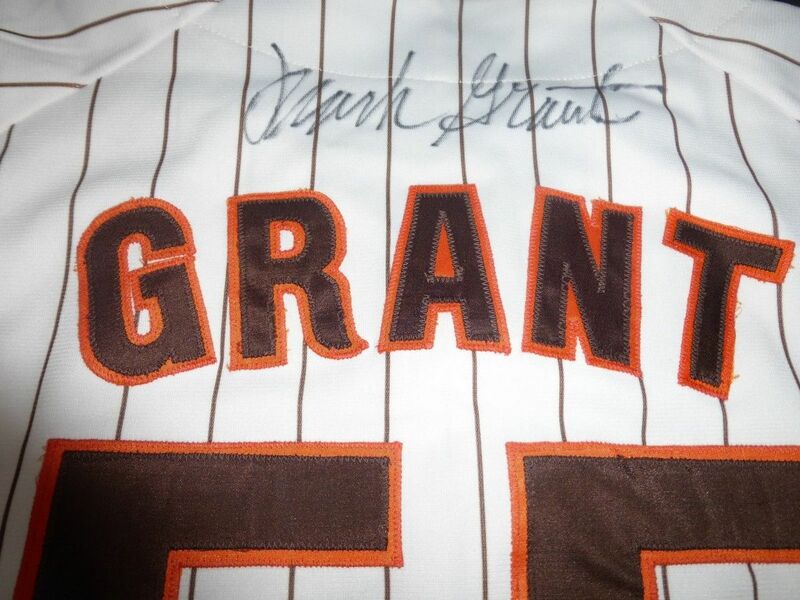 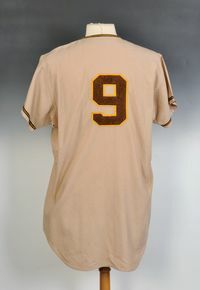 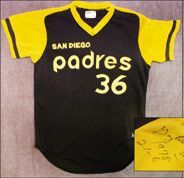 The second frontal photo is a fake Randy Jones but it does accurately show the jersey front and sleeve patch. 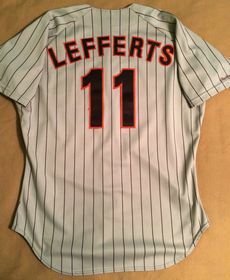 Let's change it up again. 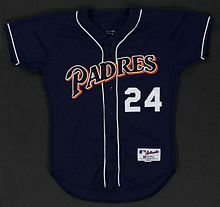 New home, road, and now an alternate. 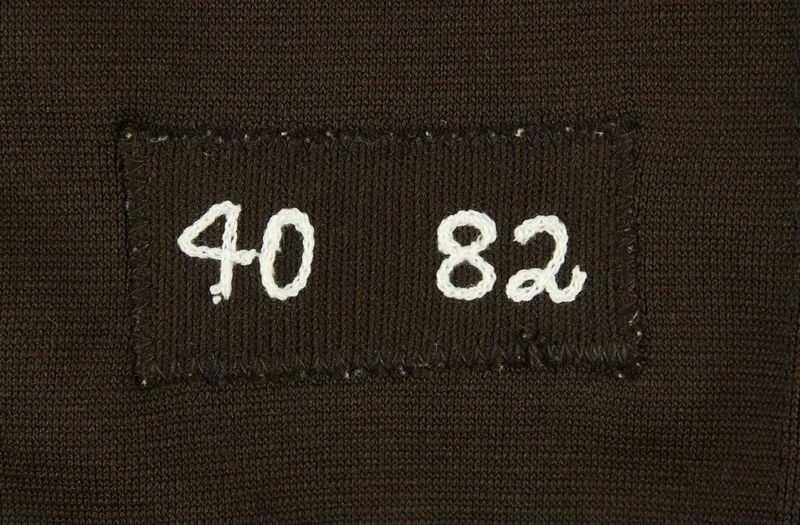 NOB now on all jerseys. 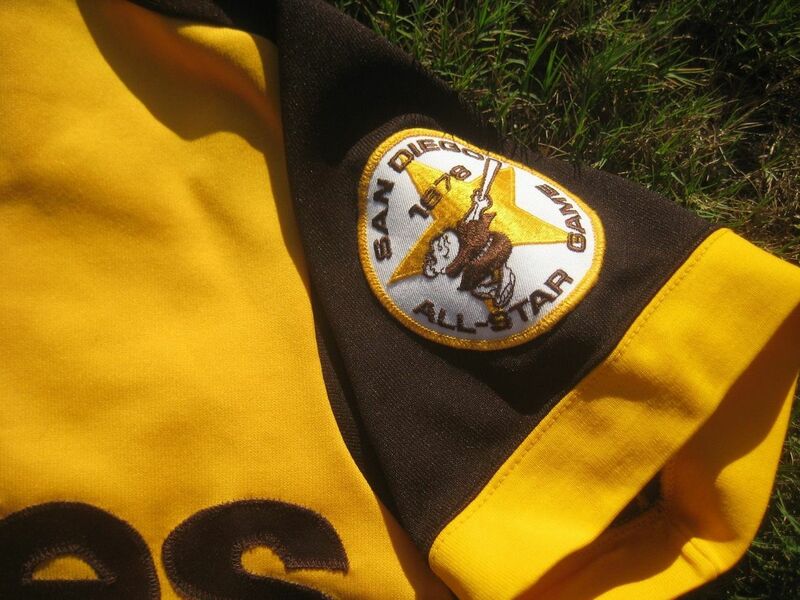 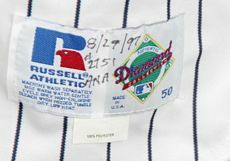 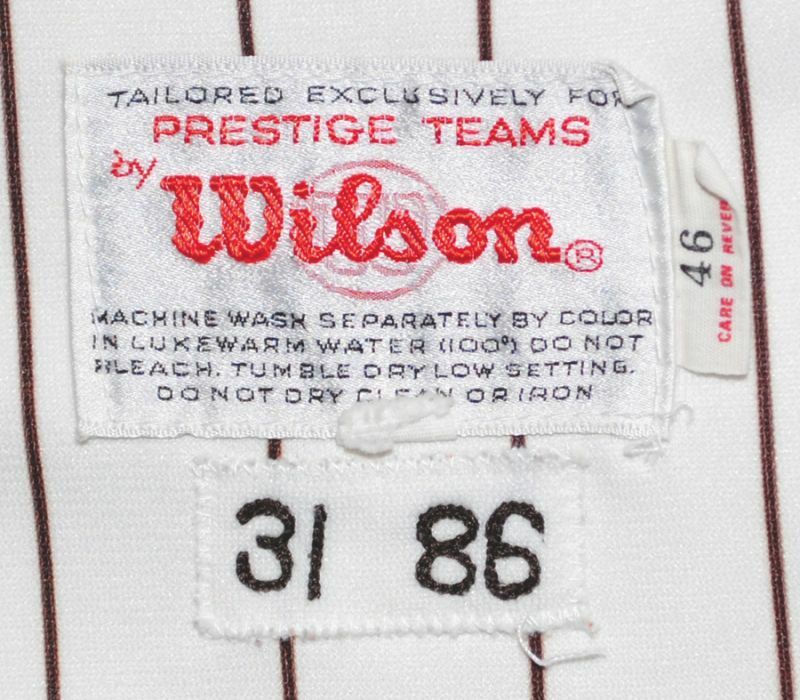 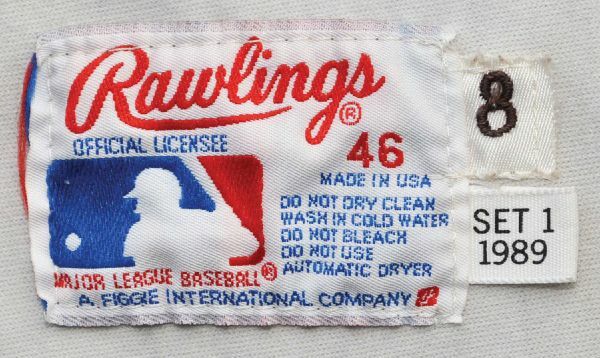 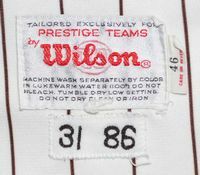 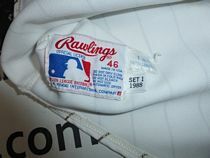 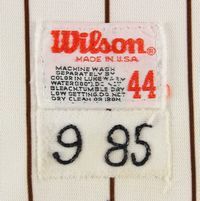 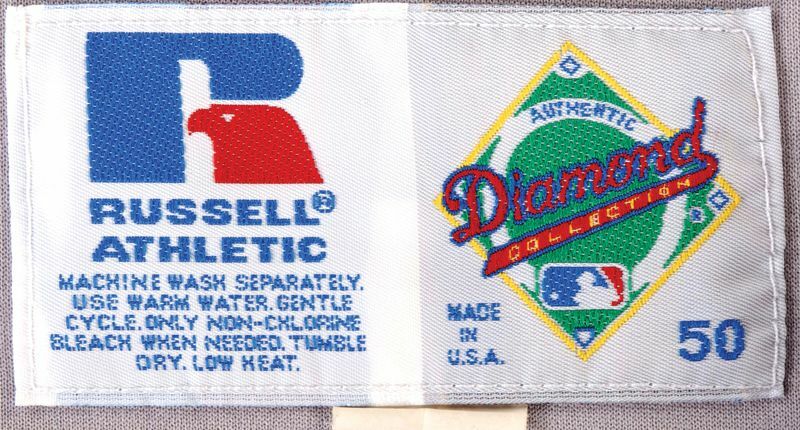 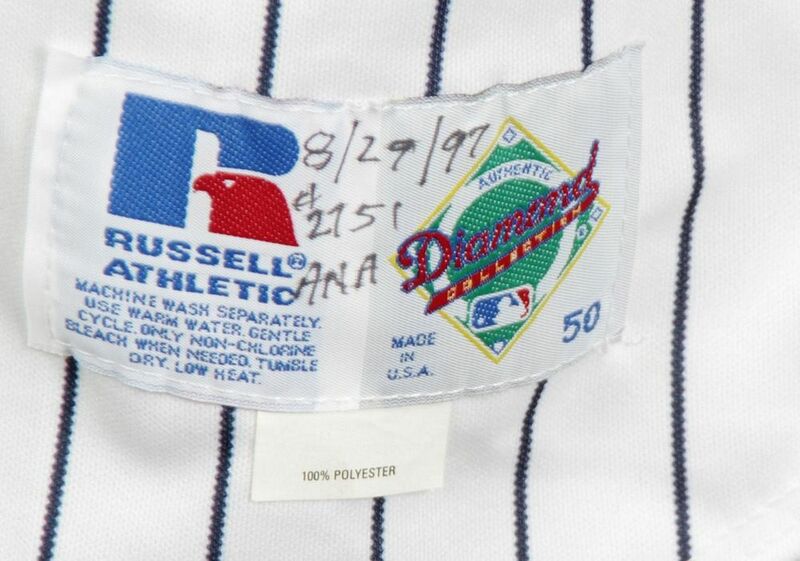 All Star game patch worn in 1978 on all jerseys. 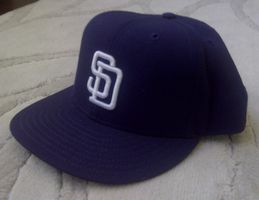 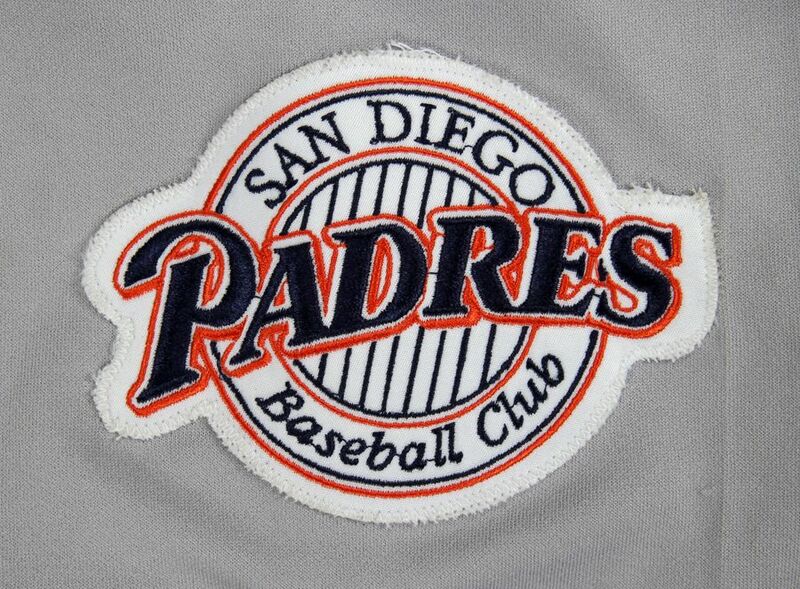 Lettering has been restored here - font is not as thick as the original and San Diego is too high above "padres". 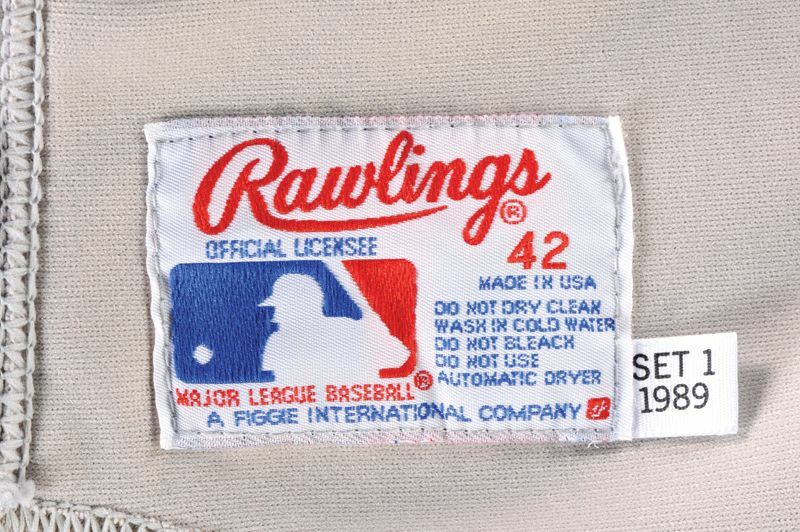 Anyone have an original 1978? 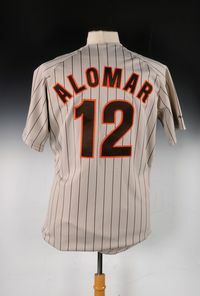 Yet another one year look; same jersey, different front lettering. 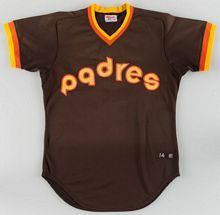 This team's jersey design budget is larger than the GDP of several nations. 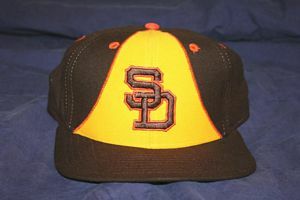 Orange added to the colorway, including orange vents on the taco bell cap. 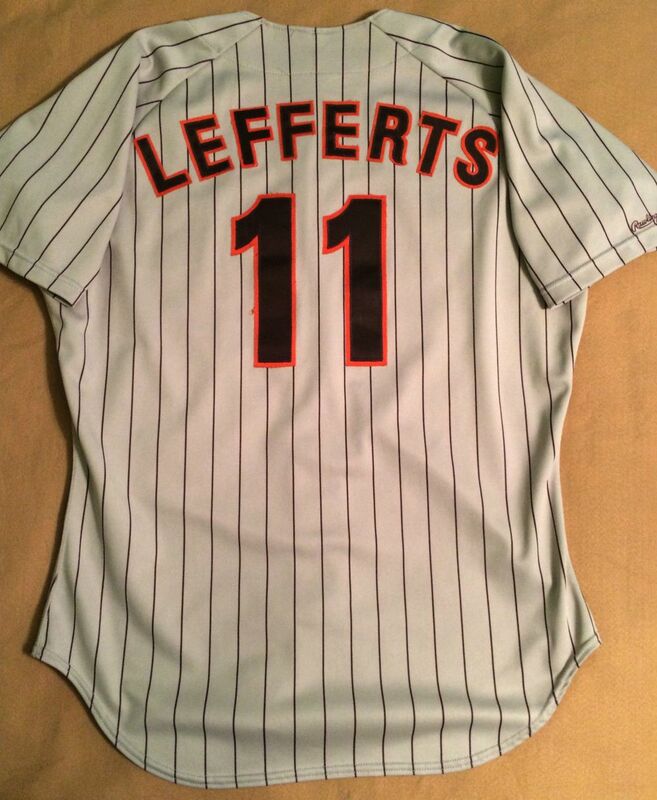 It's been a few years, time to change the jerseys. 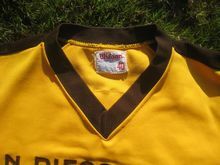 Mustard is dropped. 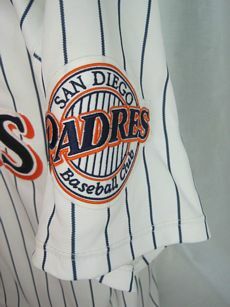 Road jerseys add the latest trend, pinstripes. 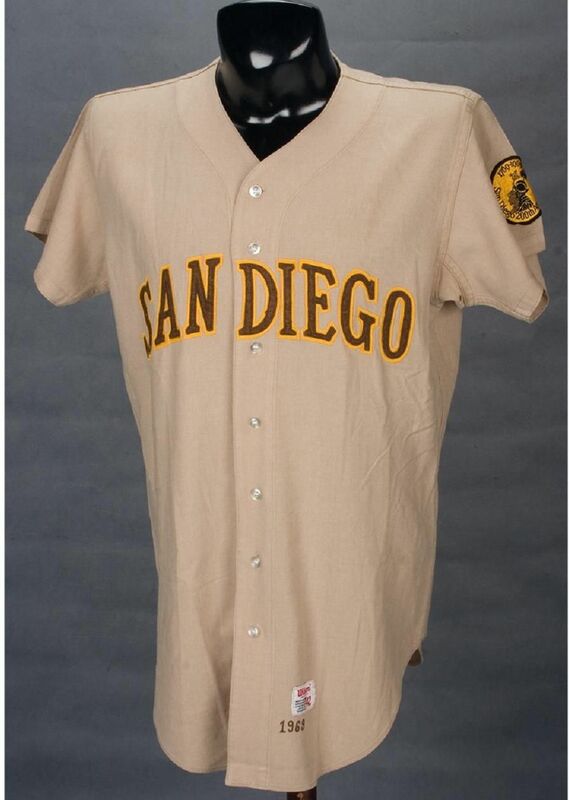 The continually evolving Padres.... brown is dropped in favor of navy. Road jersey redesigned. All Star game patch worn in 1992. 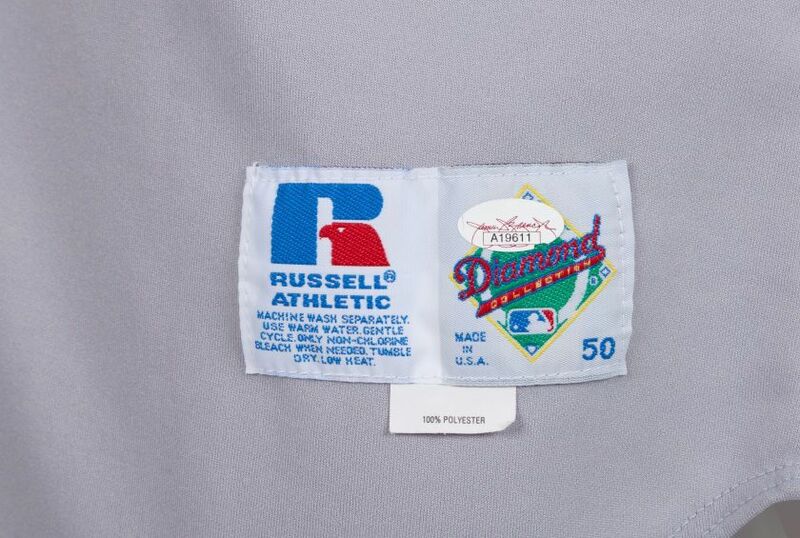 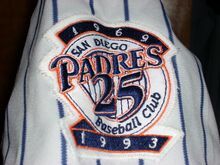 25th anniversary sleeve patch worn in 1993. 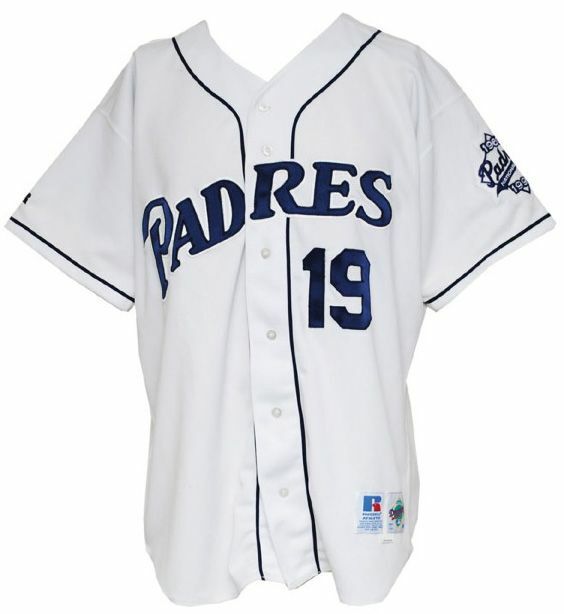 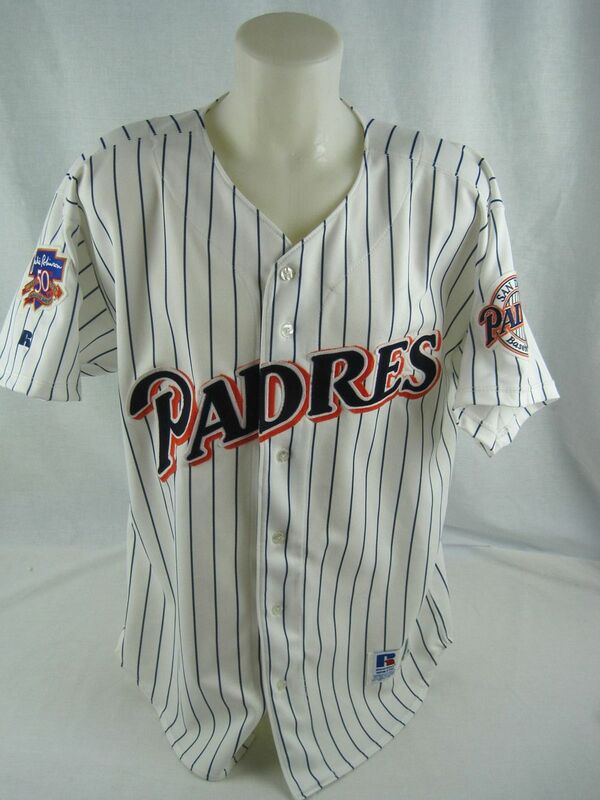 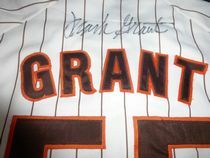 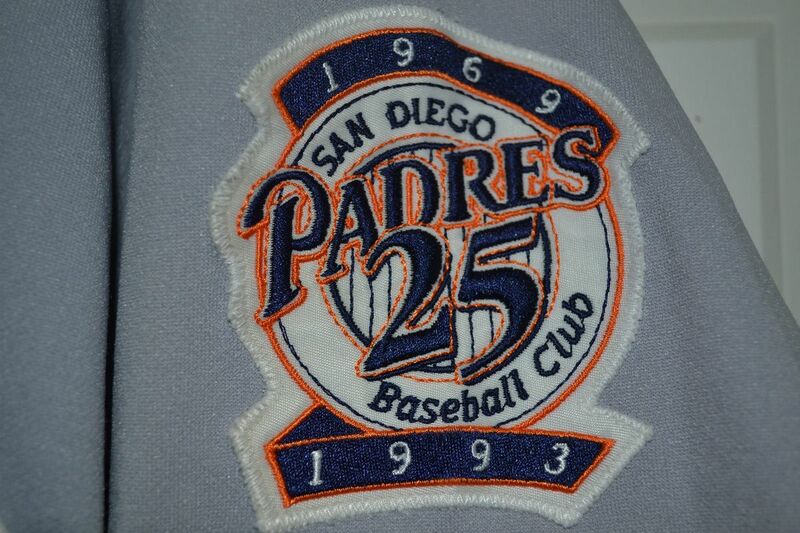 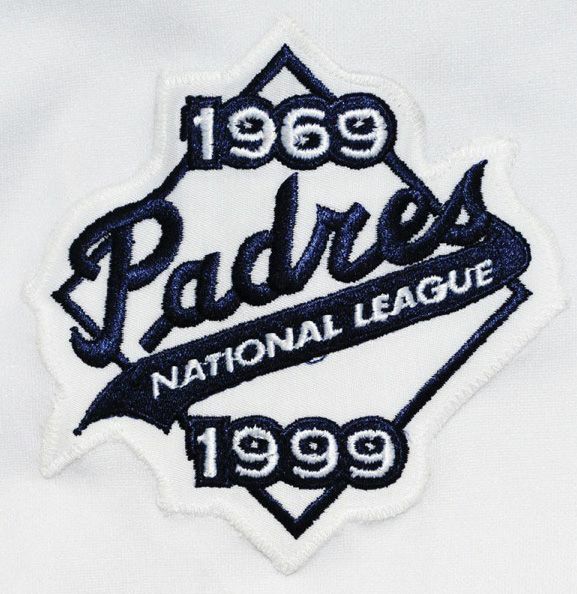 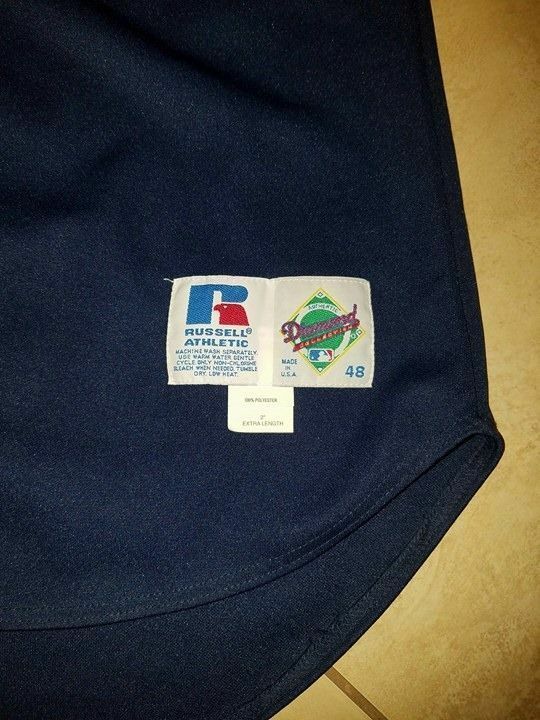 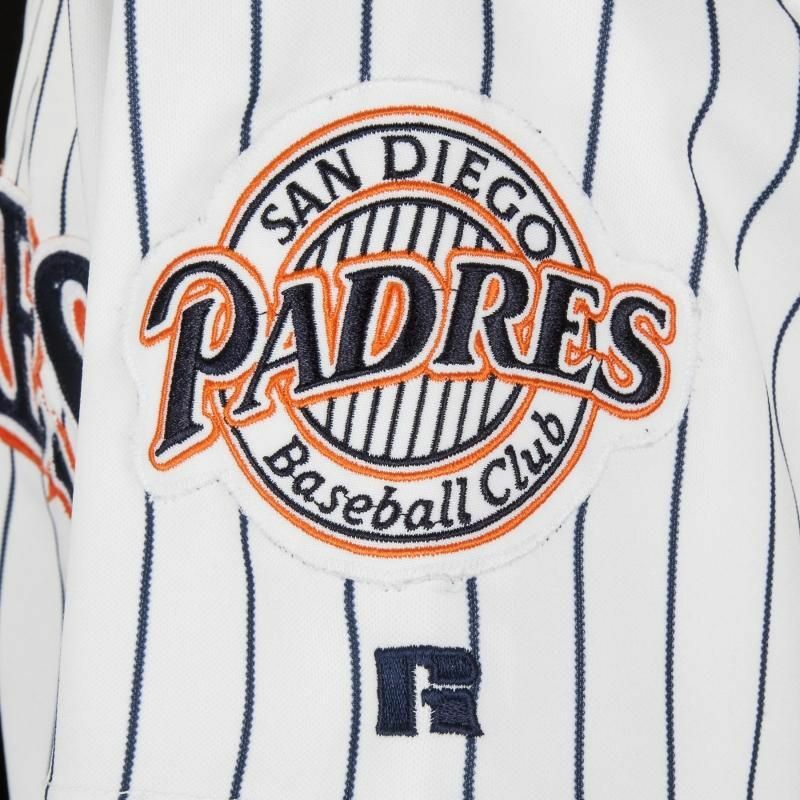 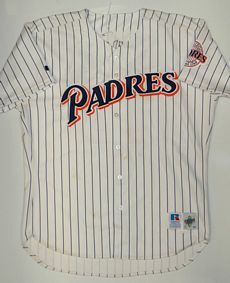 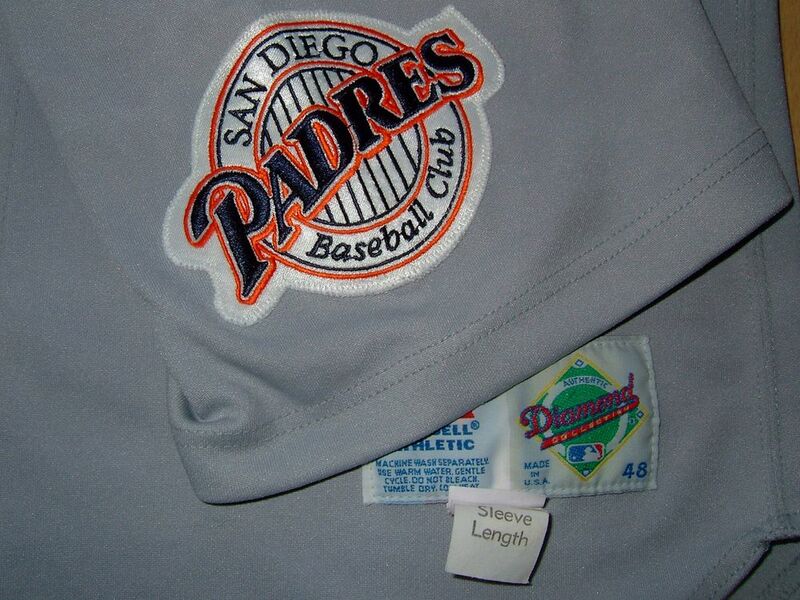 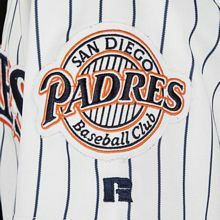 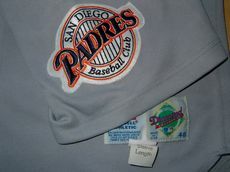 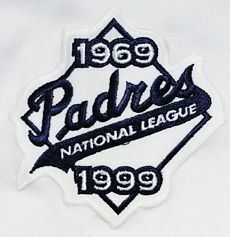 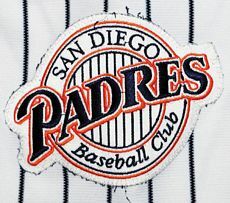 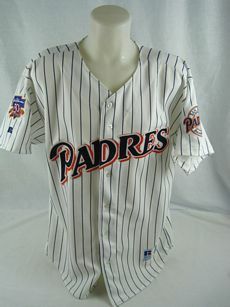 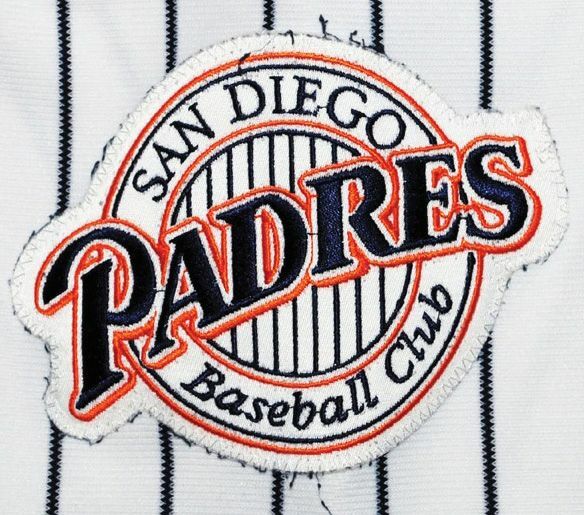 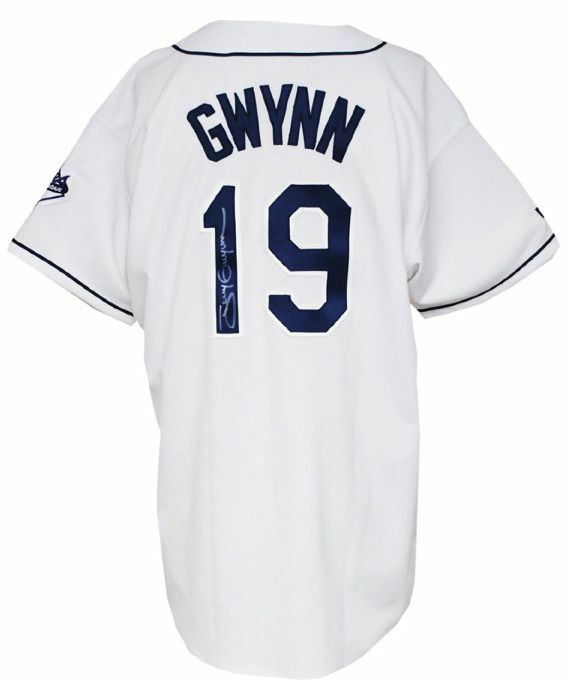 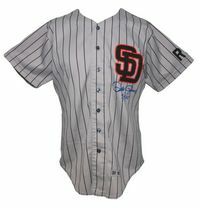 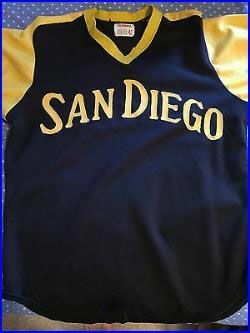 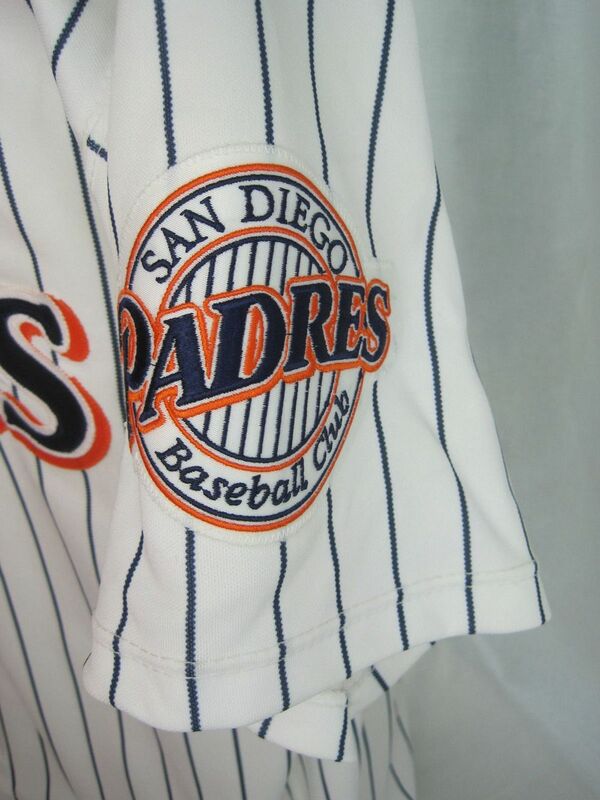 Padres sleeve patch added in 1994. 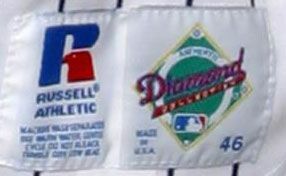 MLB 125th anniversary patch worn in 1994. 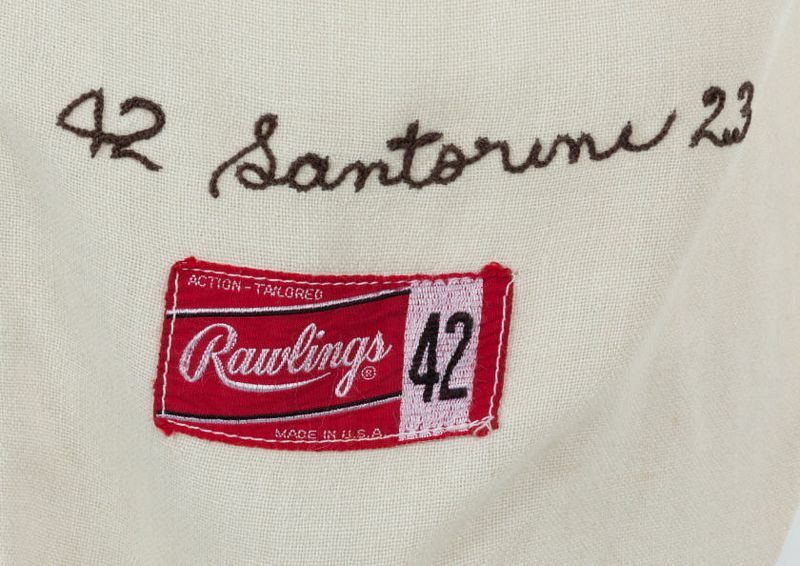 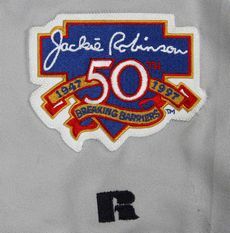 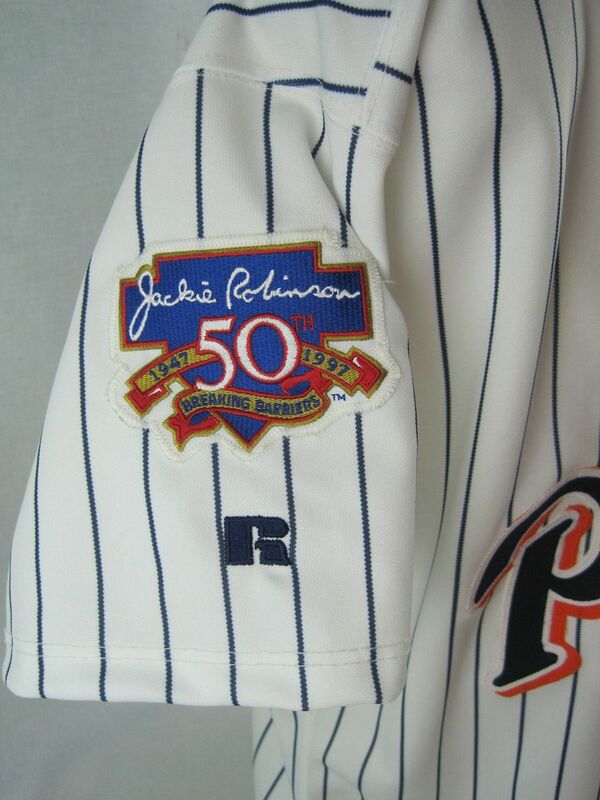 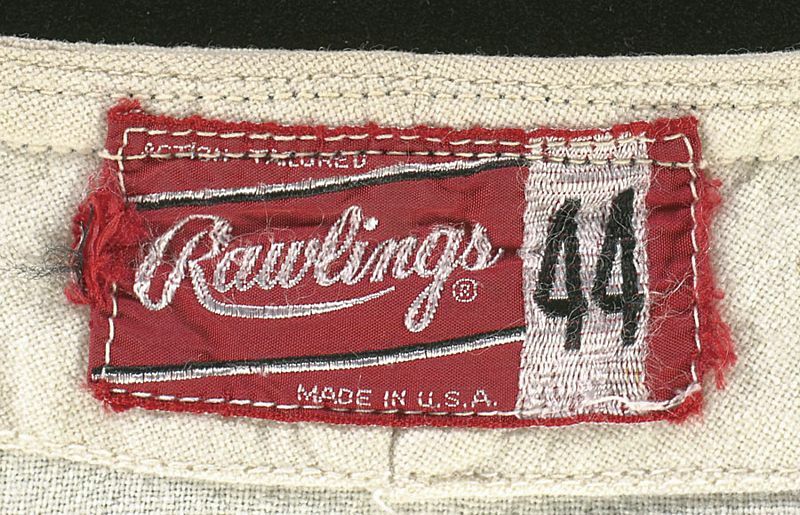 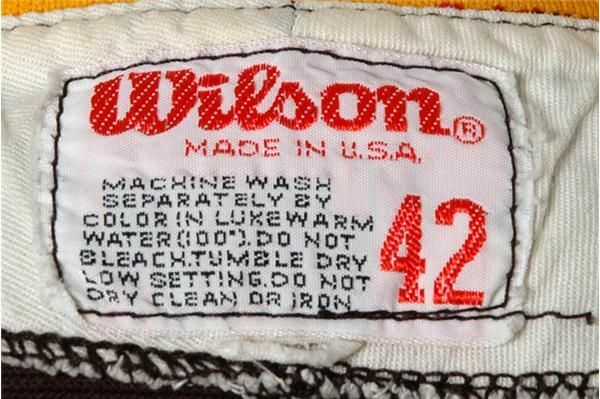 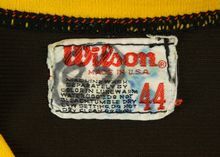 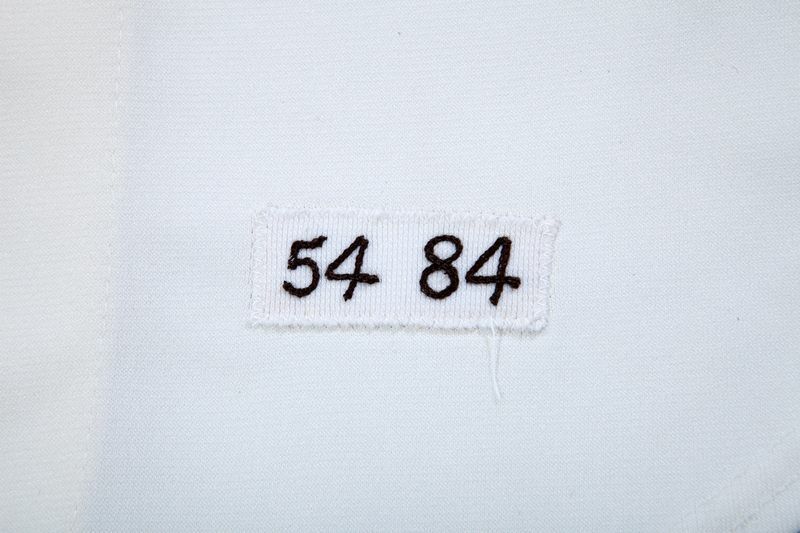 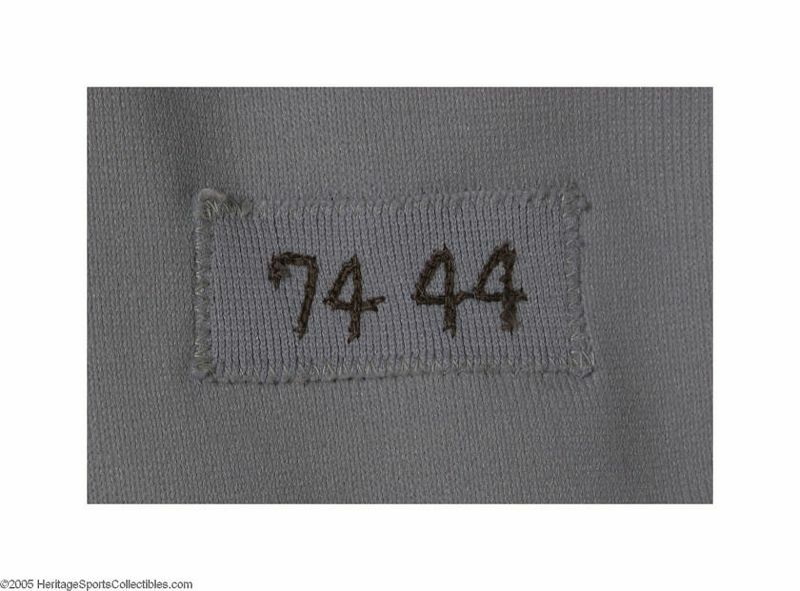 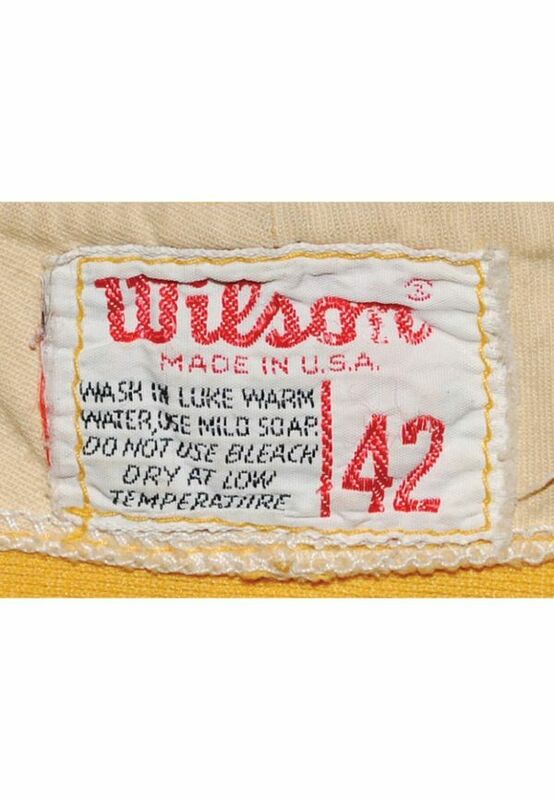 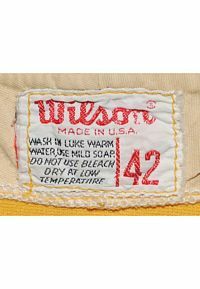 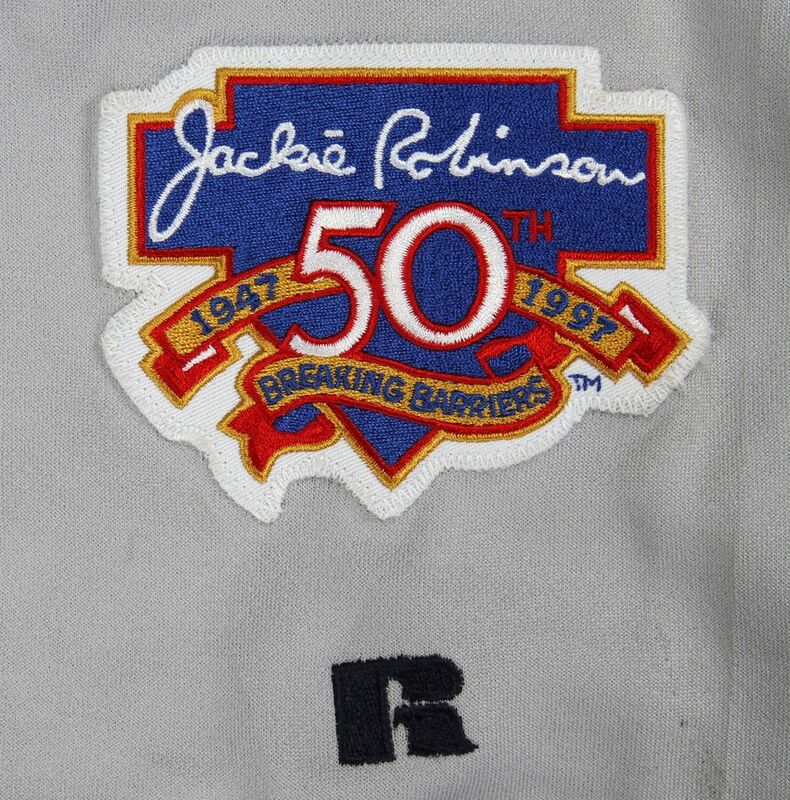 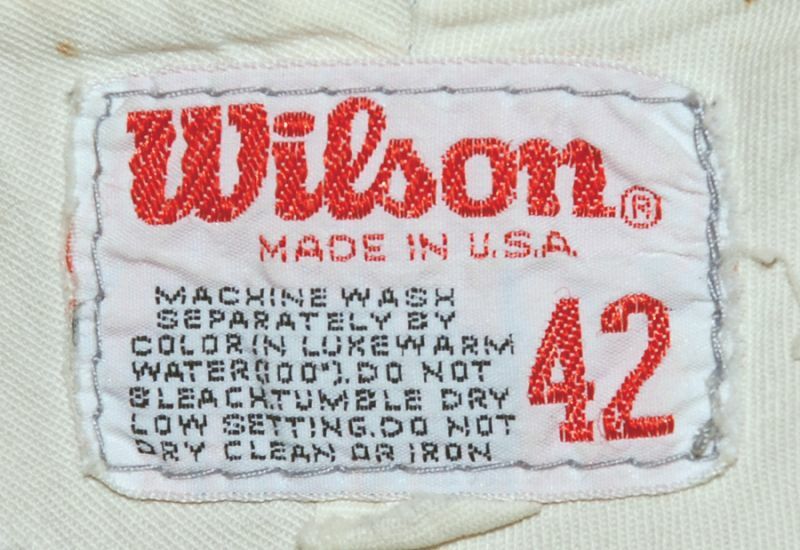 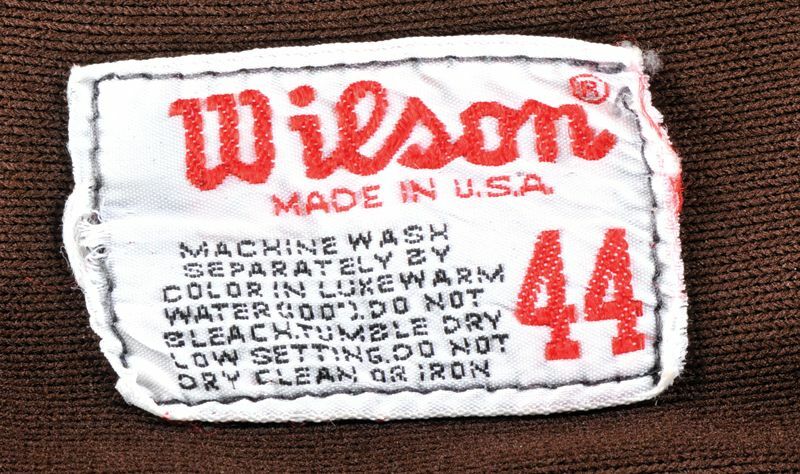 Jackie Robinson sleeve patch worn in 1997. 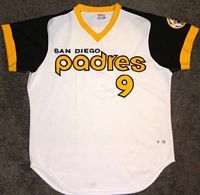 All-white alternate home jersey (anybody have one?) 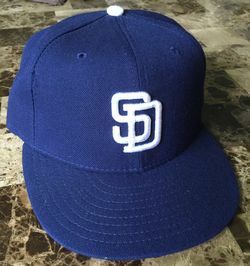 joins the set with an all-blue cap. 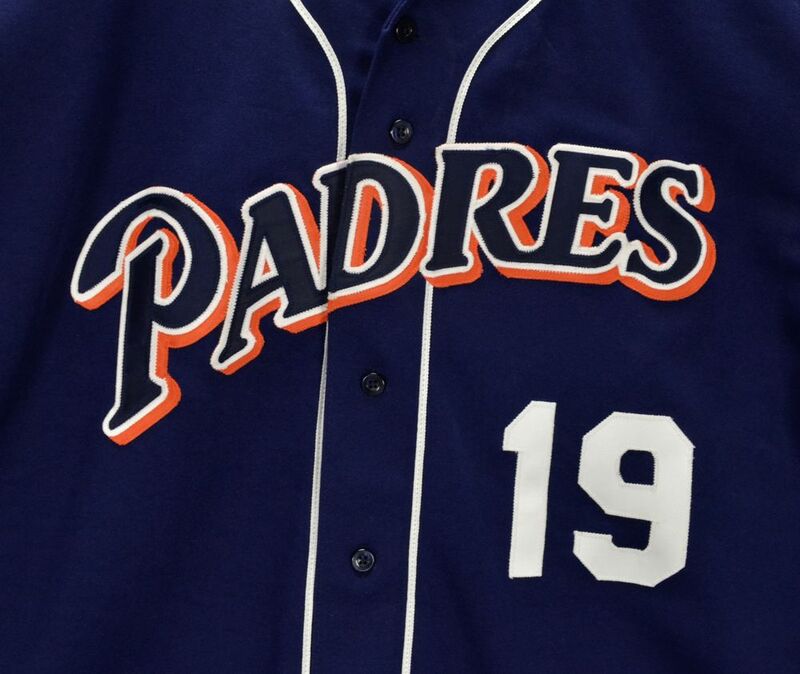 Front number added to alternate navy jersey. 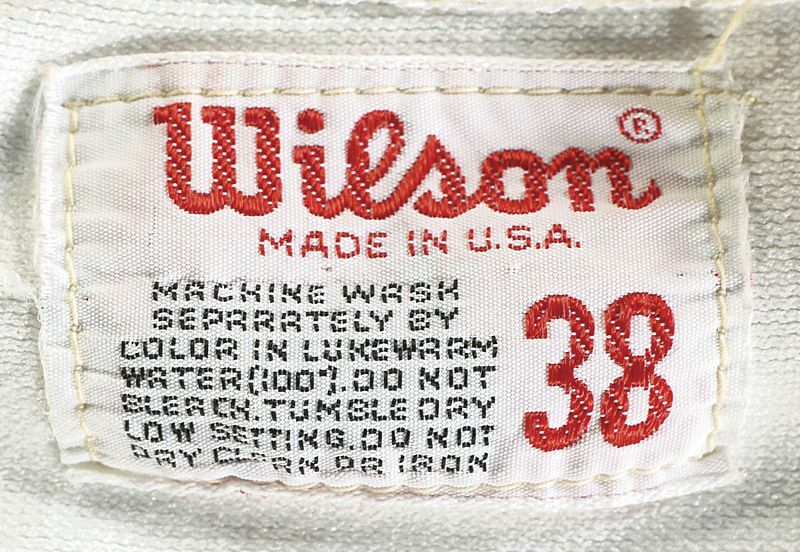 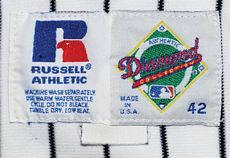 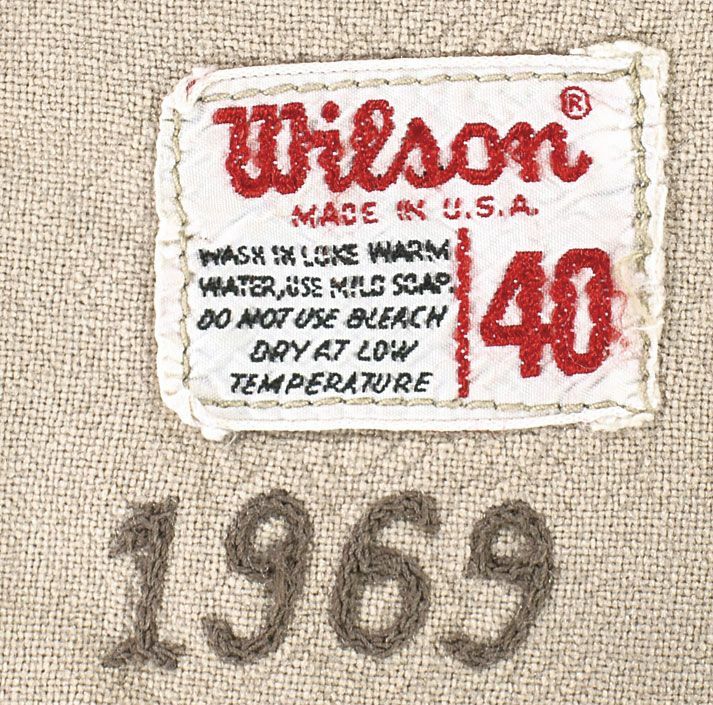 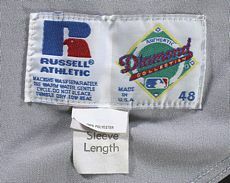 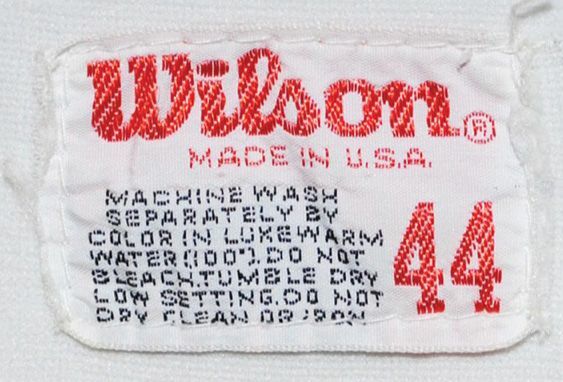 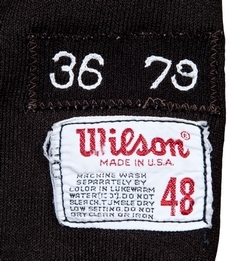 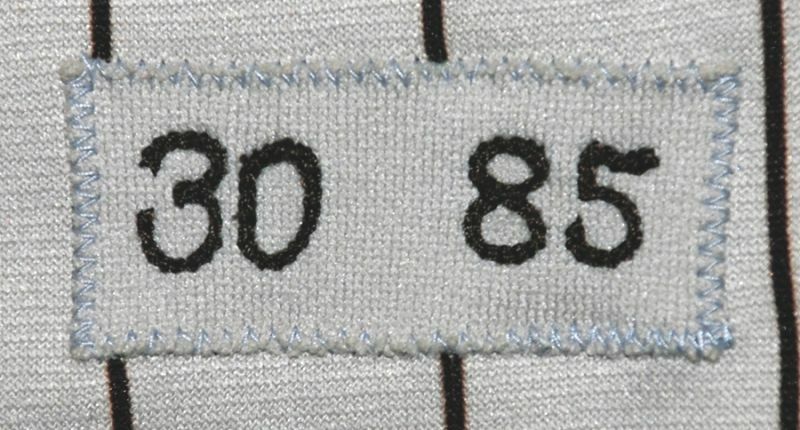 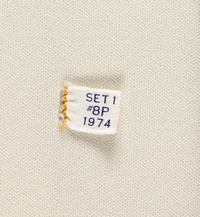 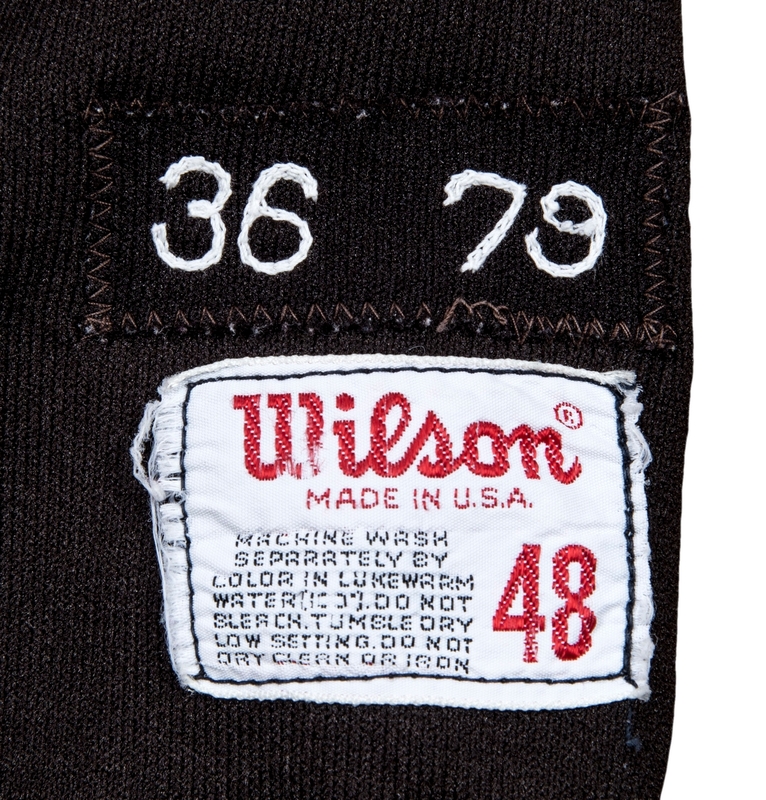 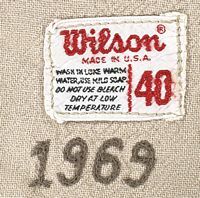 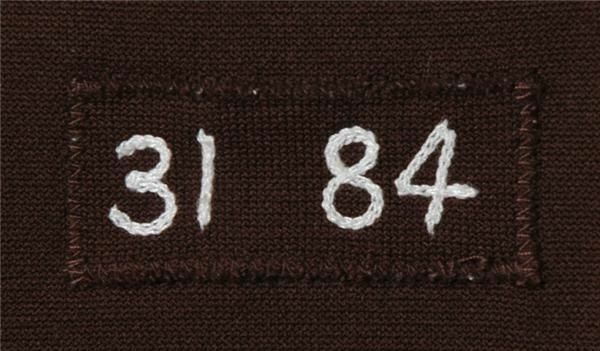 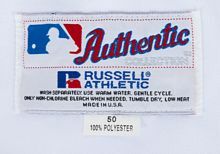 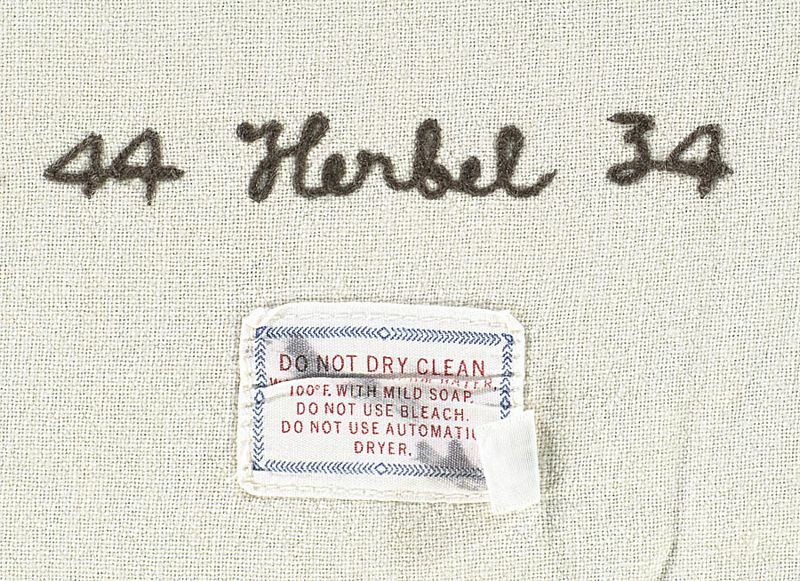 Sleeve patches replaced by 30th anniversary patchf for 1999. 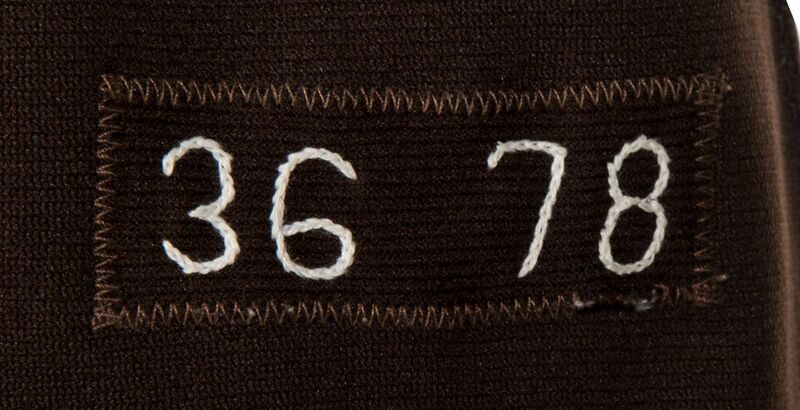 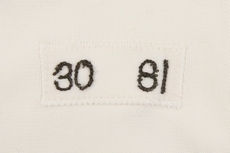 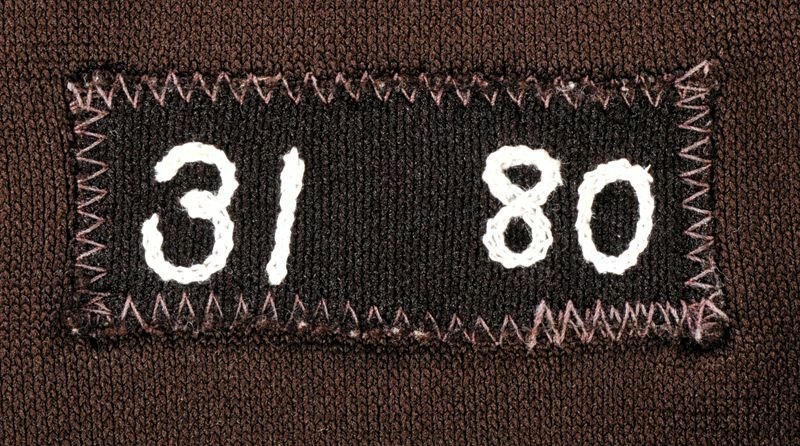 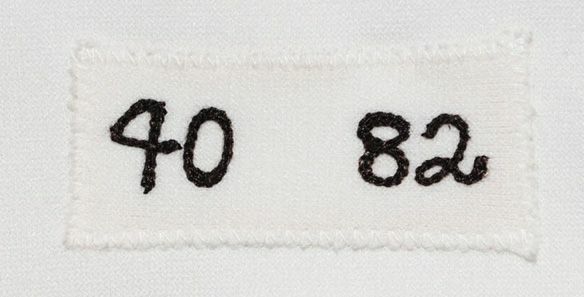 Sleeve patches return to pre-99 look. 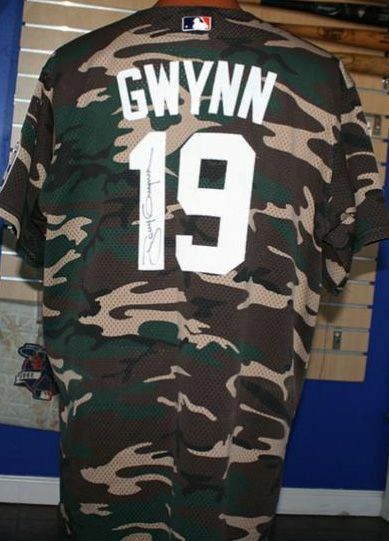 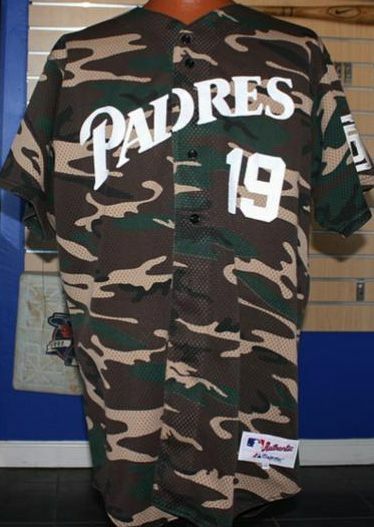 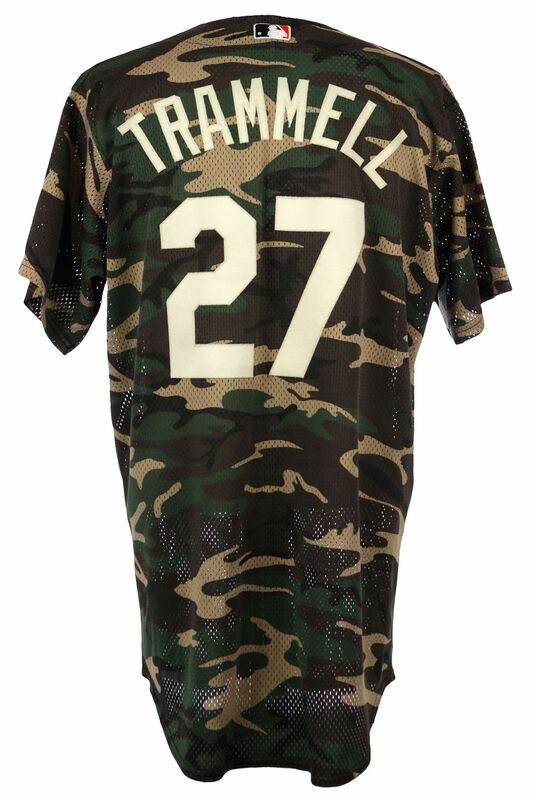 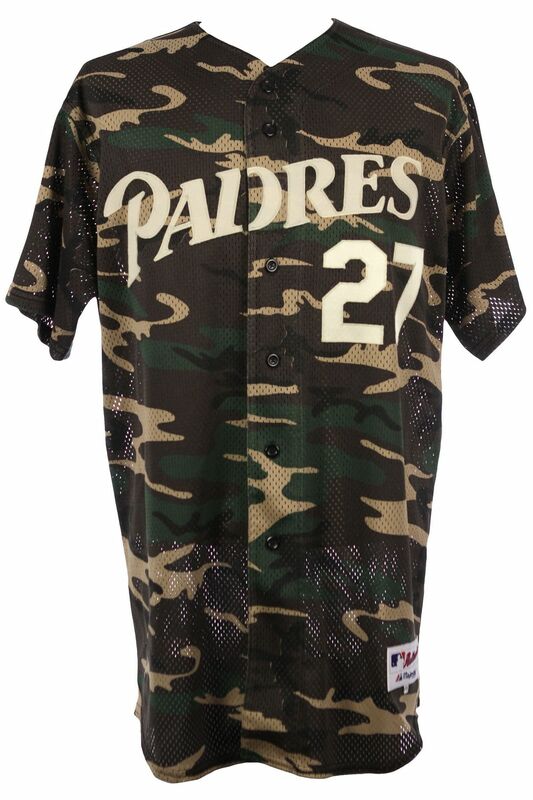 The Padres start the camo look for military appreciation days, which eventually becomes part of the official set, so we'll show their evolution here. Button on home alternate cap changed to blue from white. 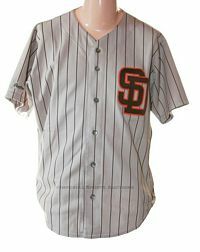 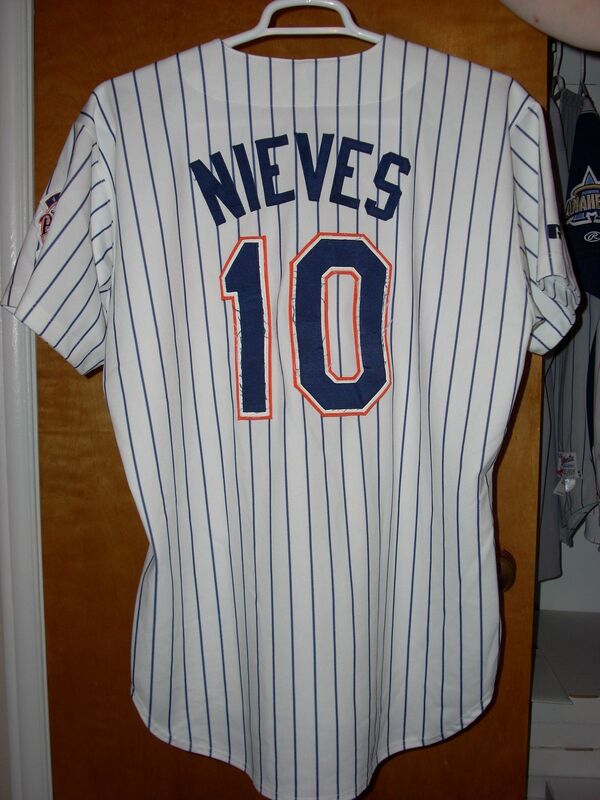 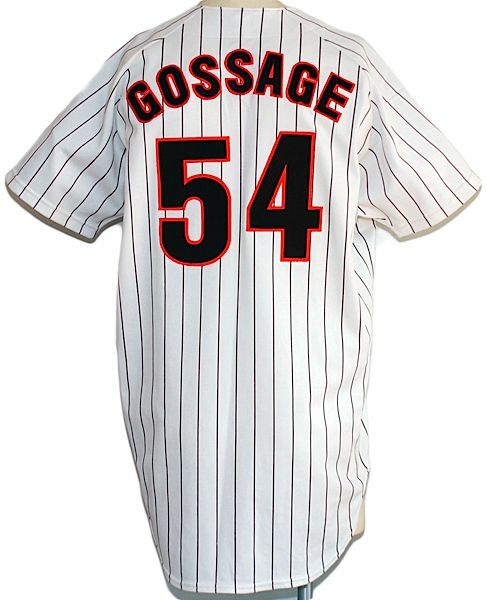 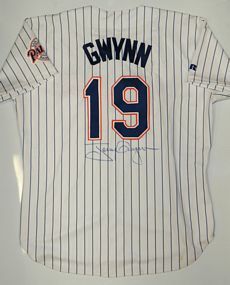 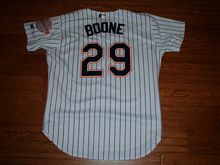 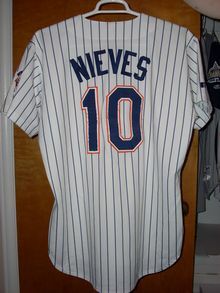 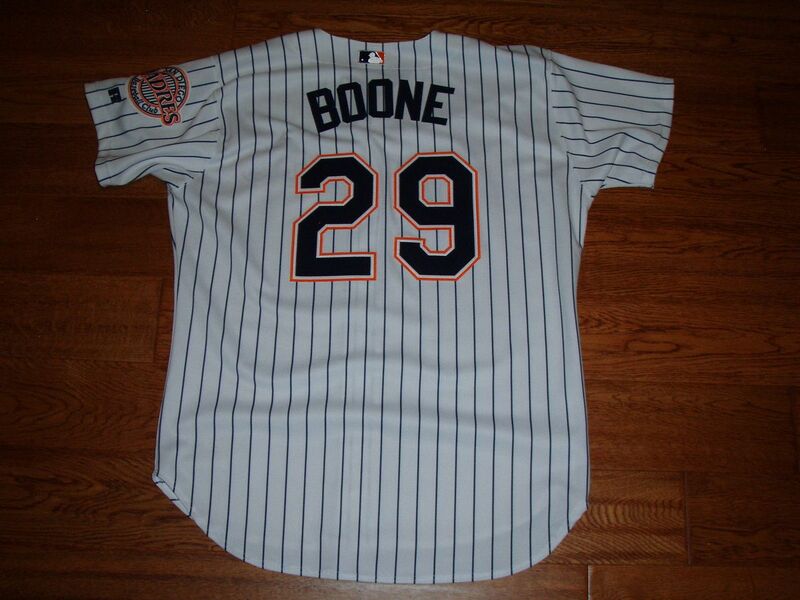 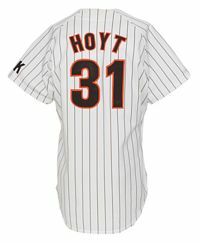 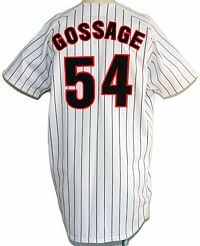 All-white jersey becomes the main home jersey, and the pinstriped jersey the home alternate.